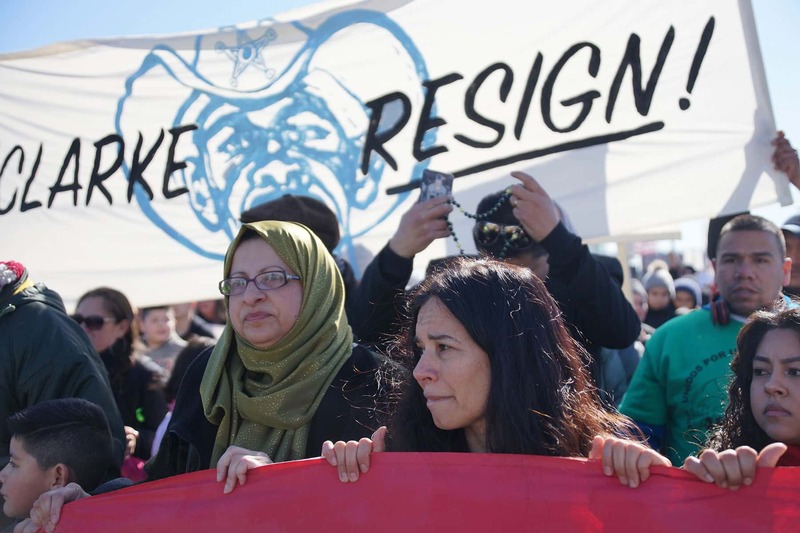 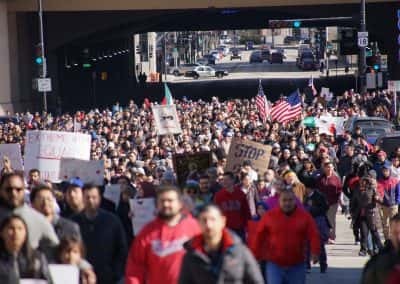 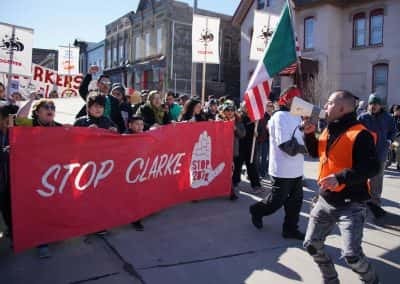 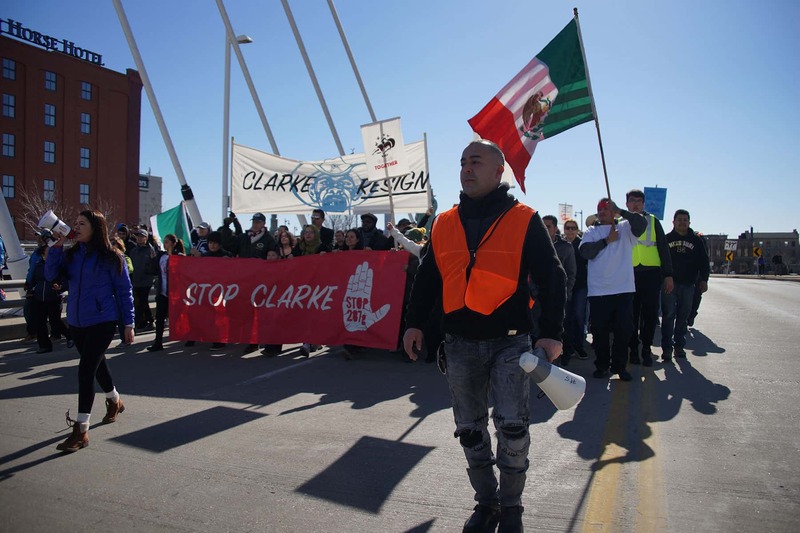 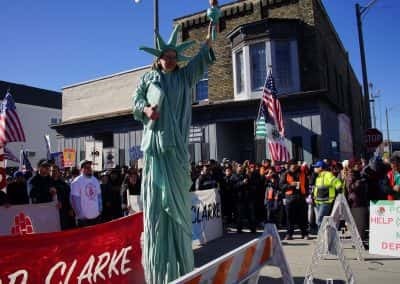 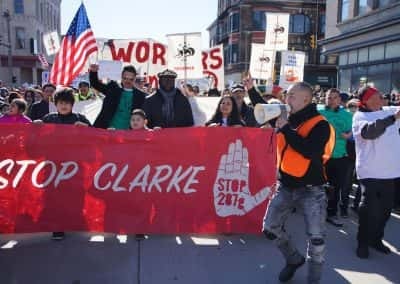 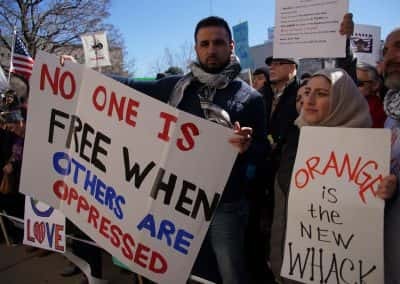 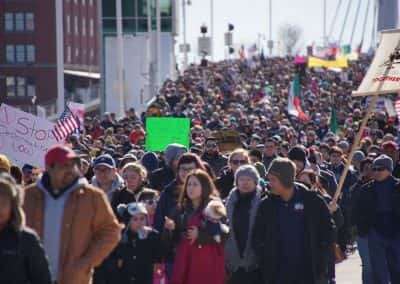 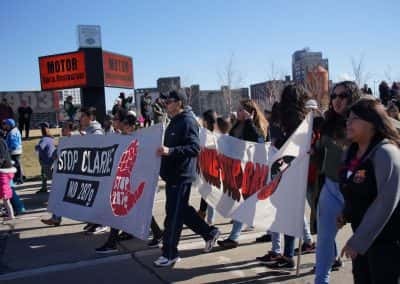 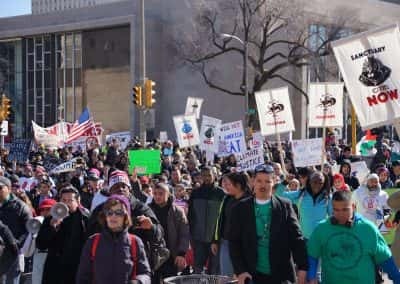 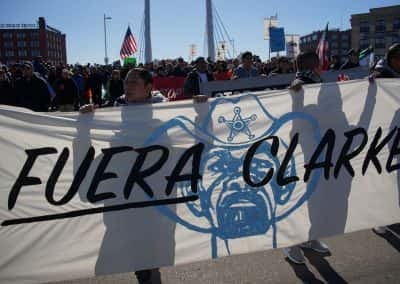 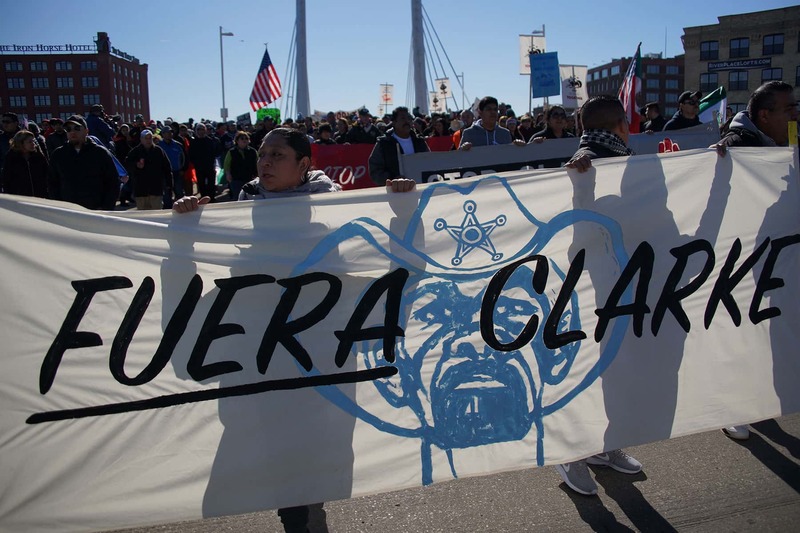 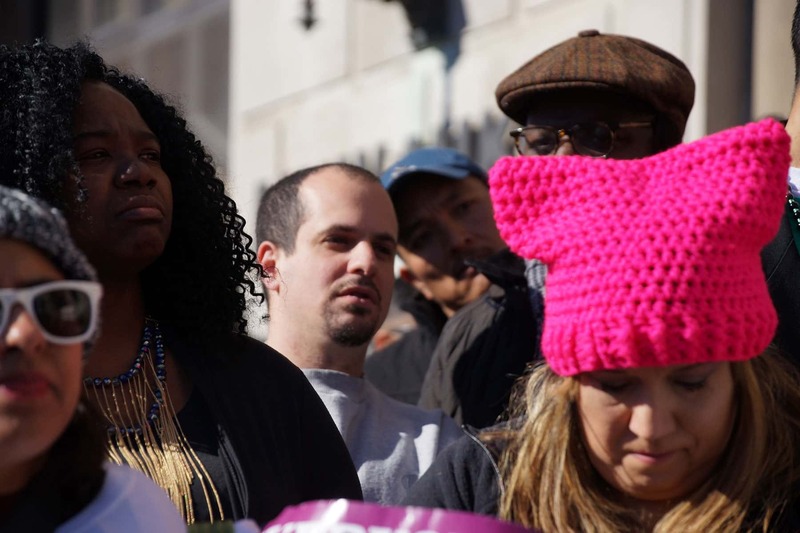 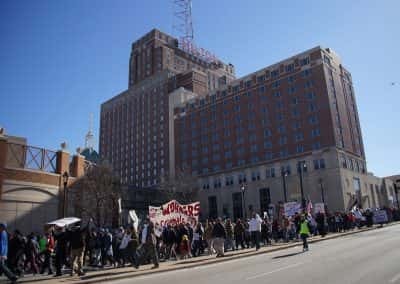 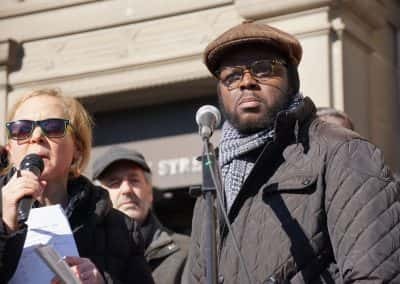 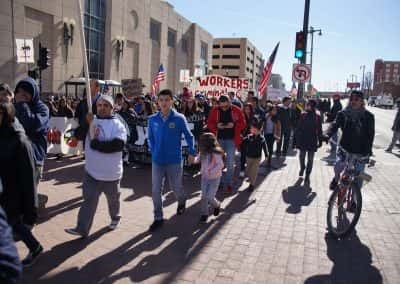 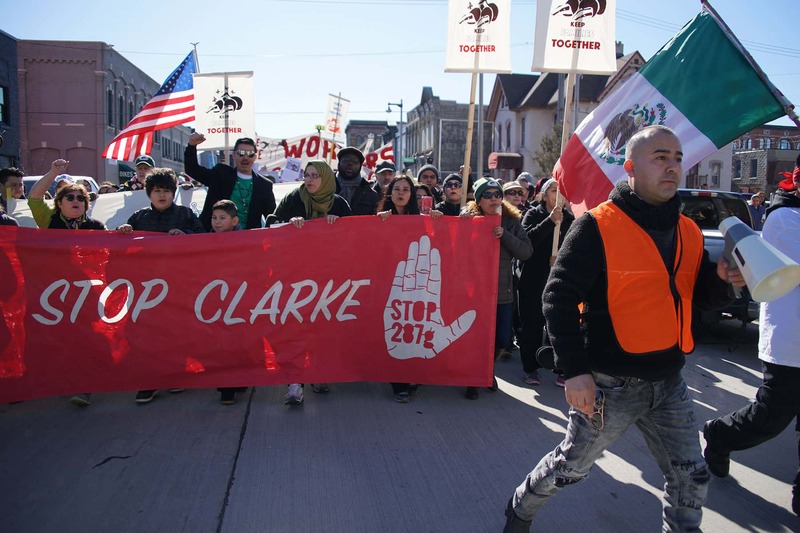 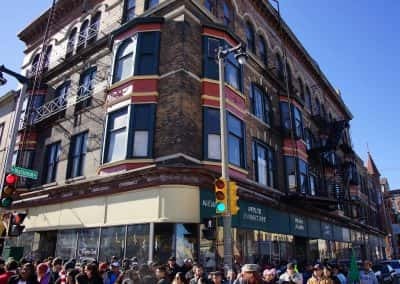 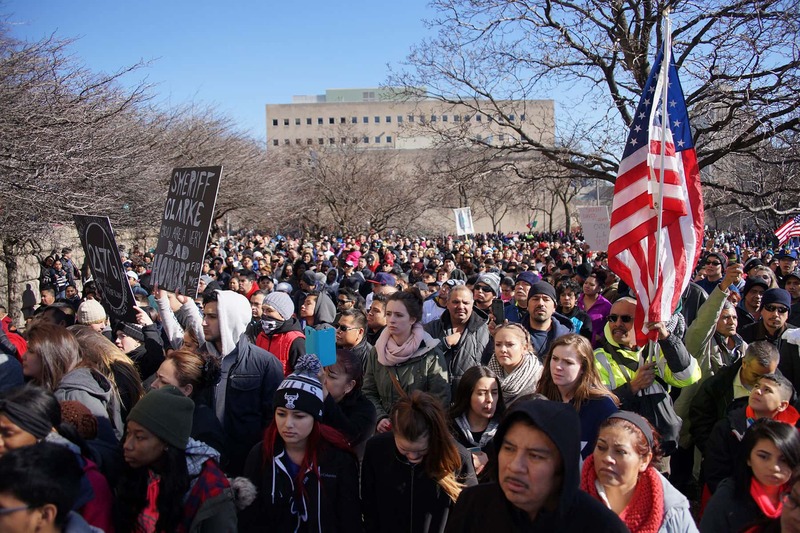 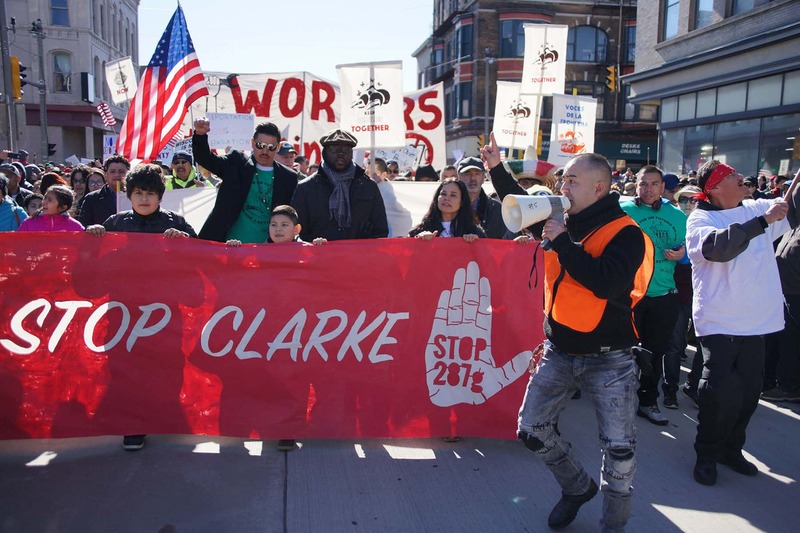 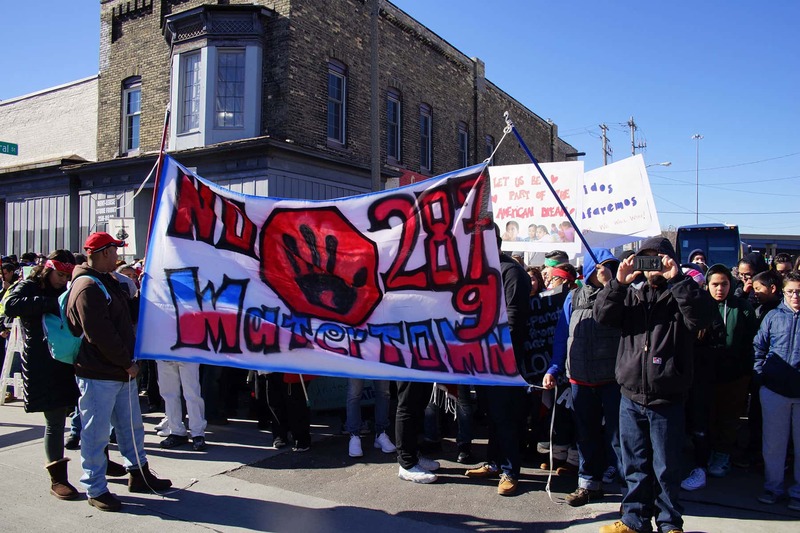 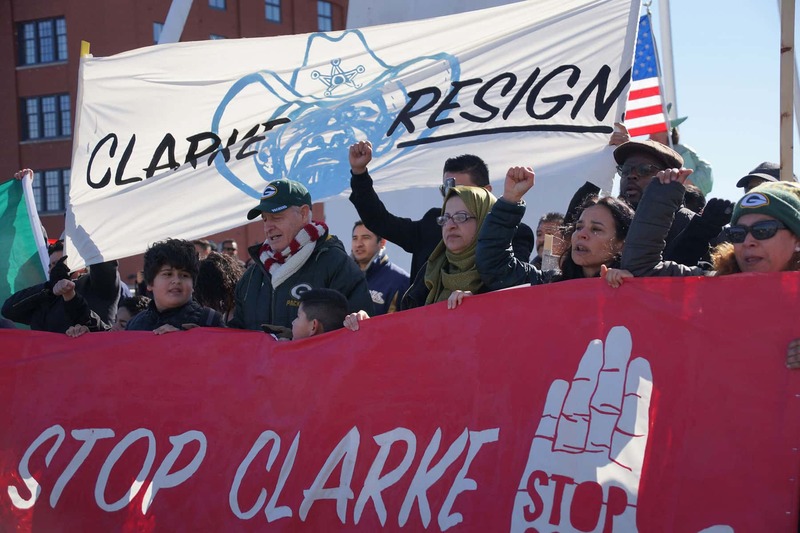 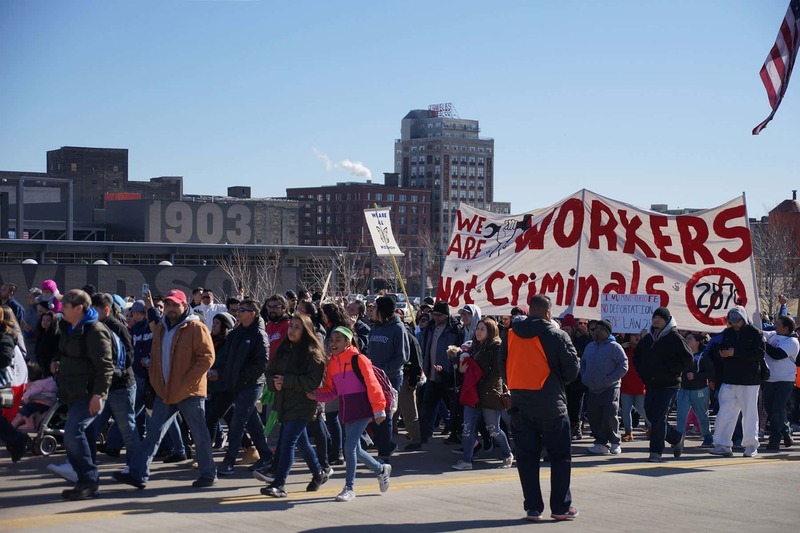 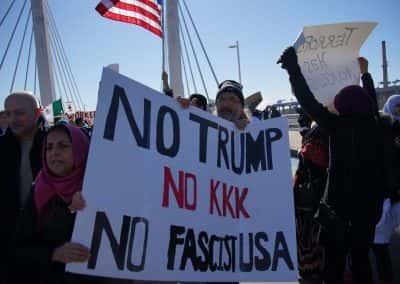 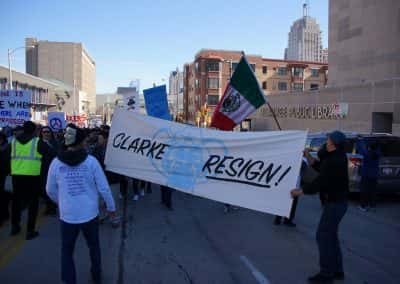 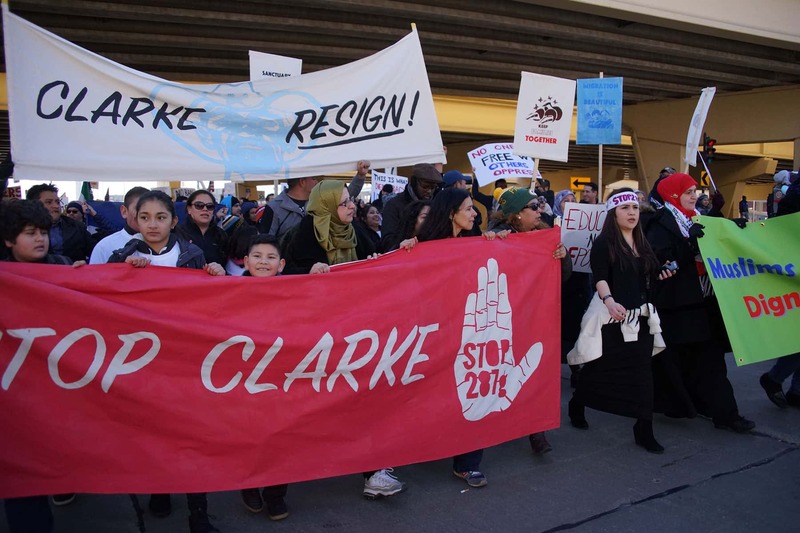 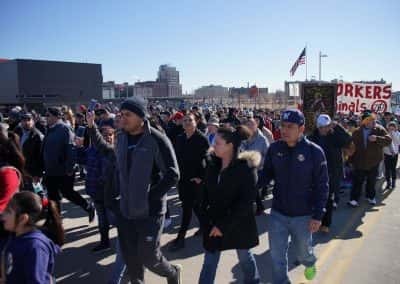 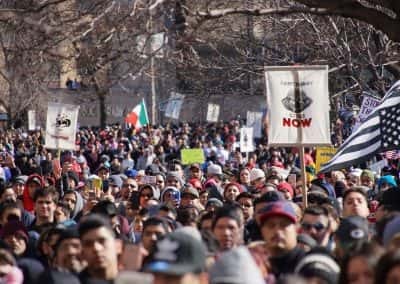 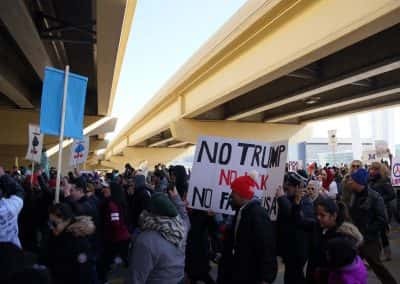 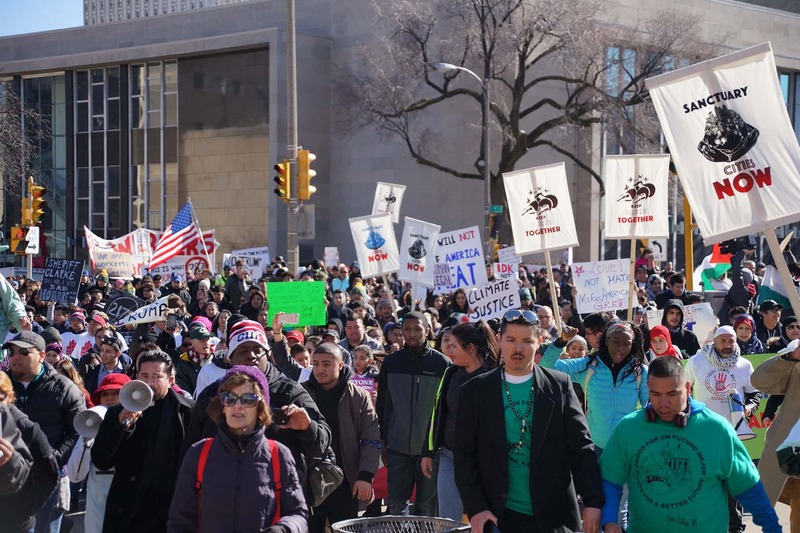 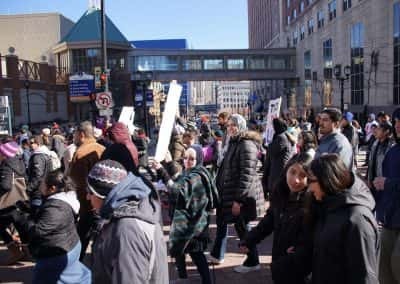 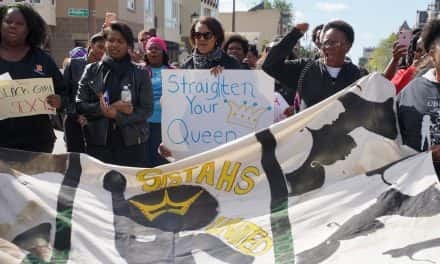 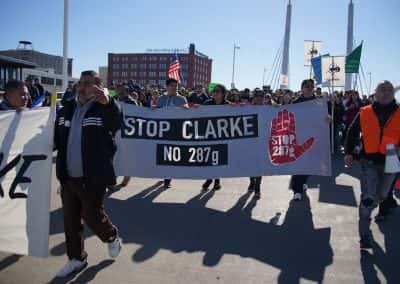 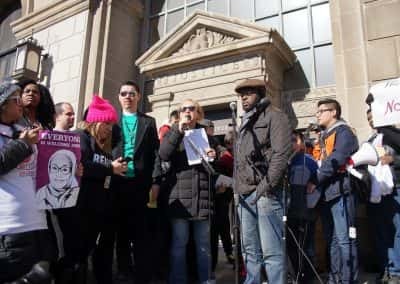 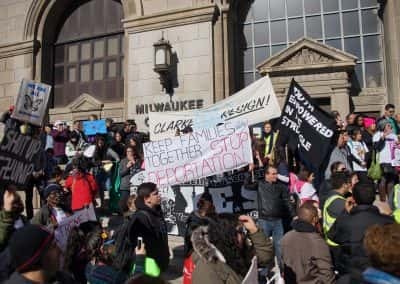 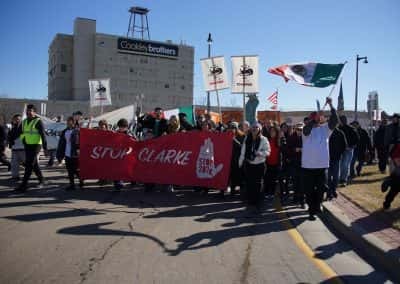 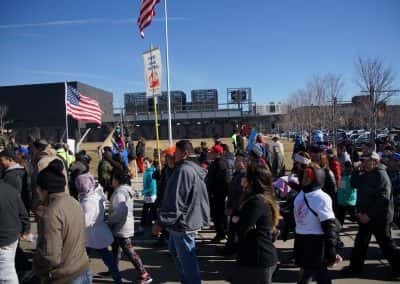 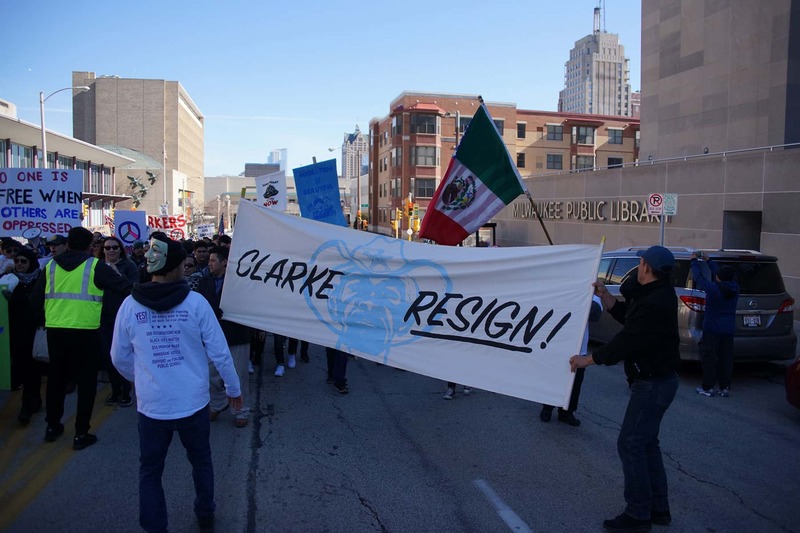 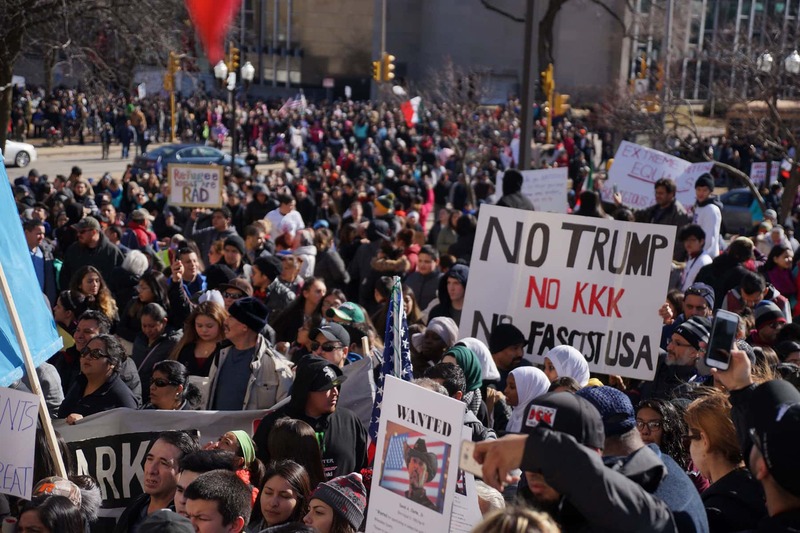 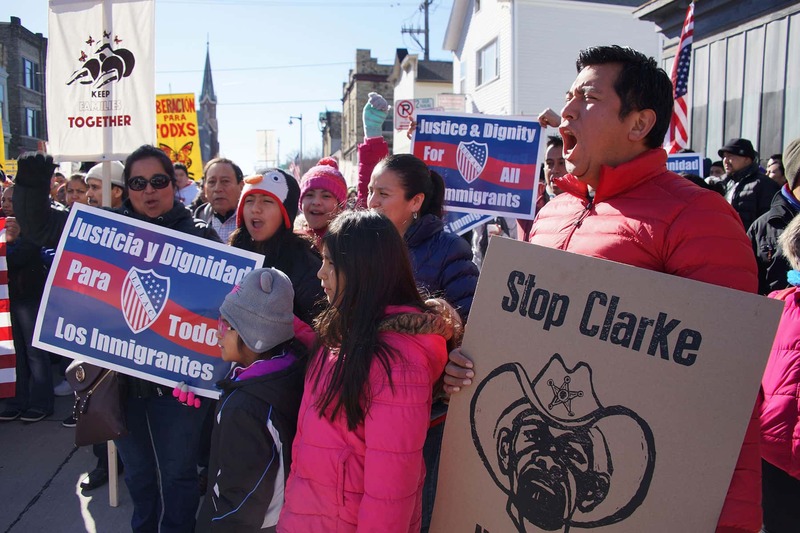 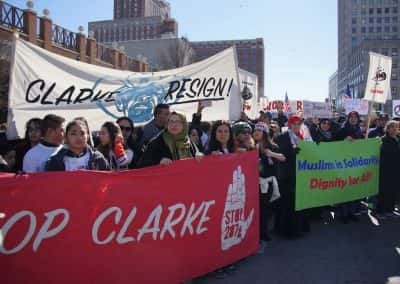 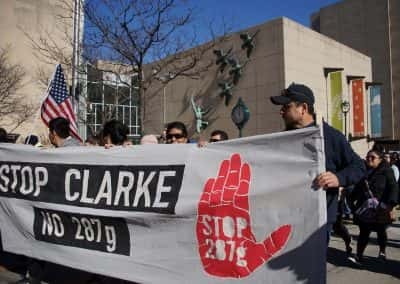 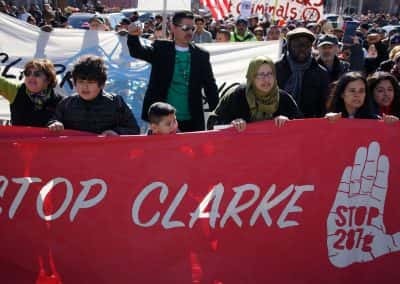 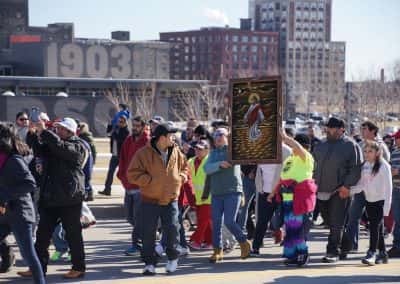 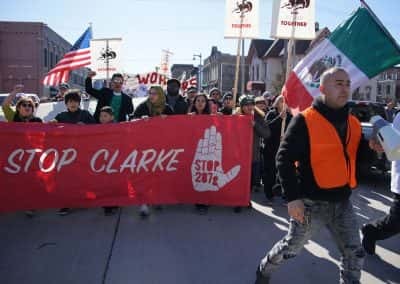 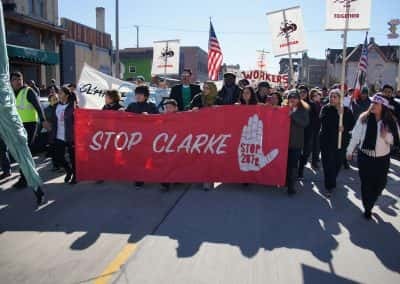 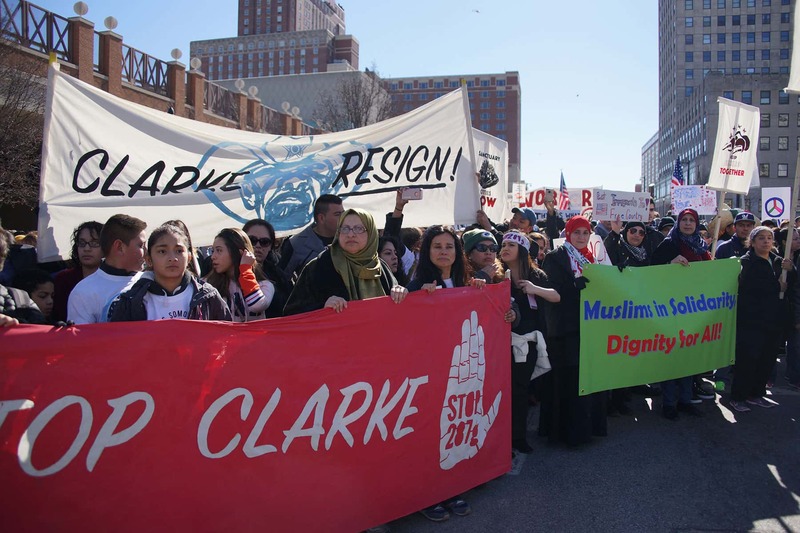 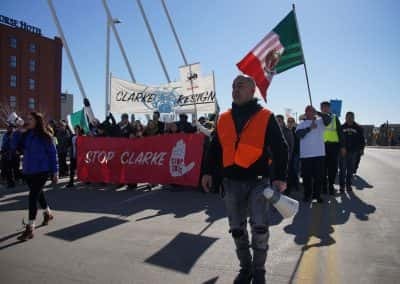 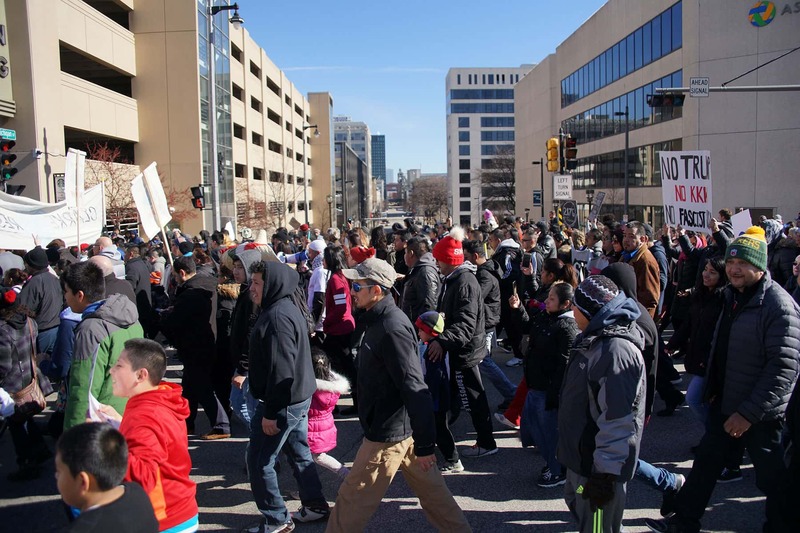 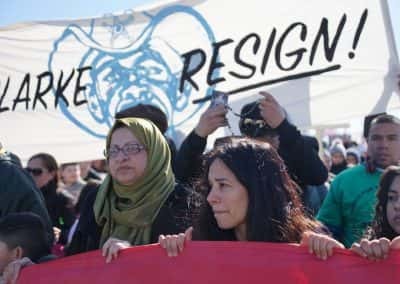 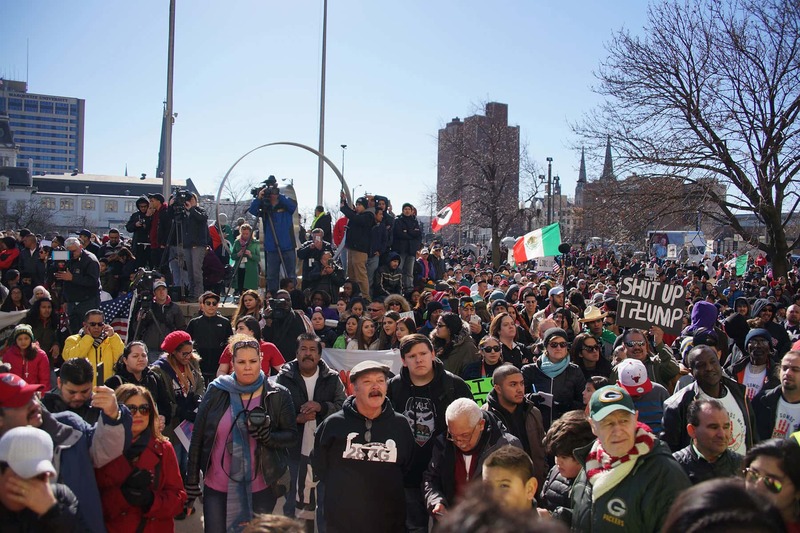 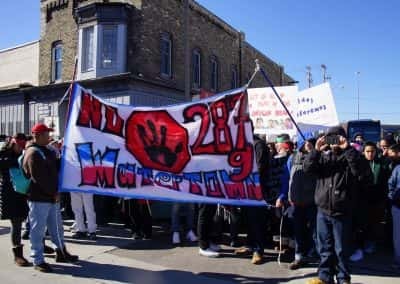 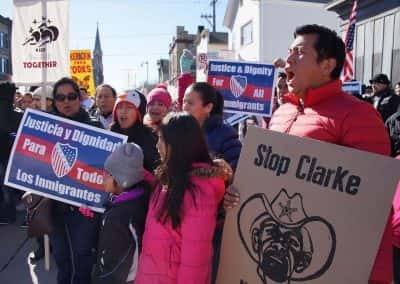 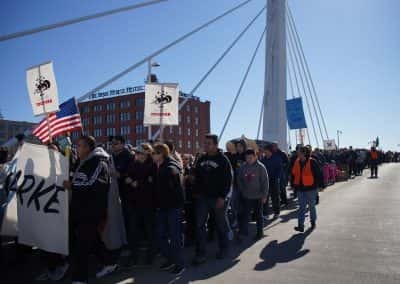 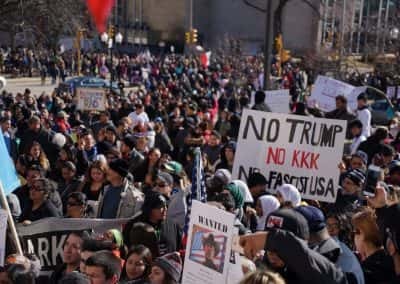 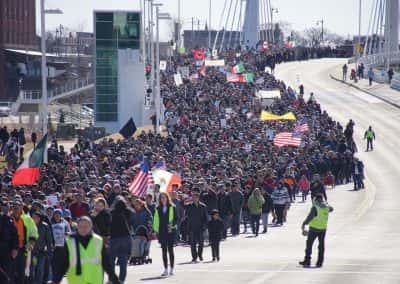 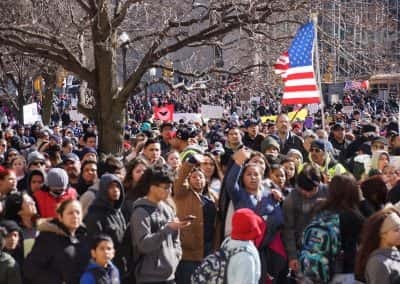 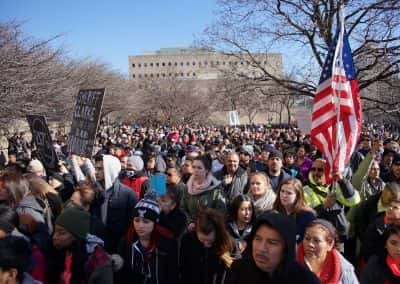 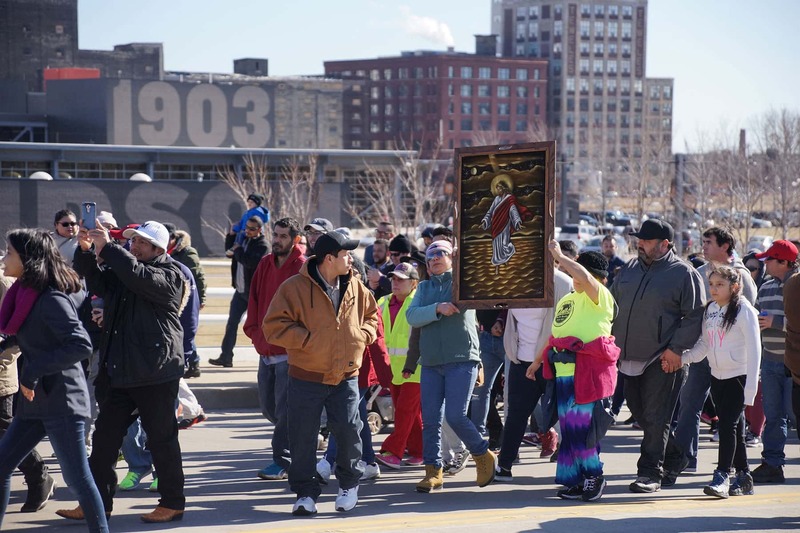 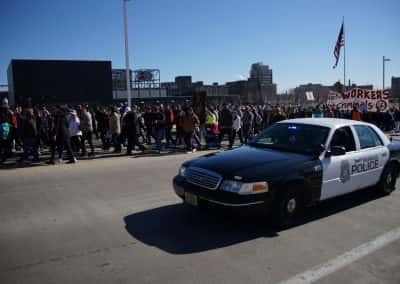 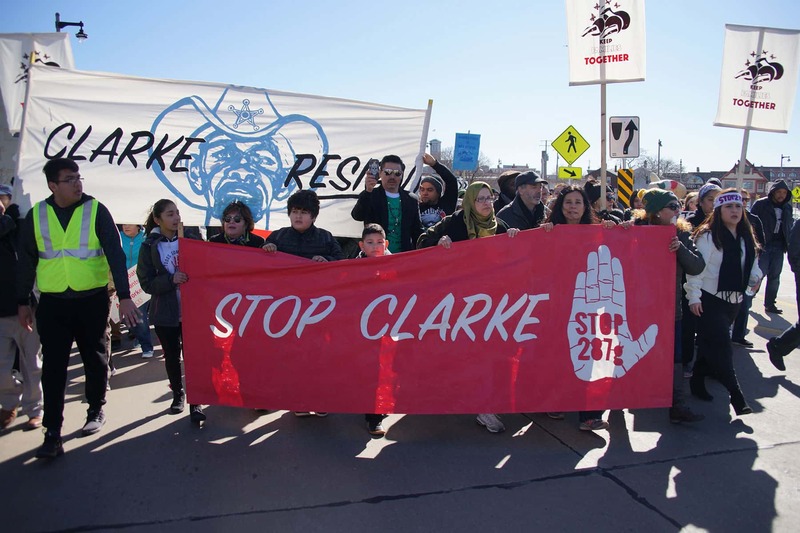 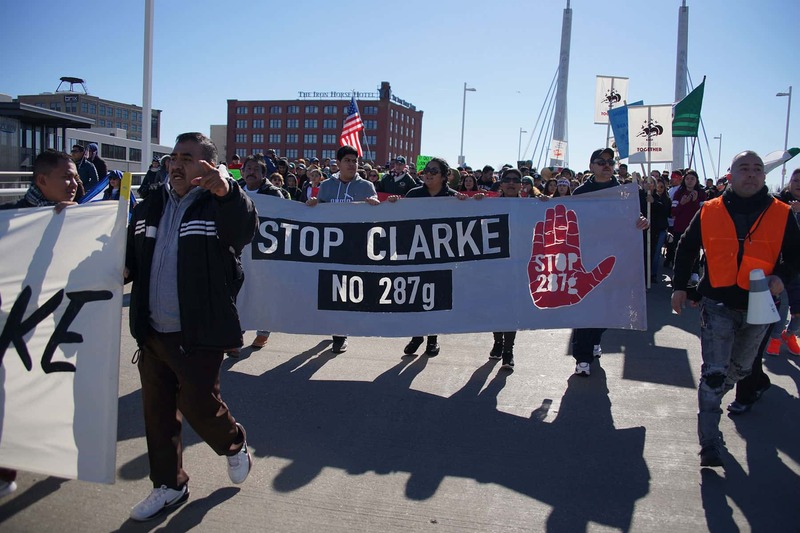 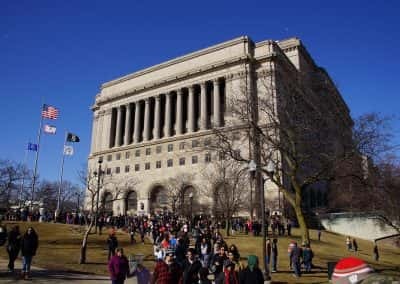 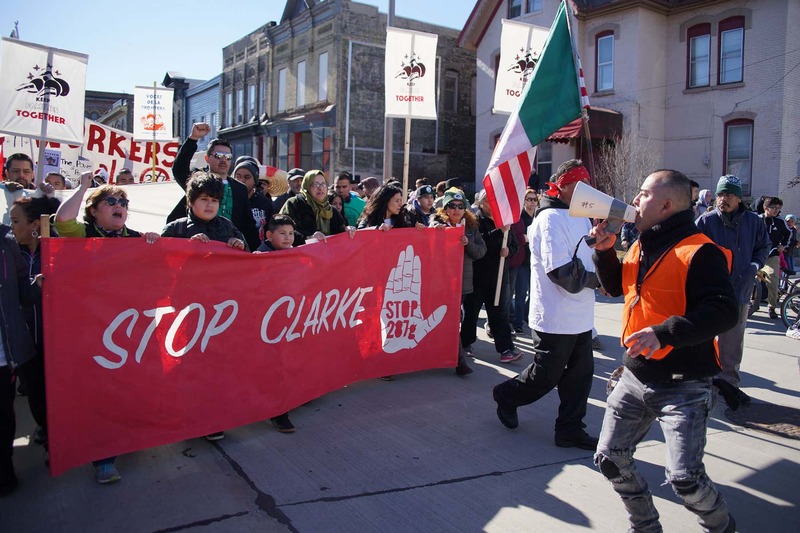 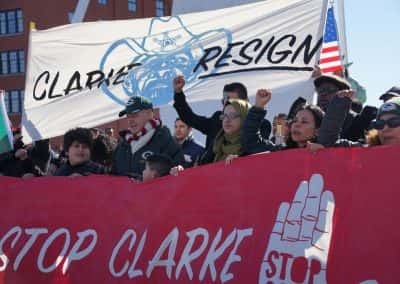 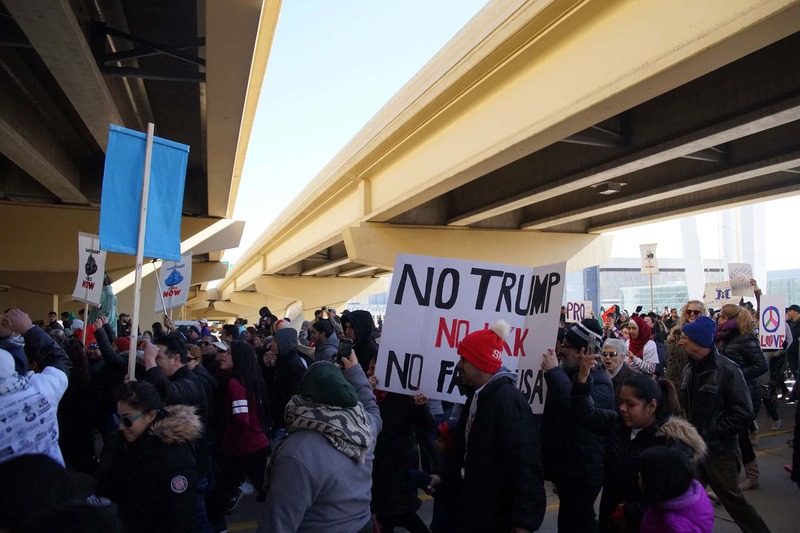 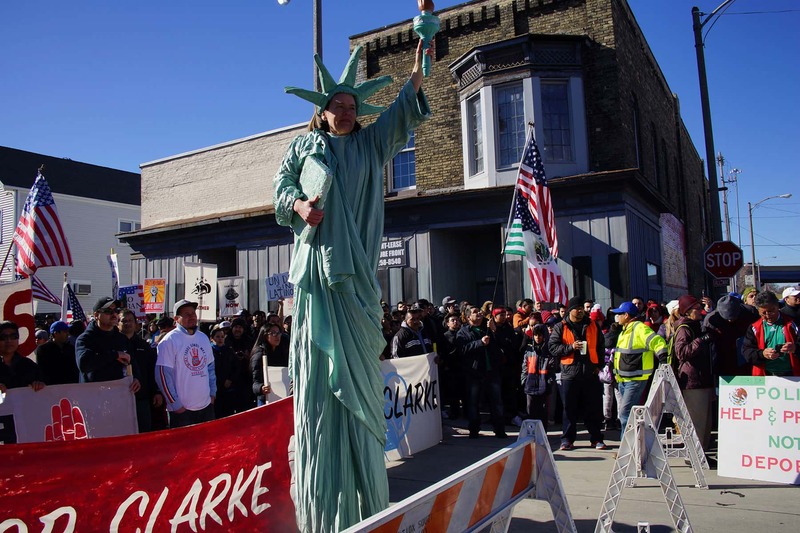 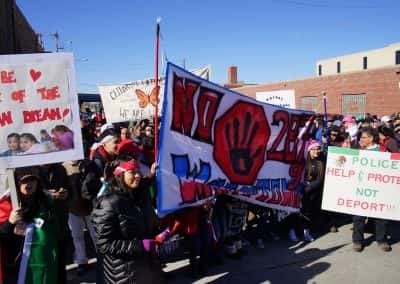 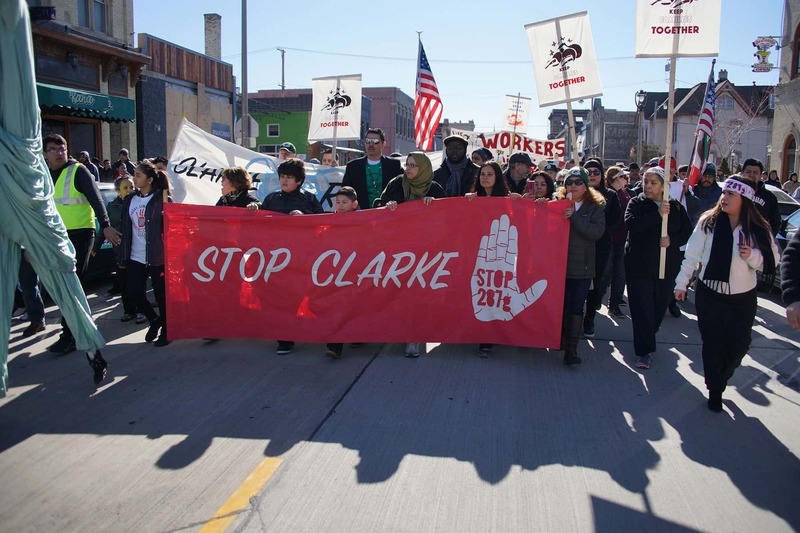 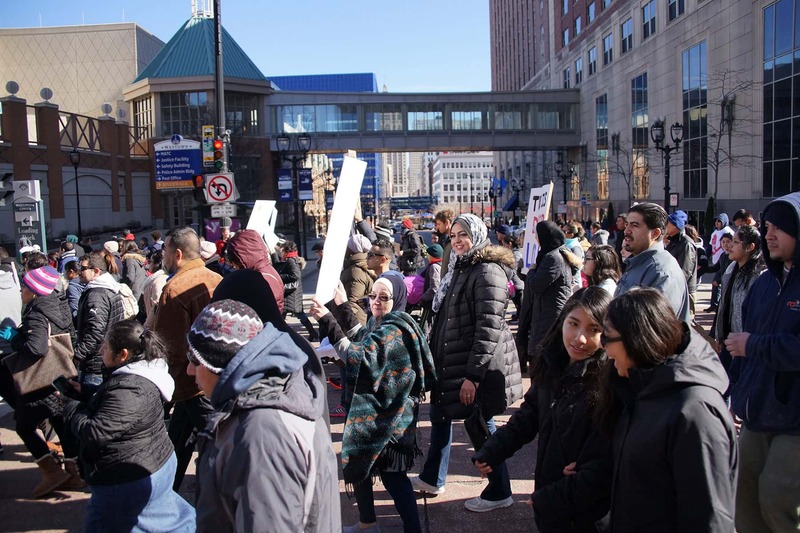 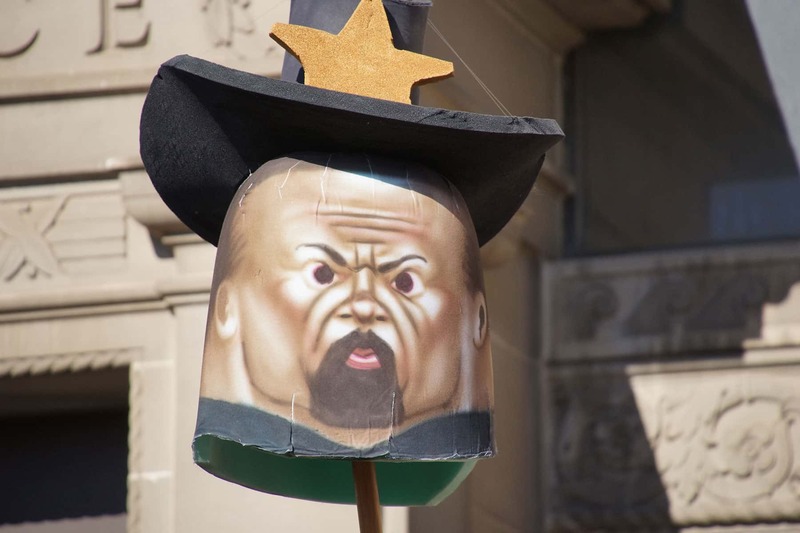 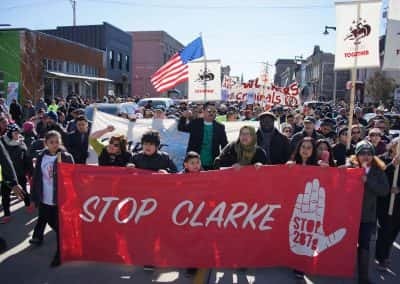 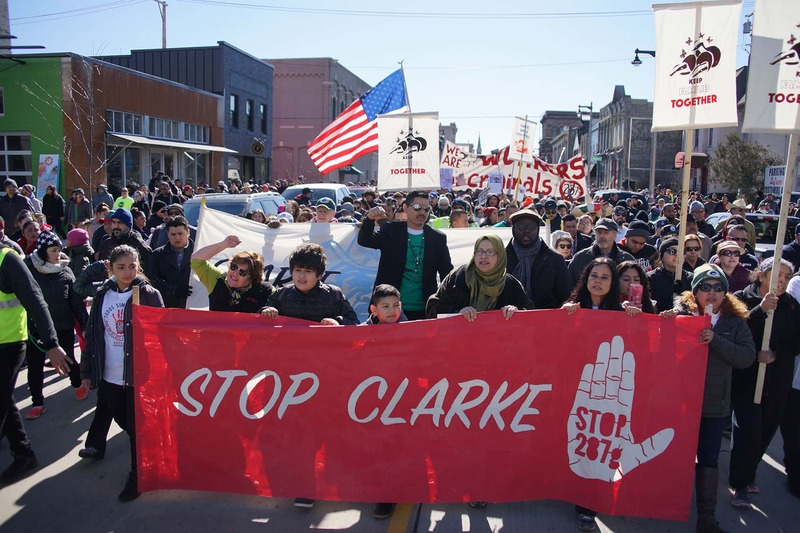 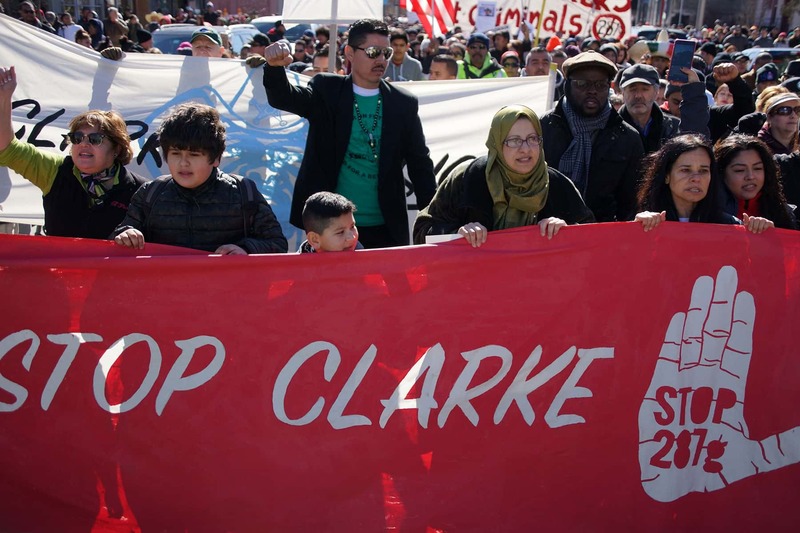 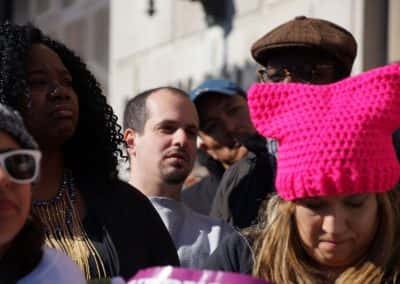 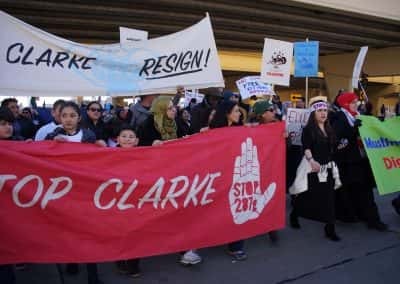 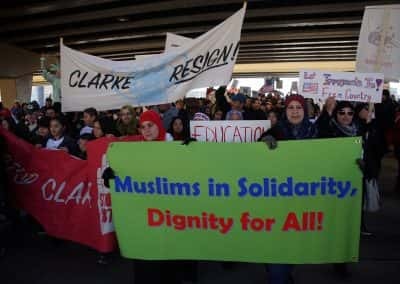 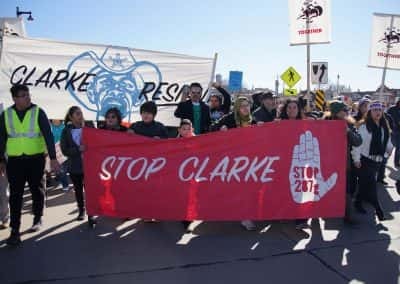 An estimated 30,000 people marched on February 13 to protest Milwaukee County Sheriff David Clarke’s intention to enroll his department in the Federal 287g program, which would empower his deputies to act as ICE agents. 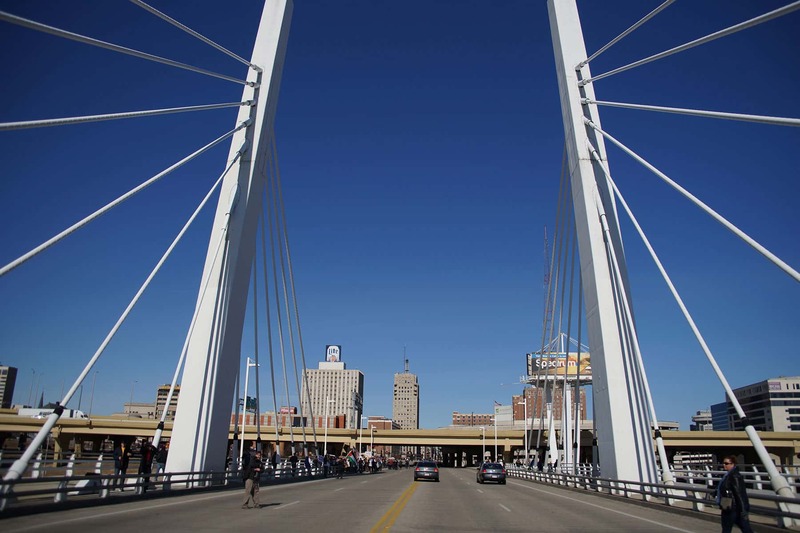 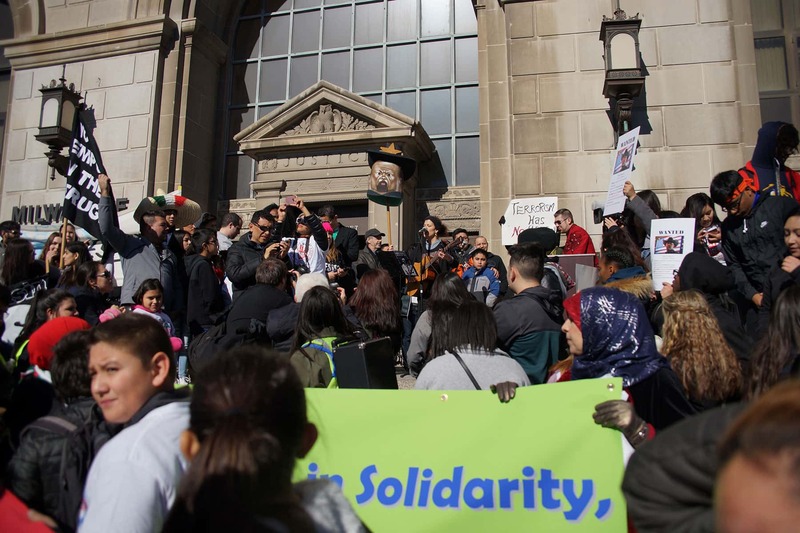 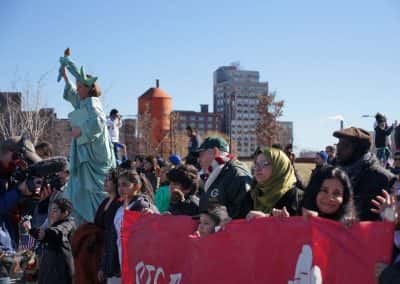 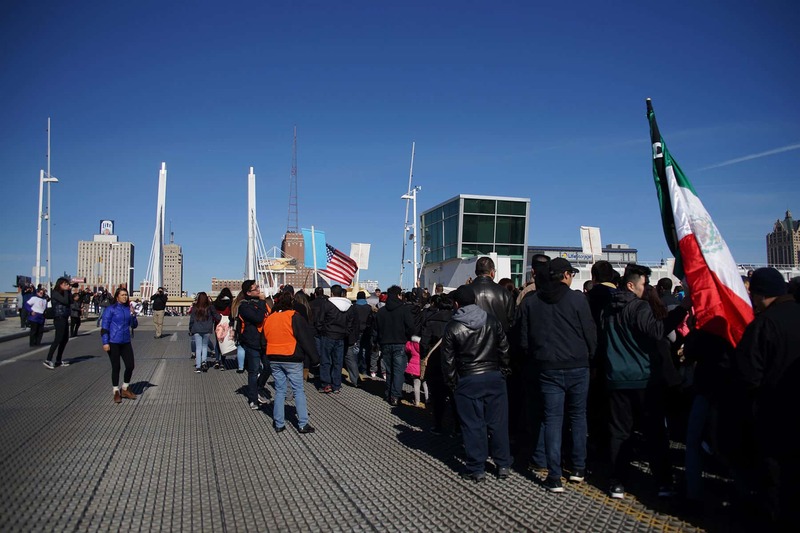 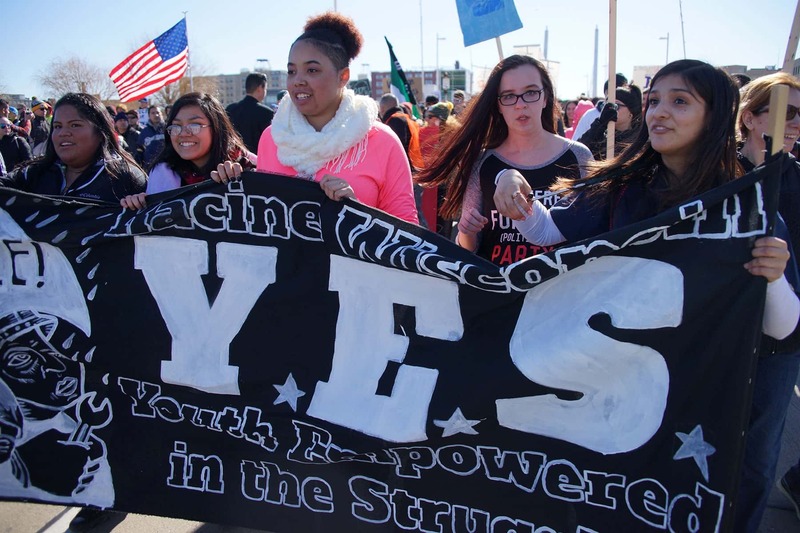 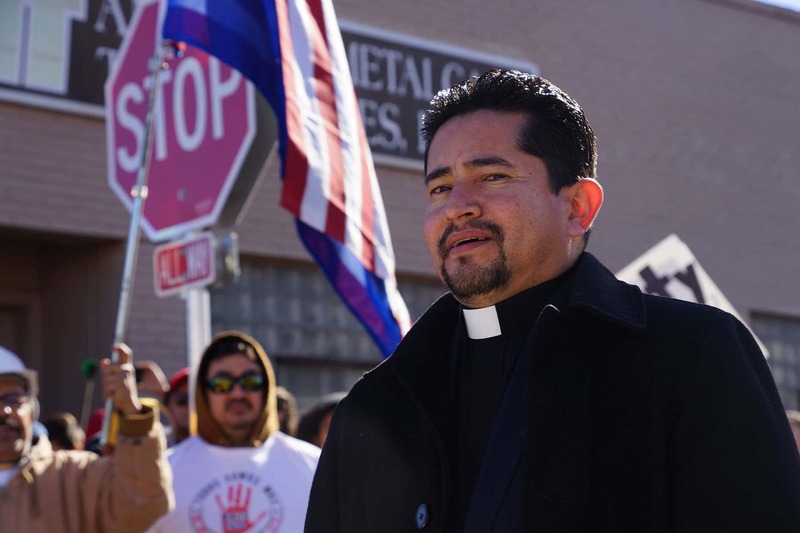 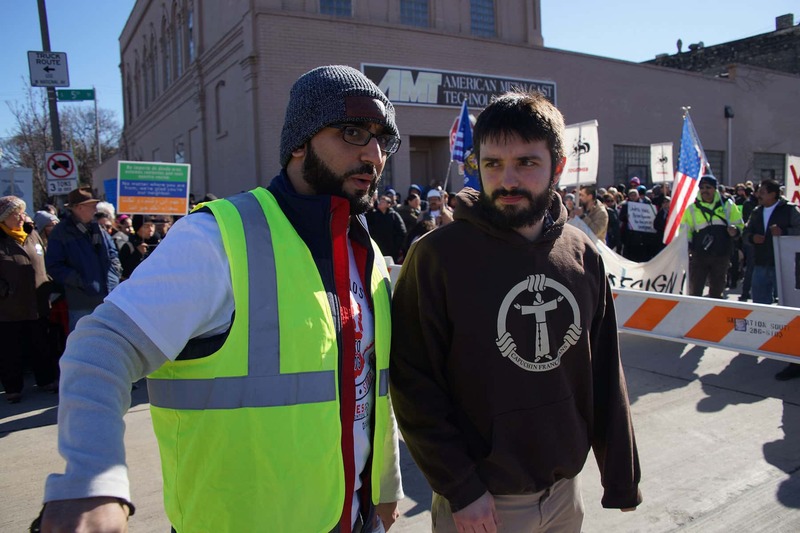 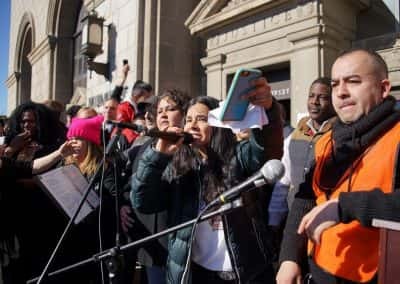 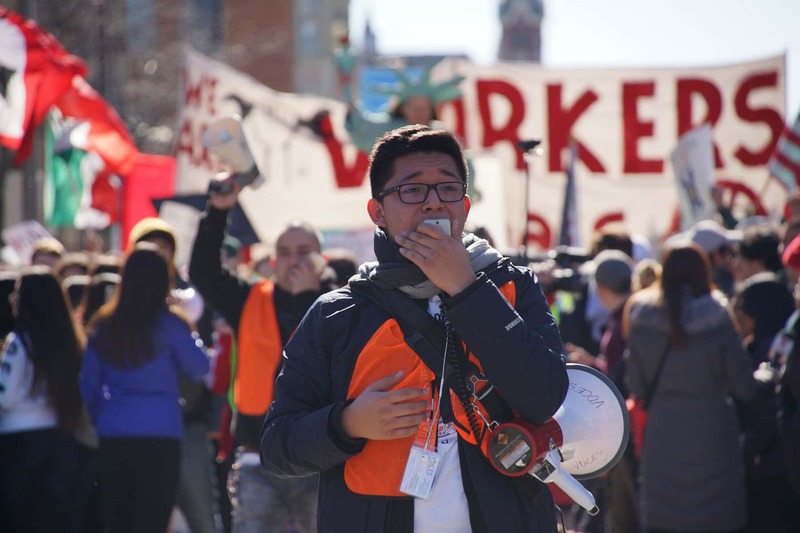 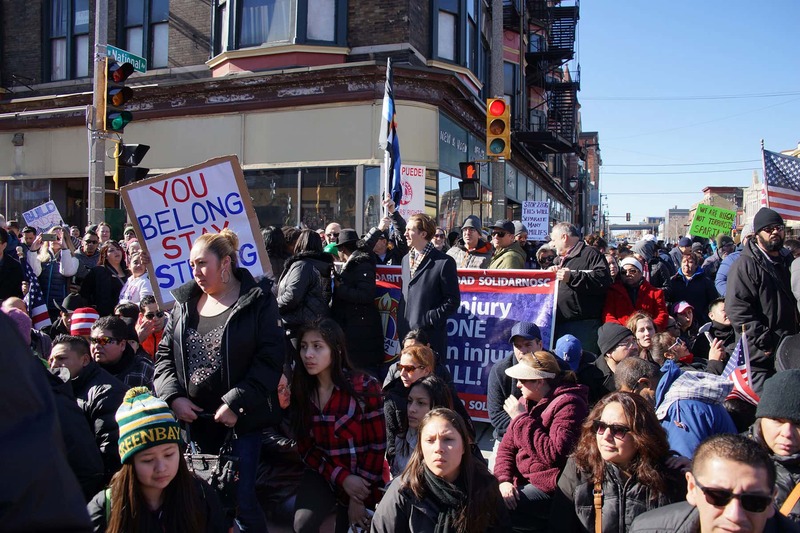 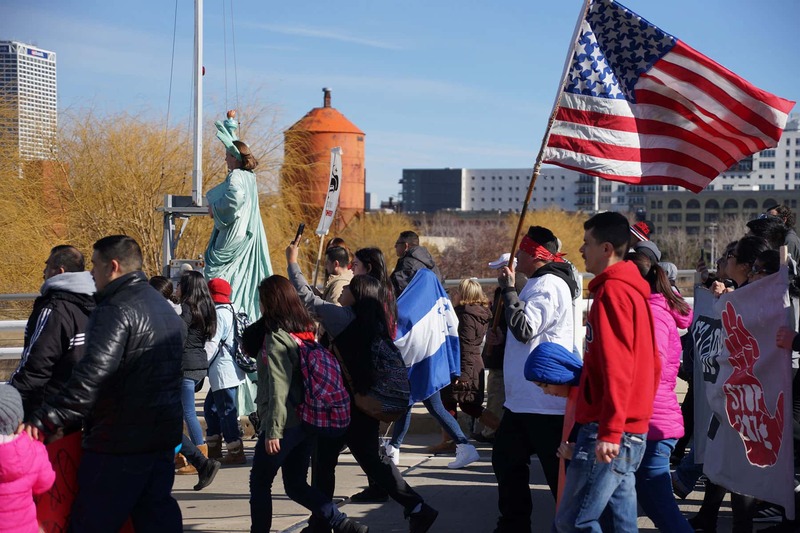 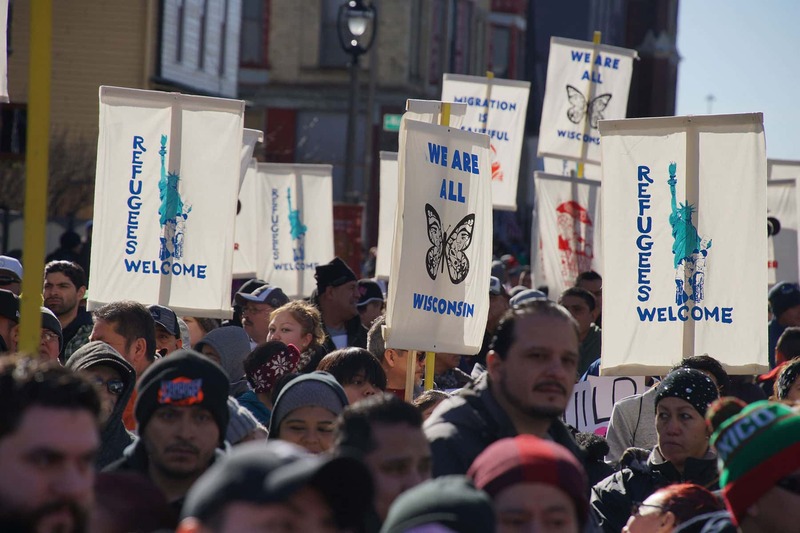 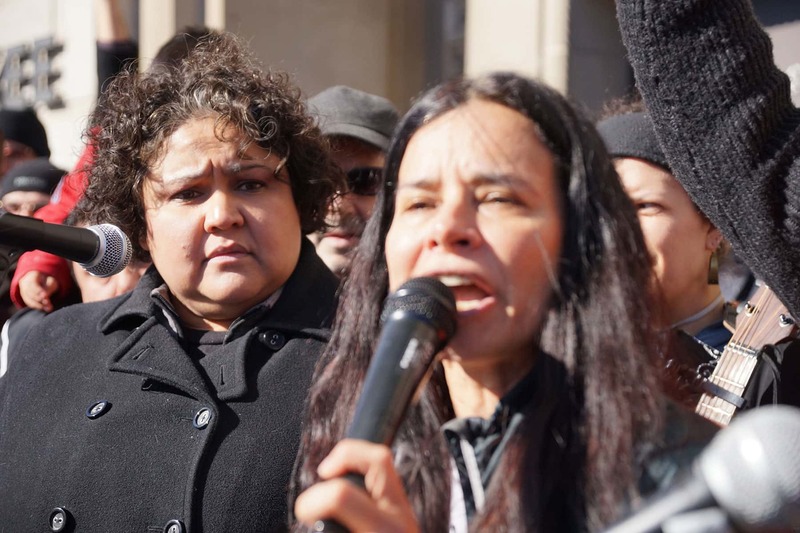 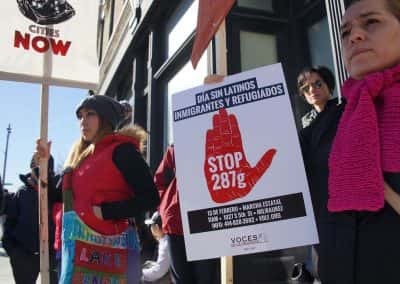 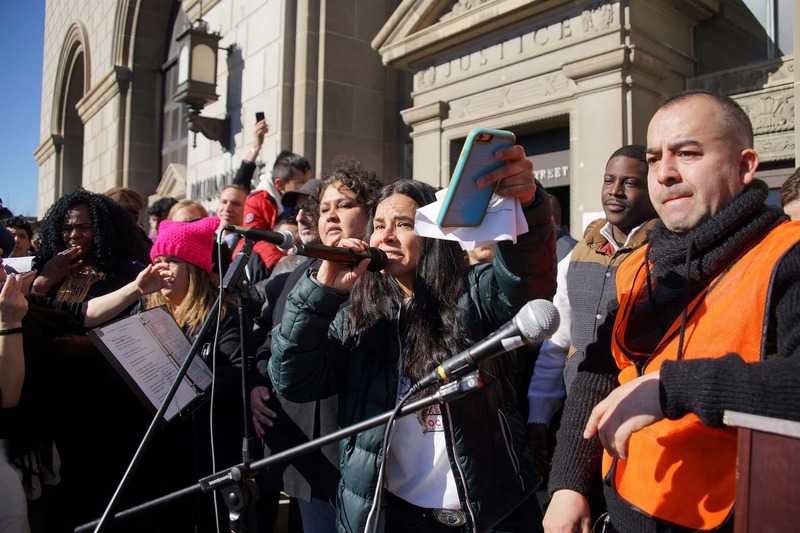 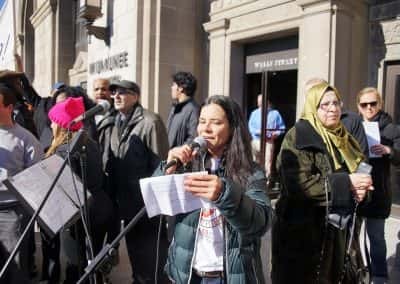 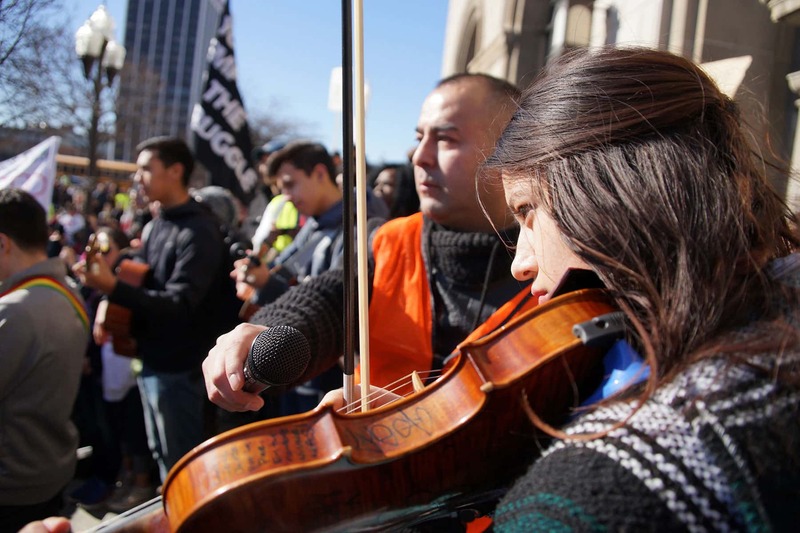 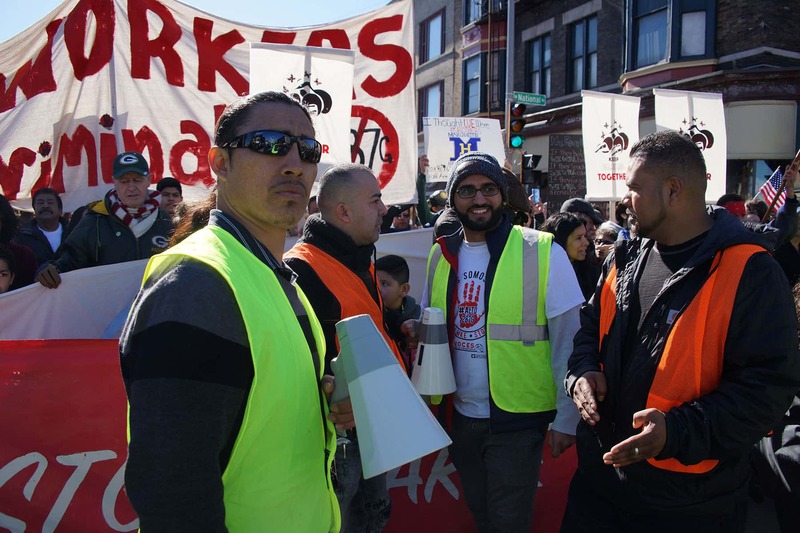 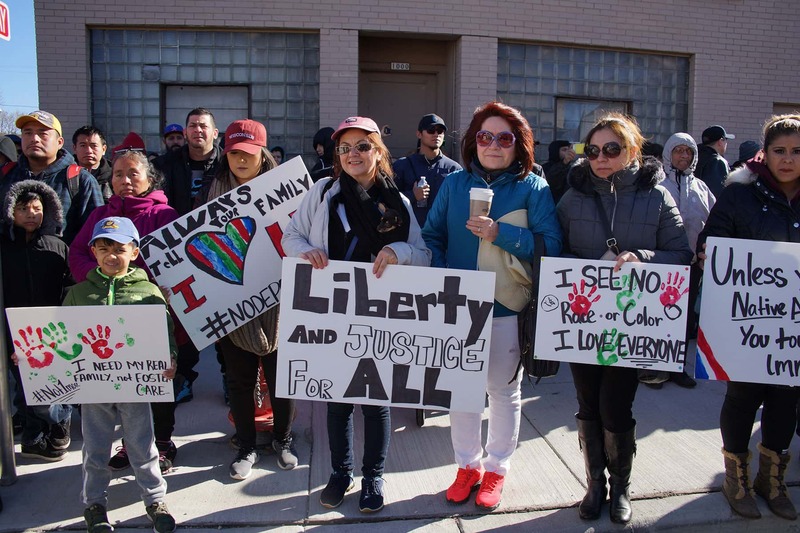 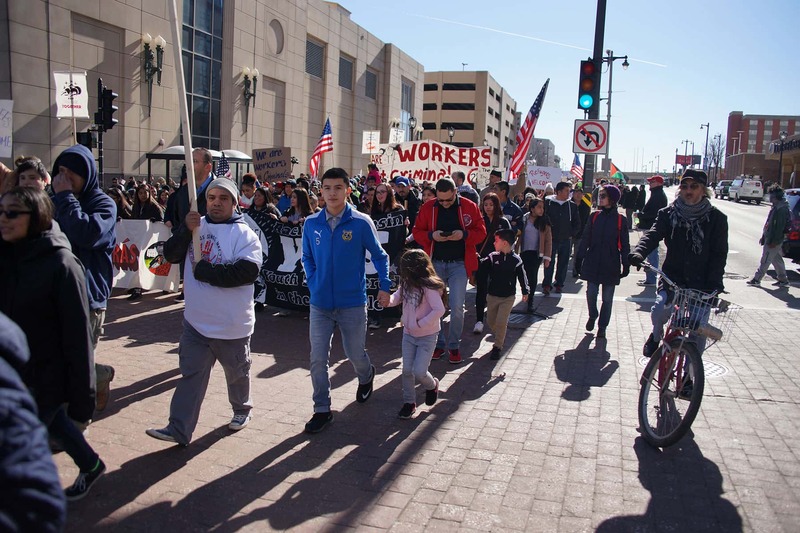 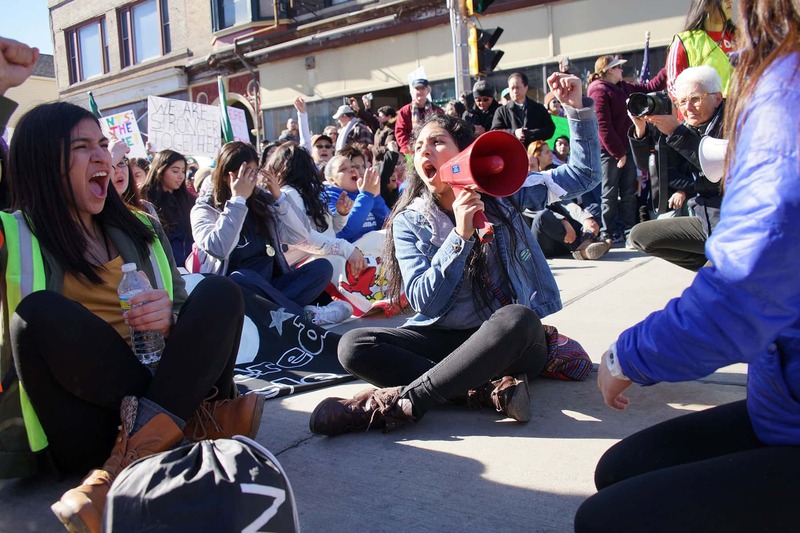 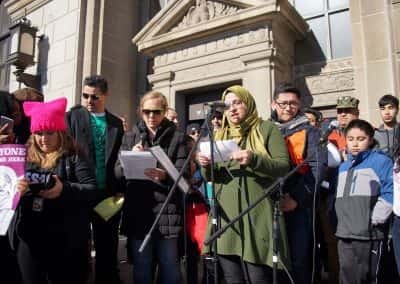 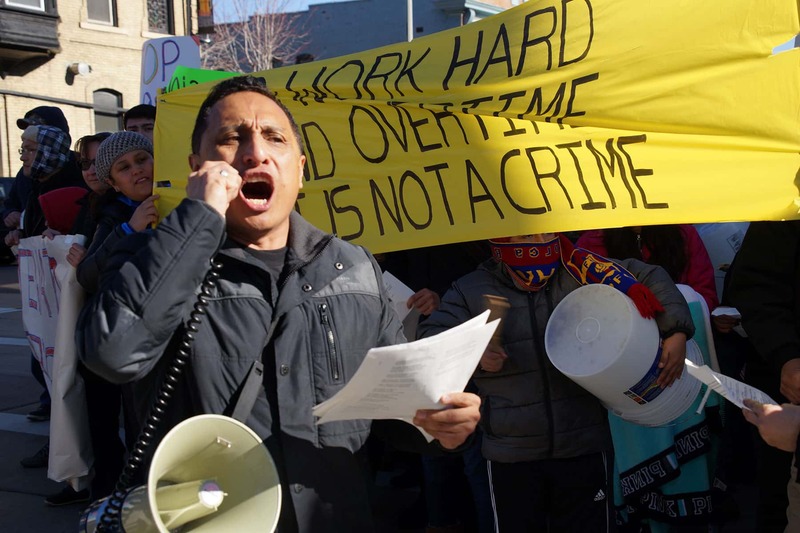 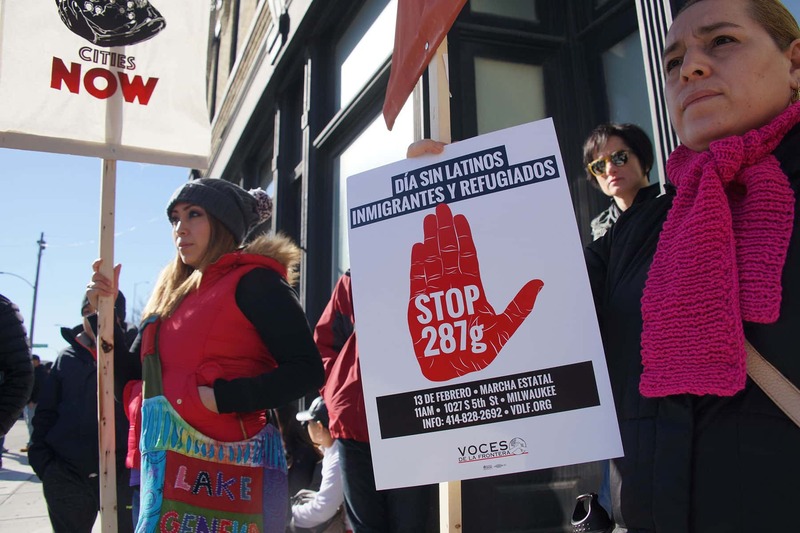 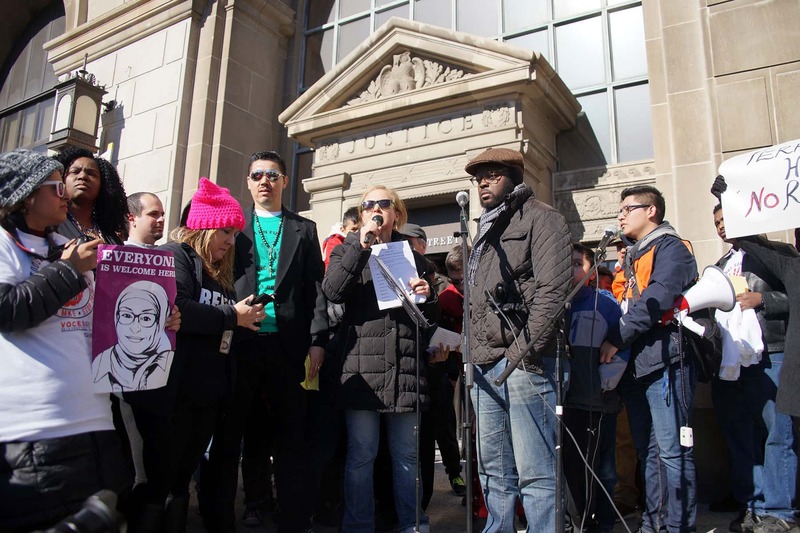 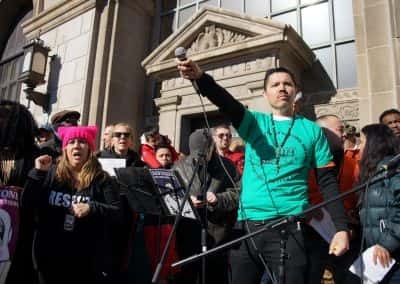 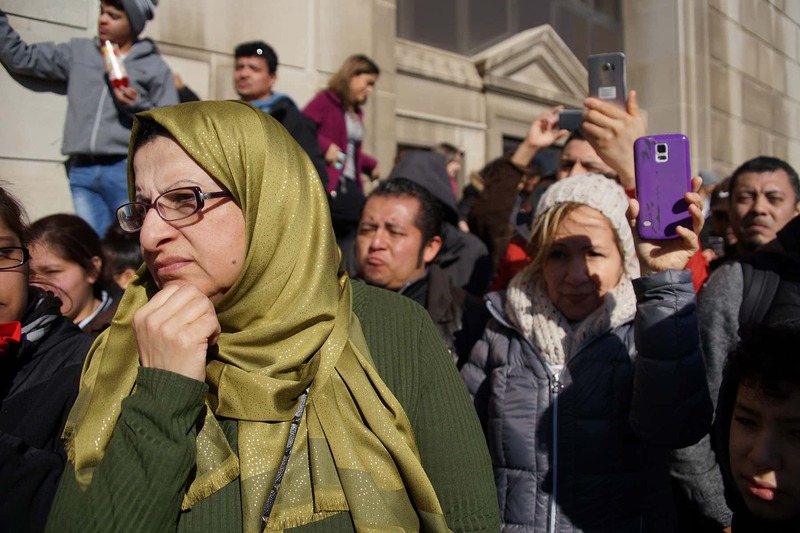 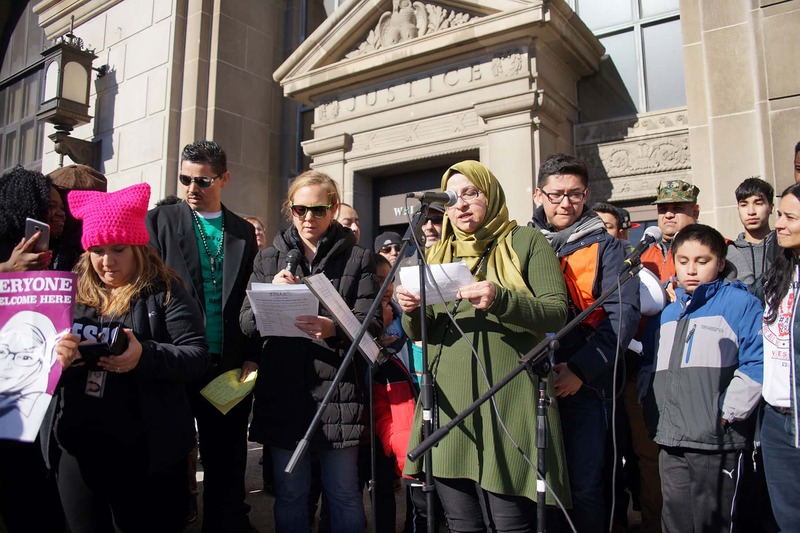 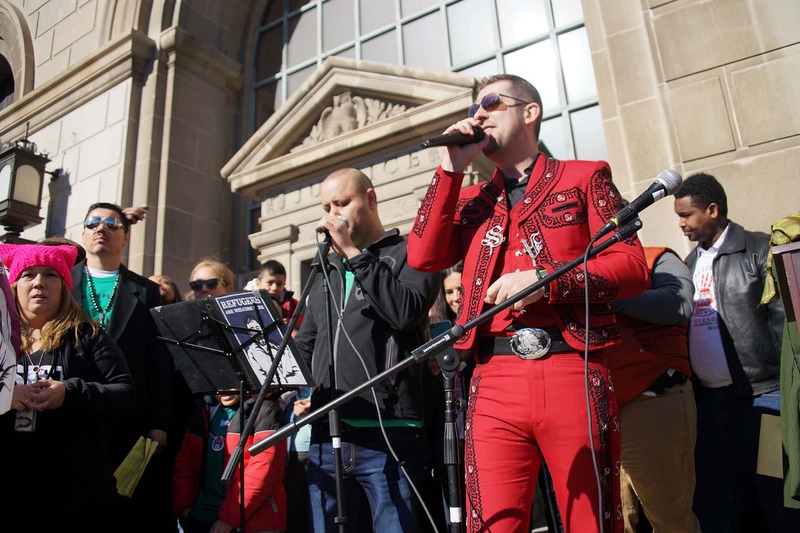 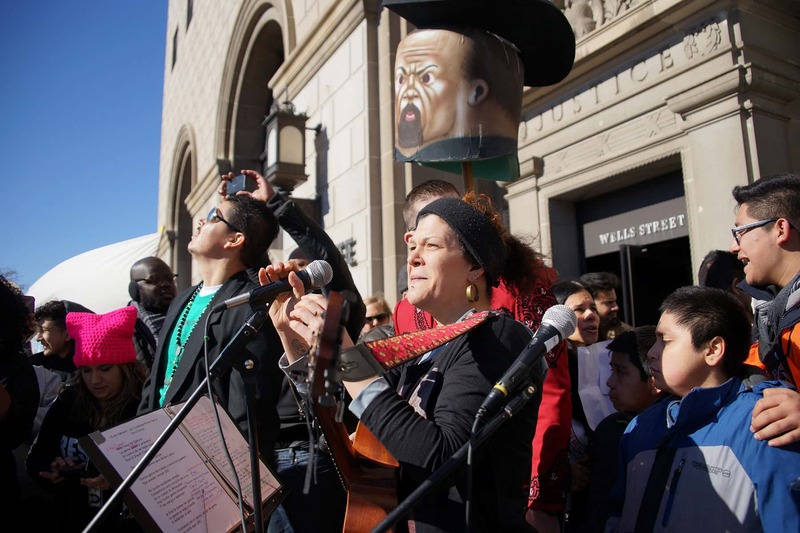 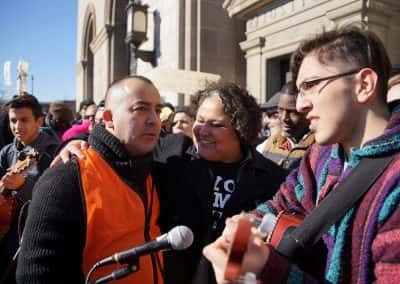 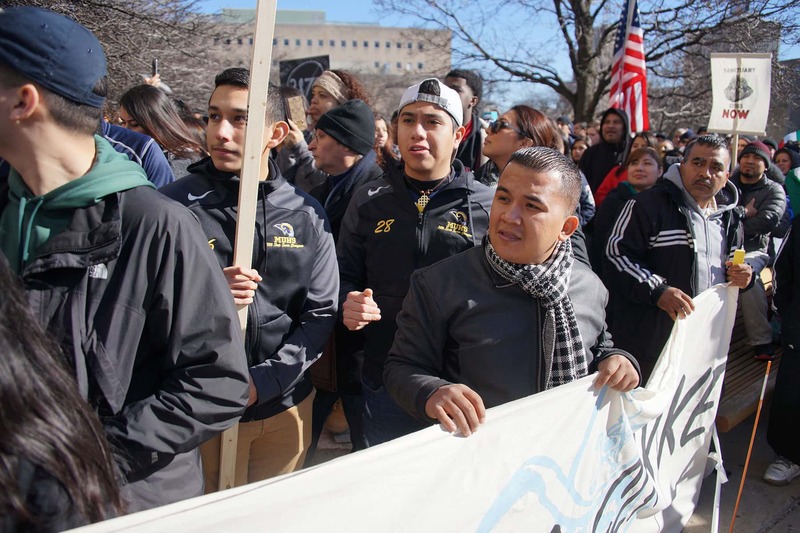 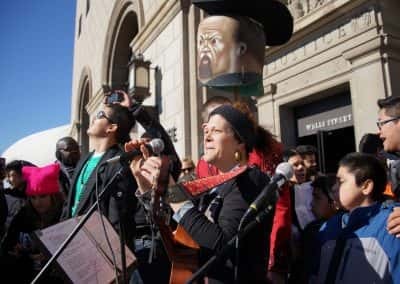 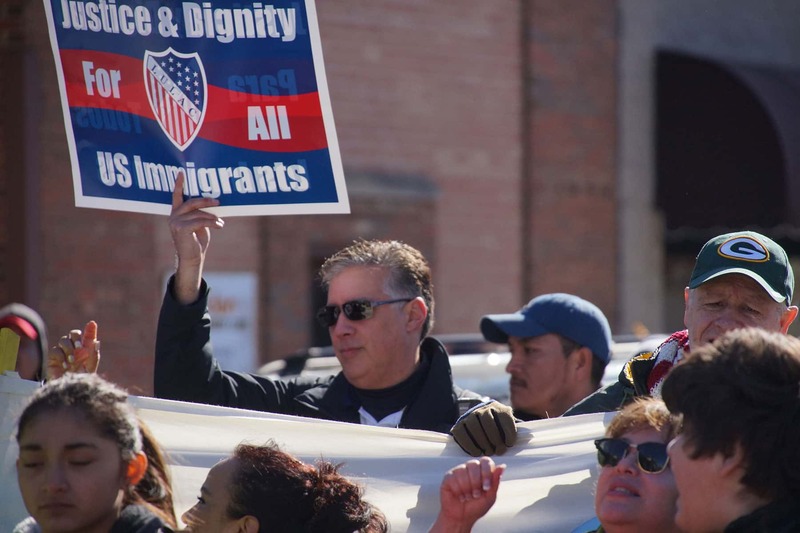 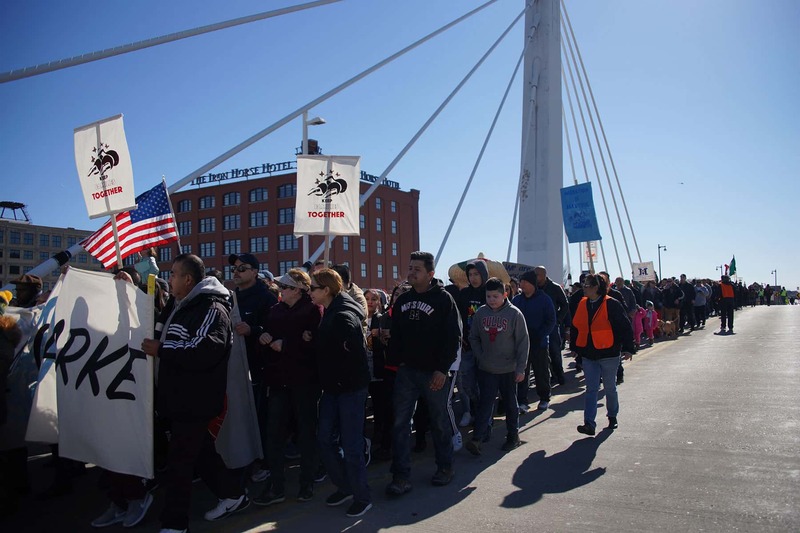 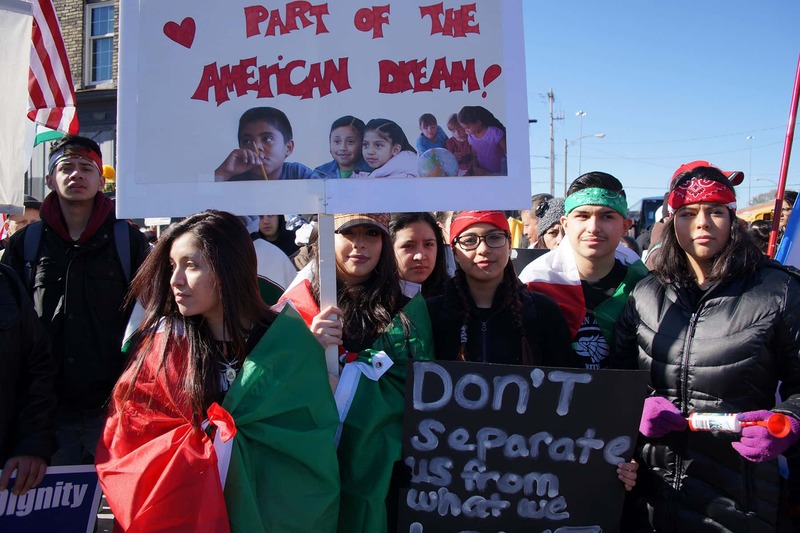 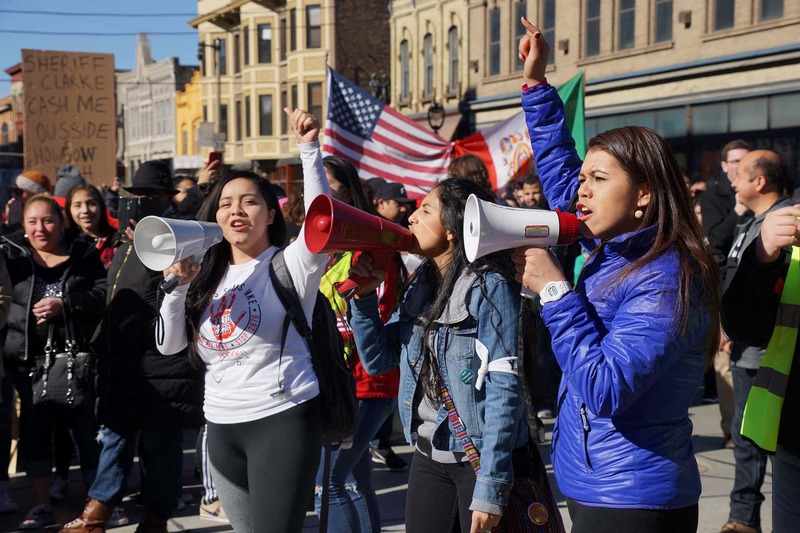 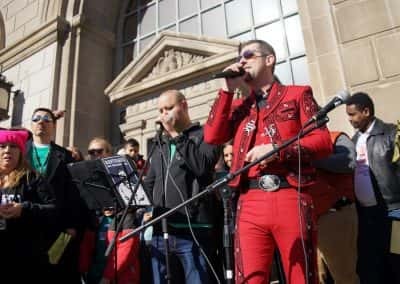 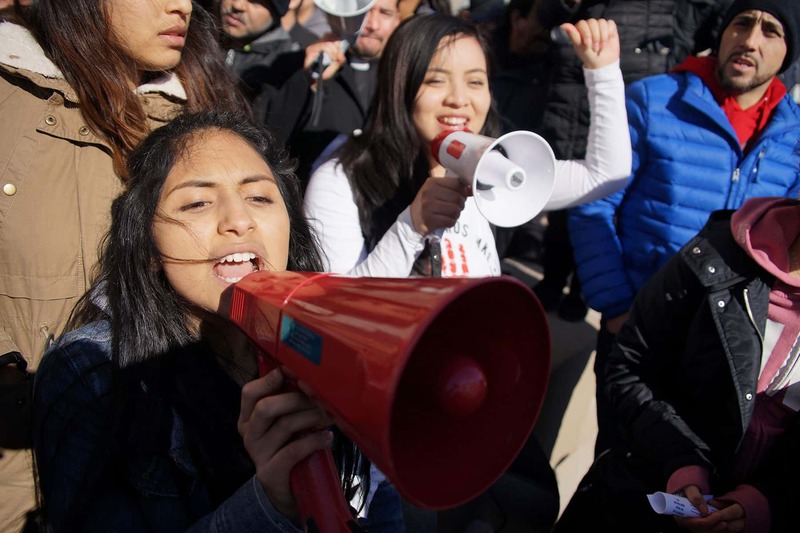 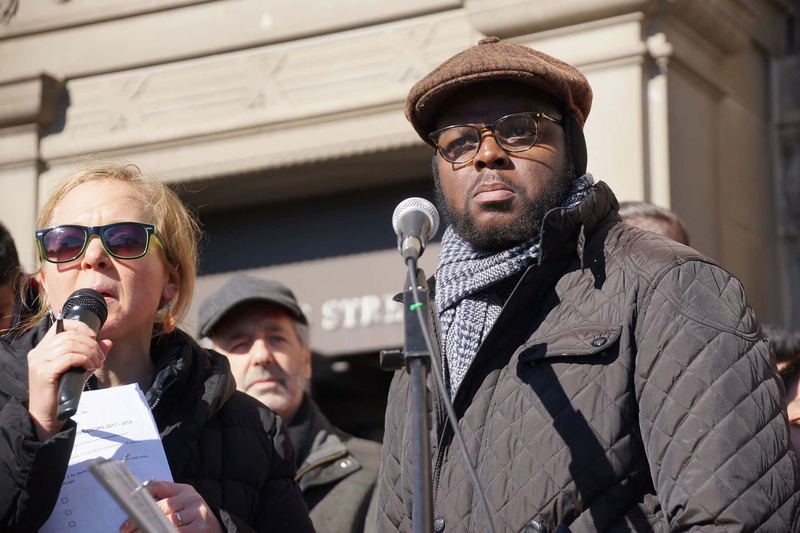 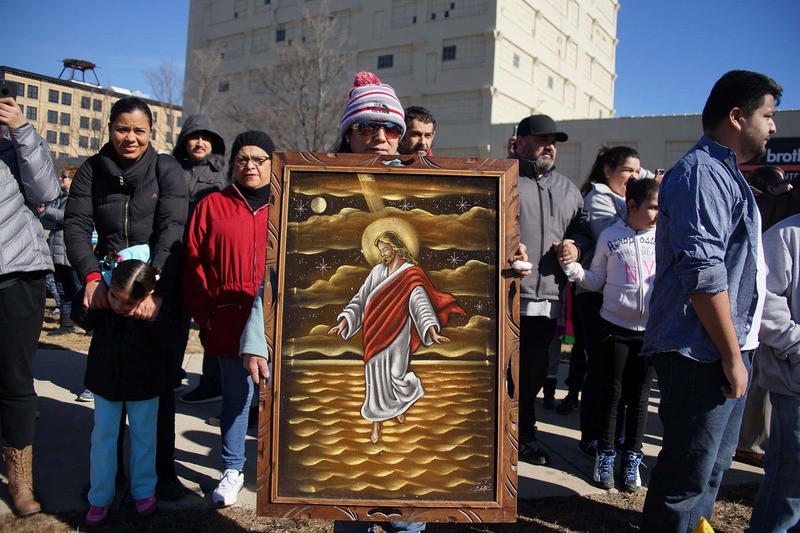 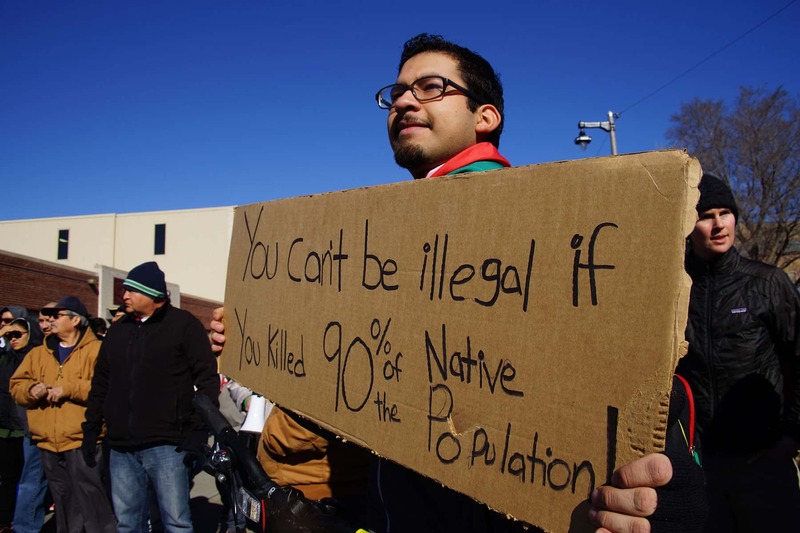 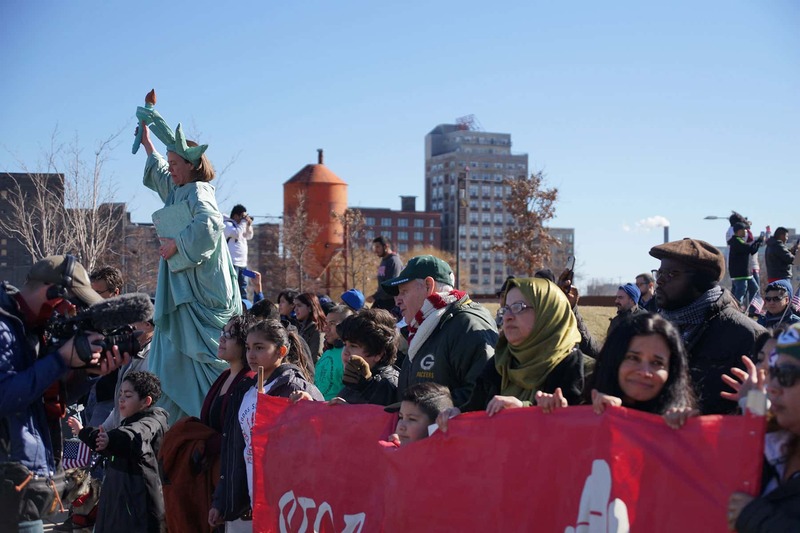 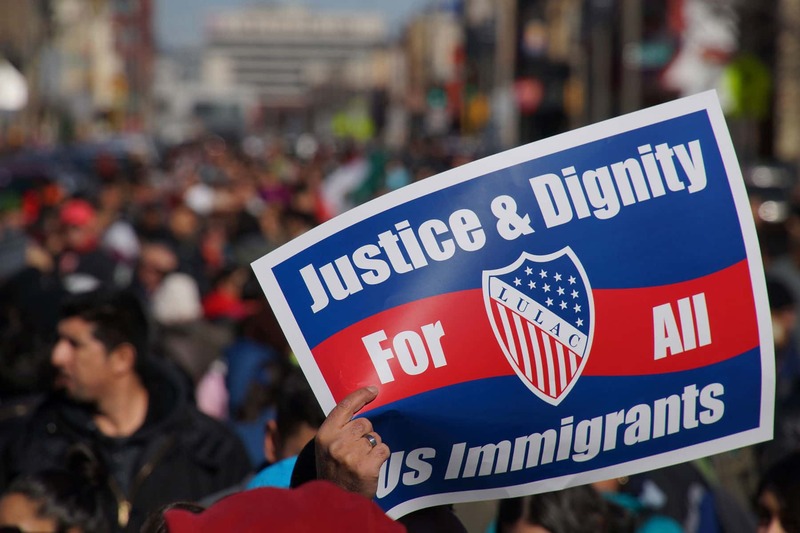 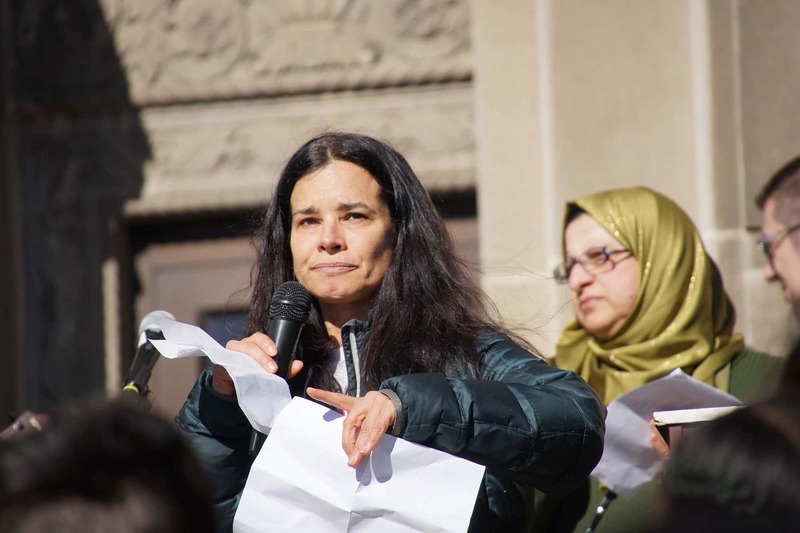 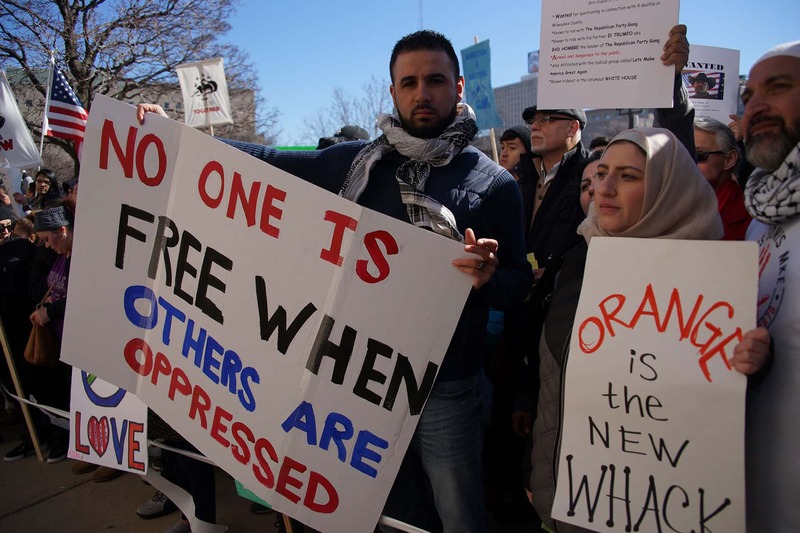 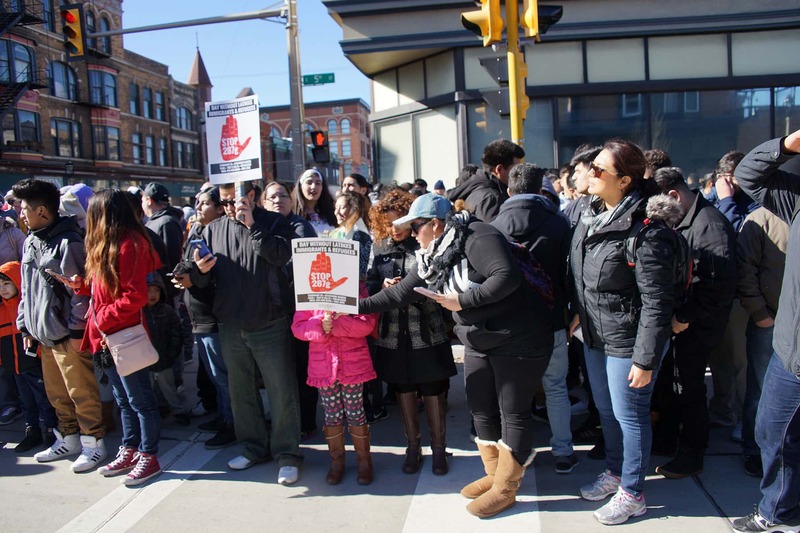 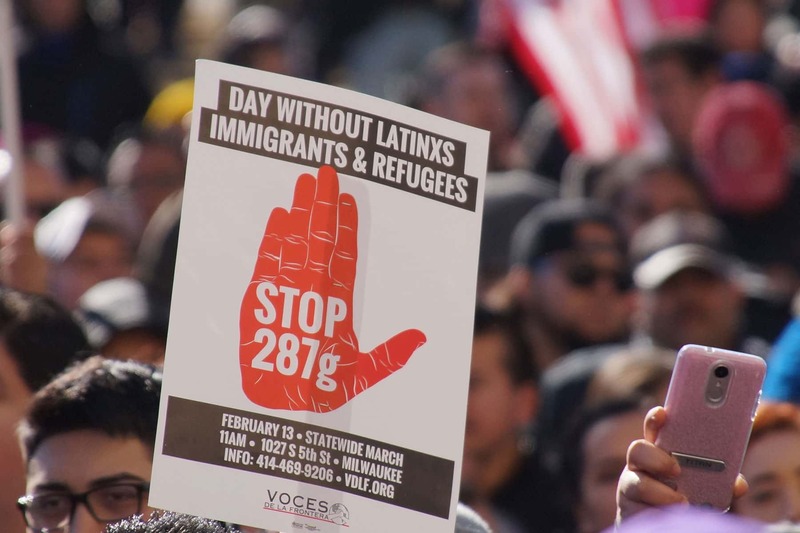 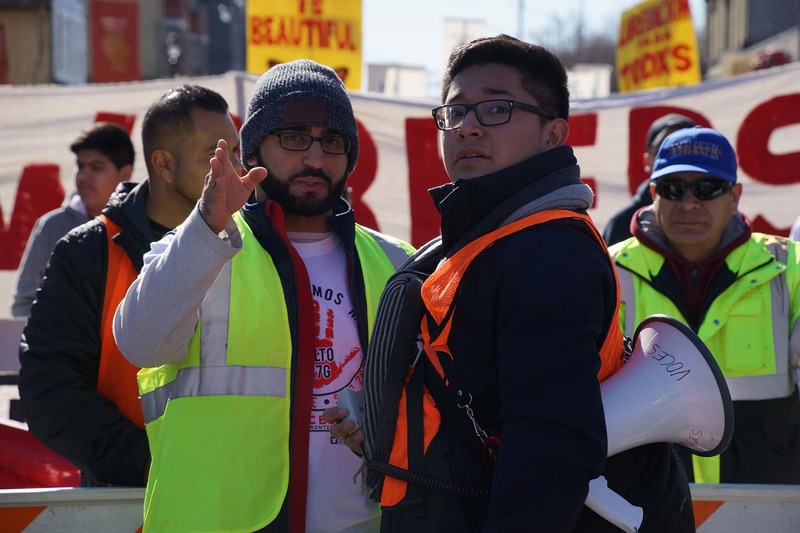 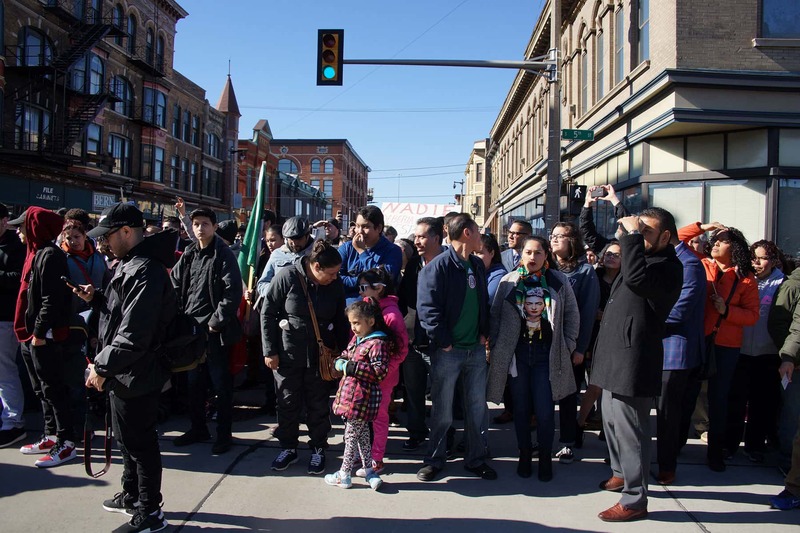 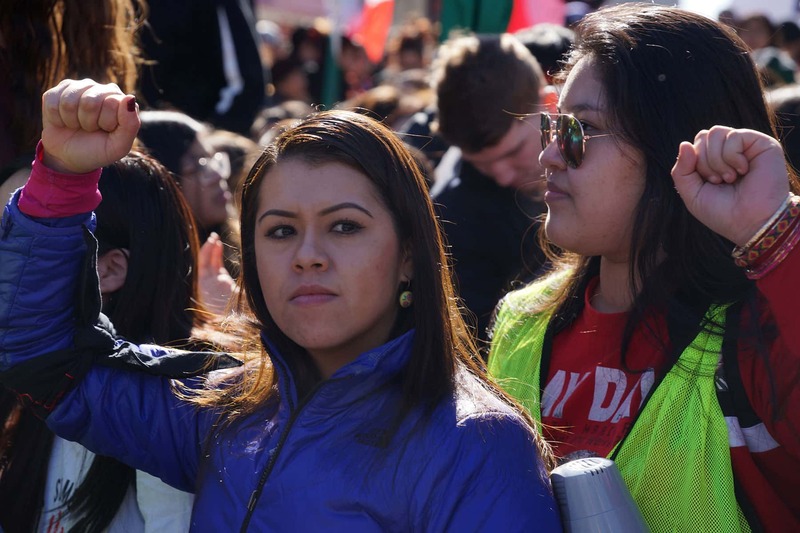 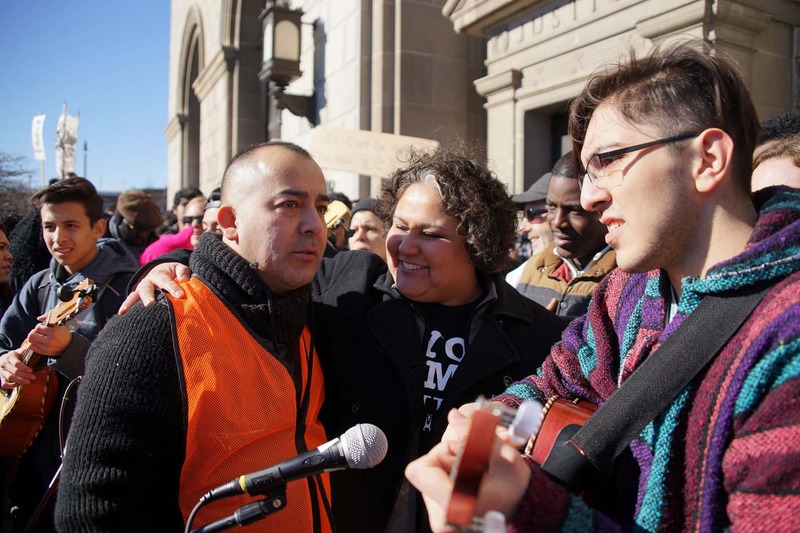 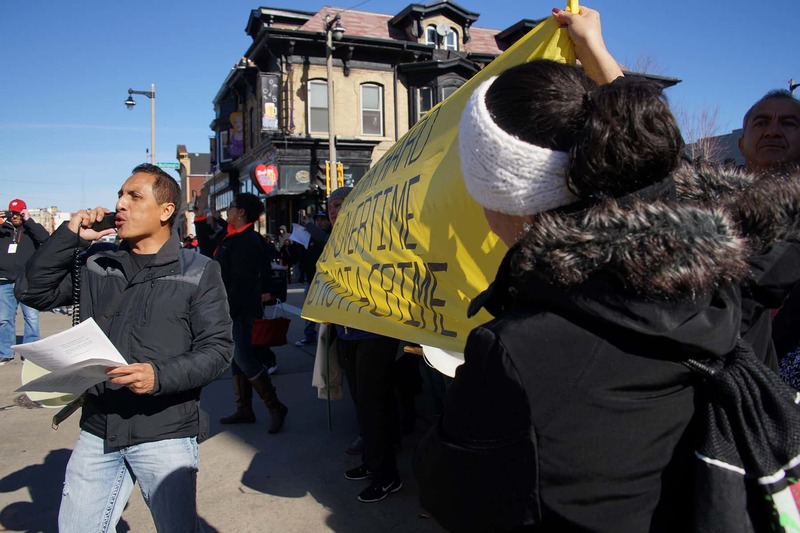 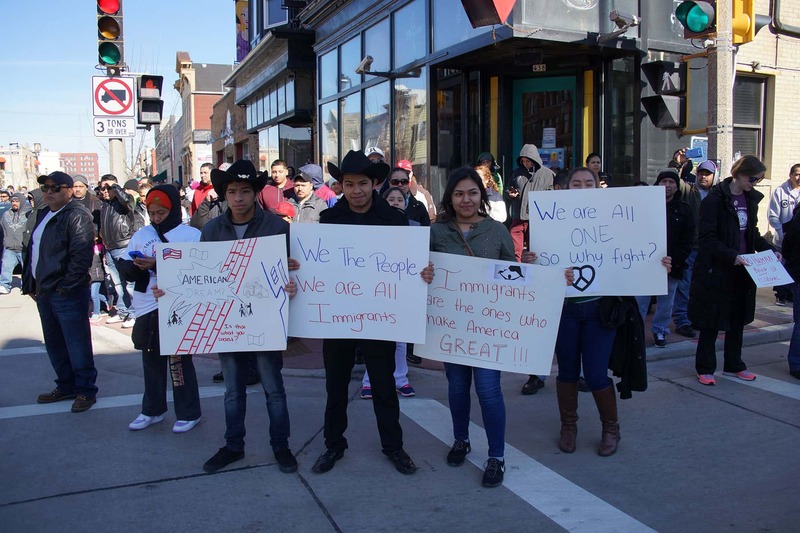 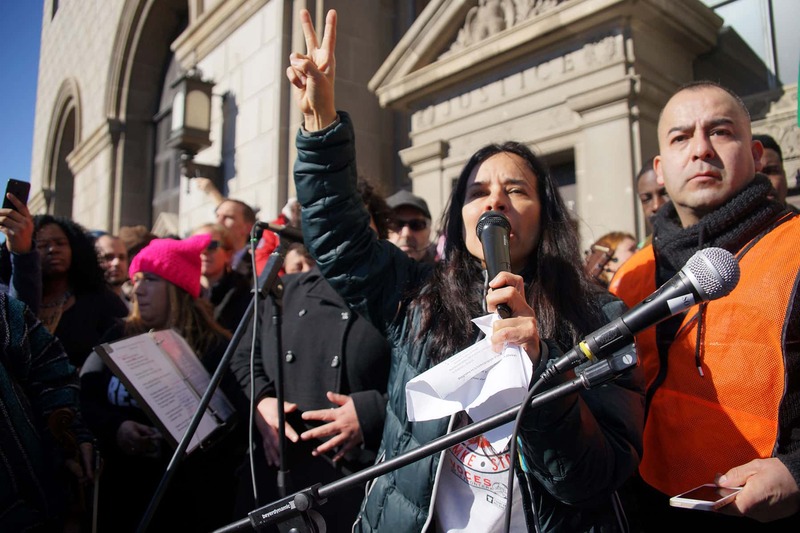 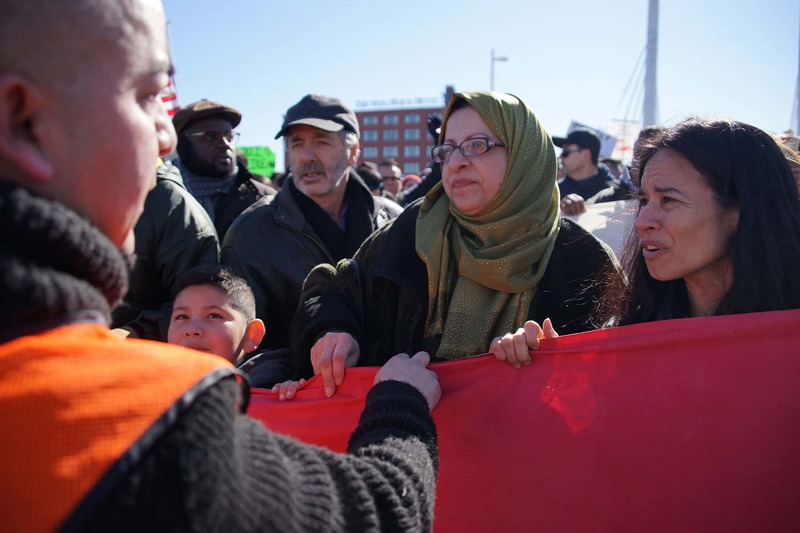 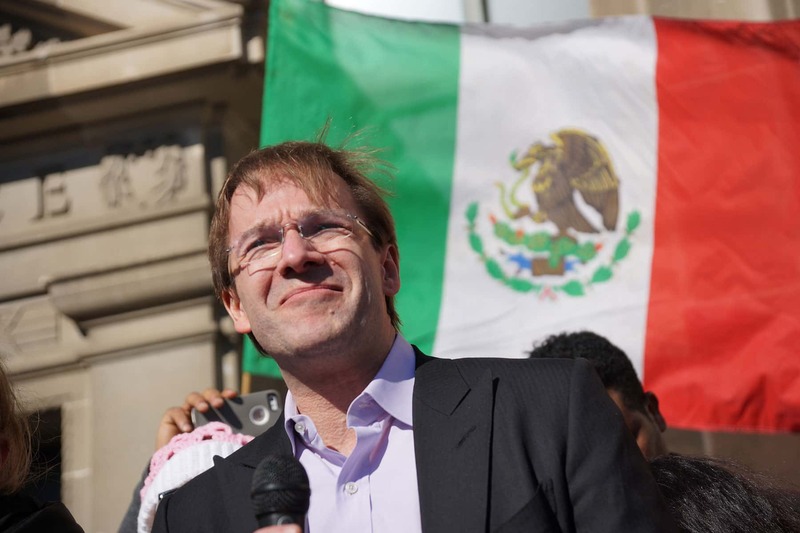 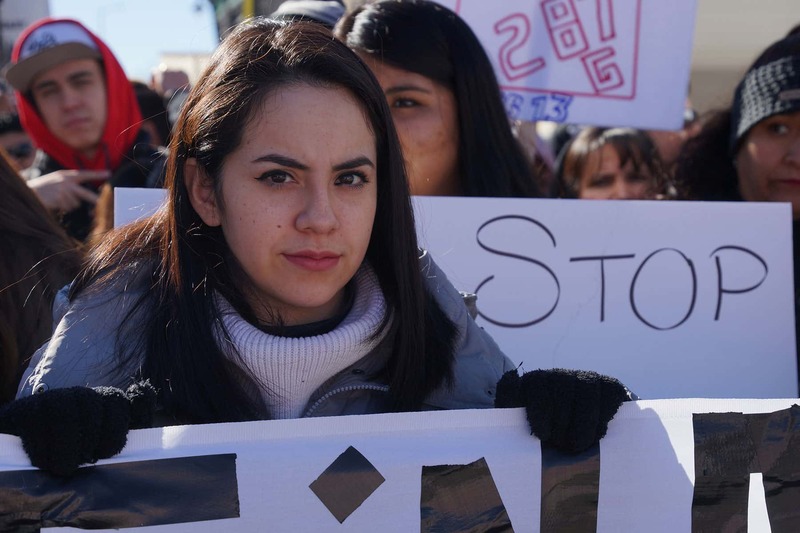 Voces de la Frontera organized the “Day Without Latinos, Immigrants, and Refugees” event. 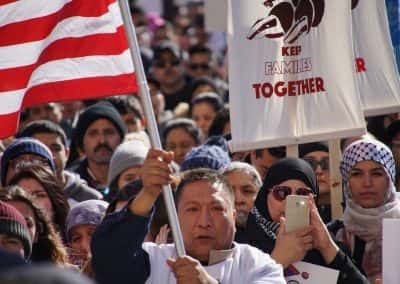 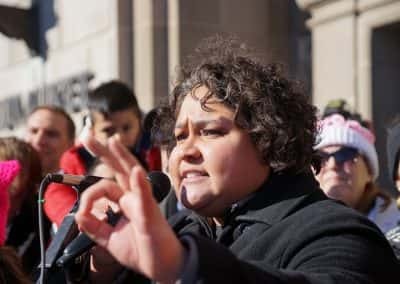 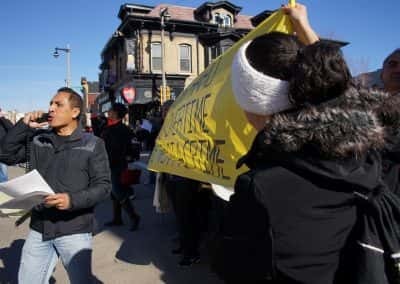 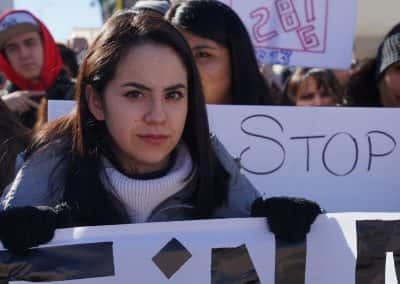 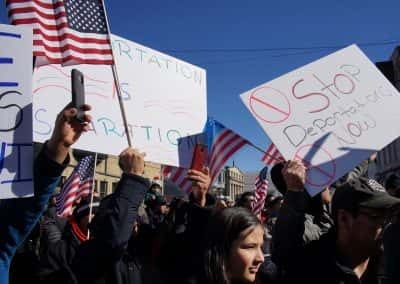 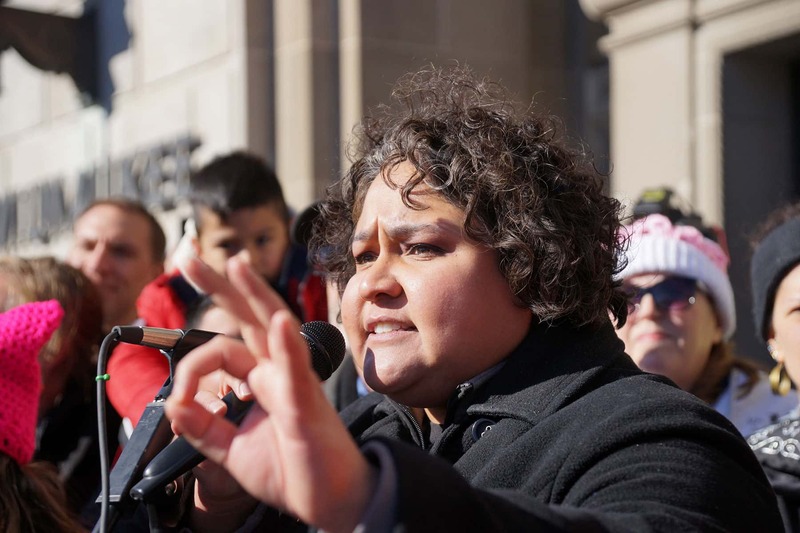 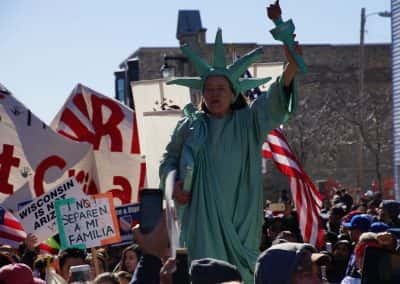 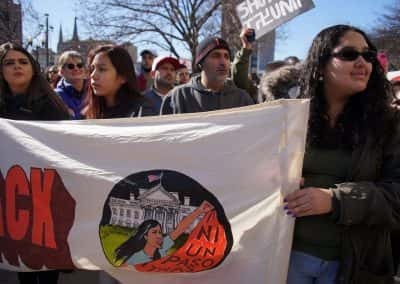 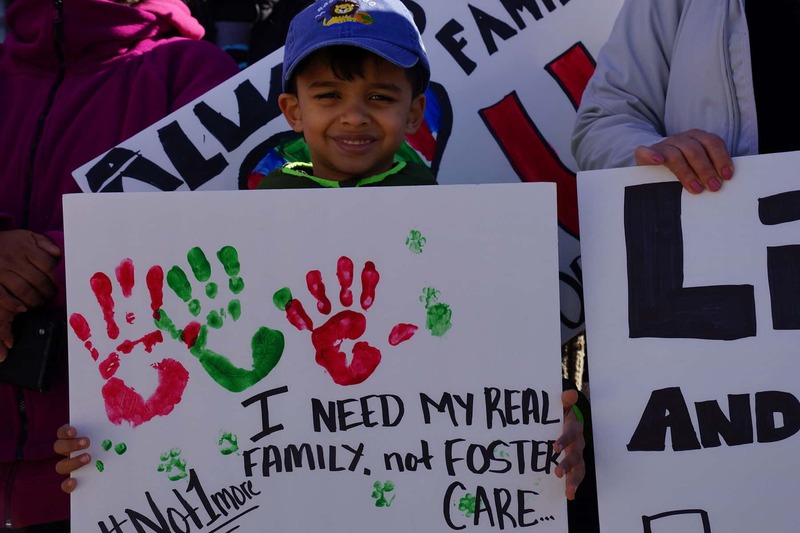 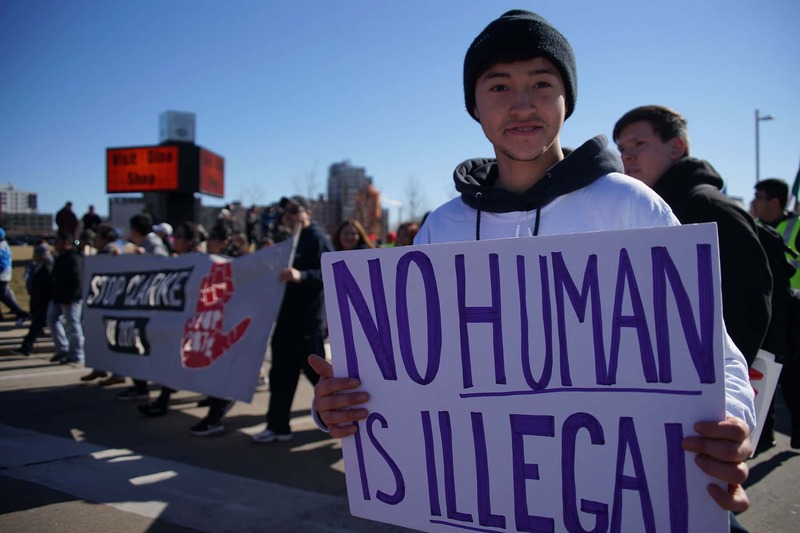 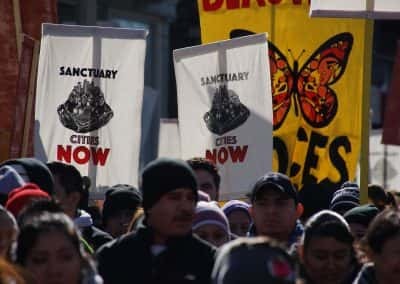 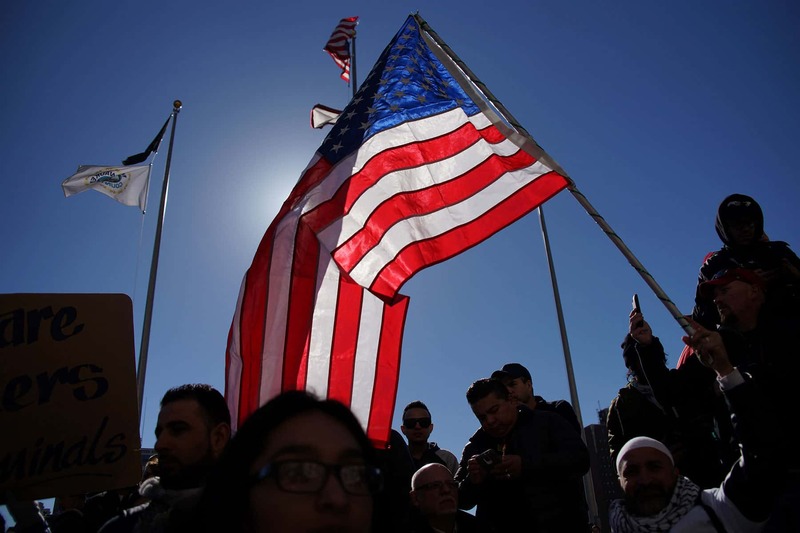 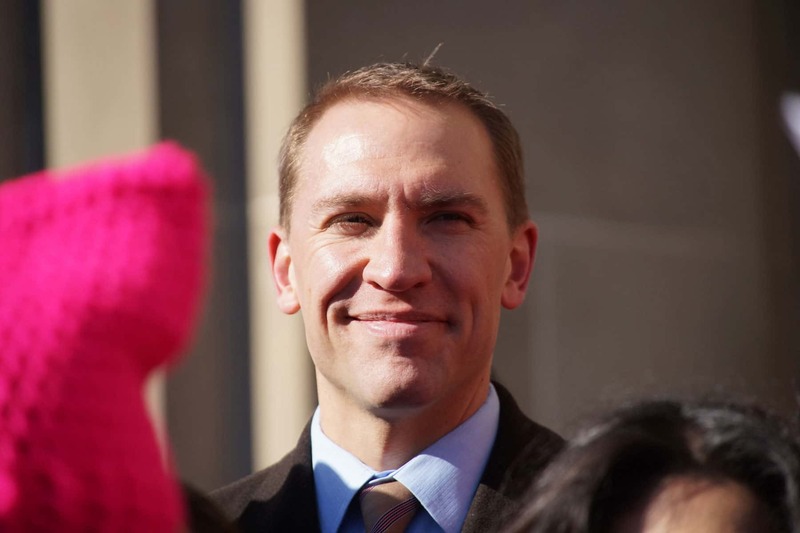 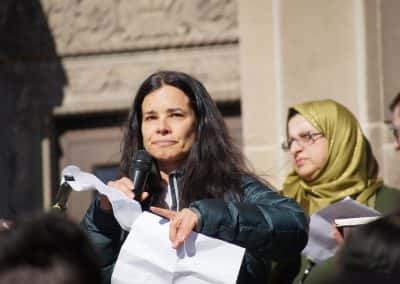 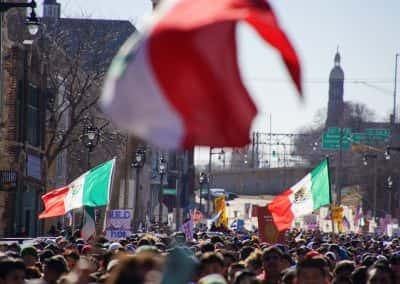 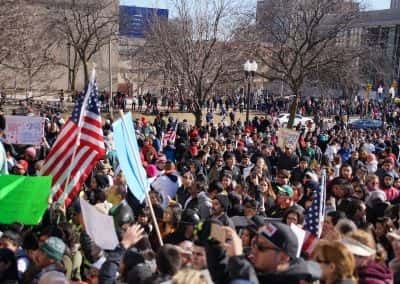 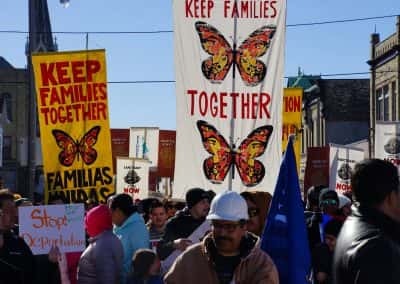 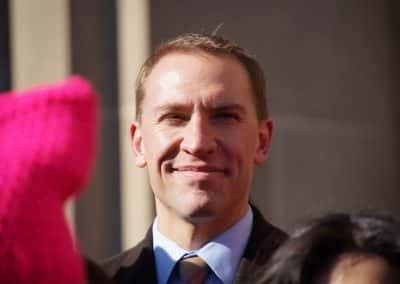 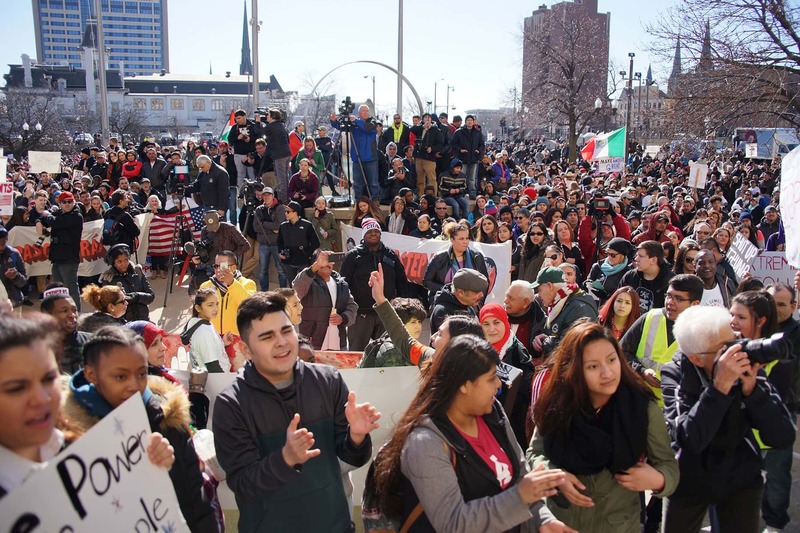 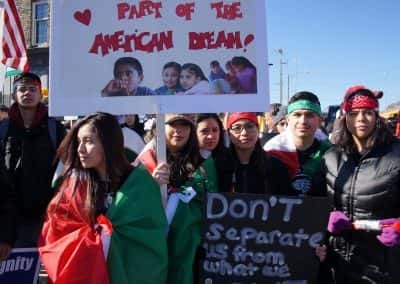 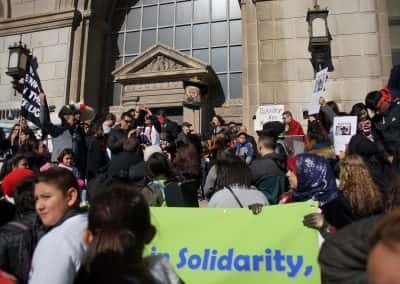 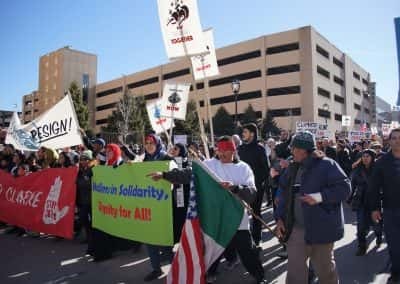 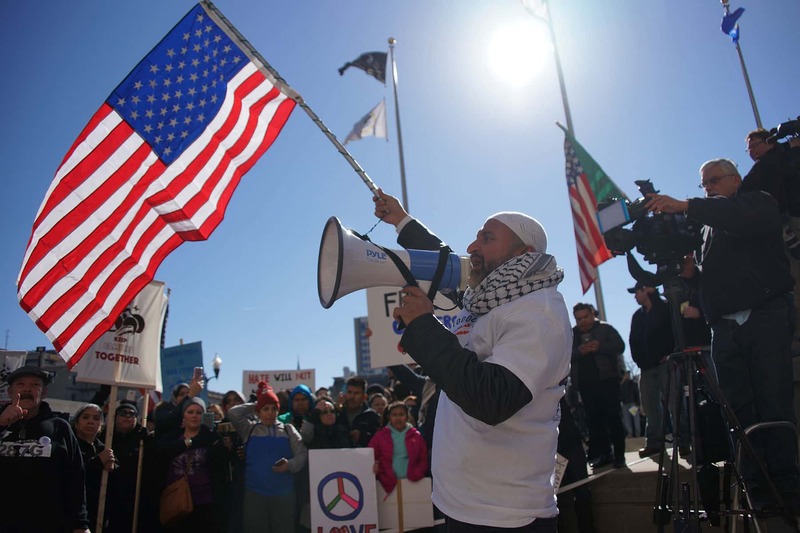 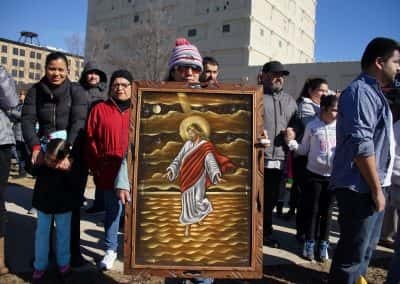 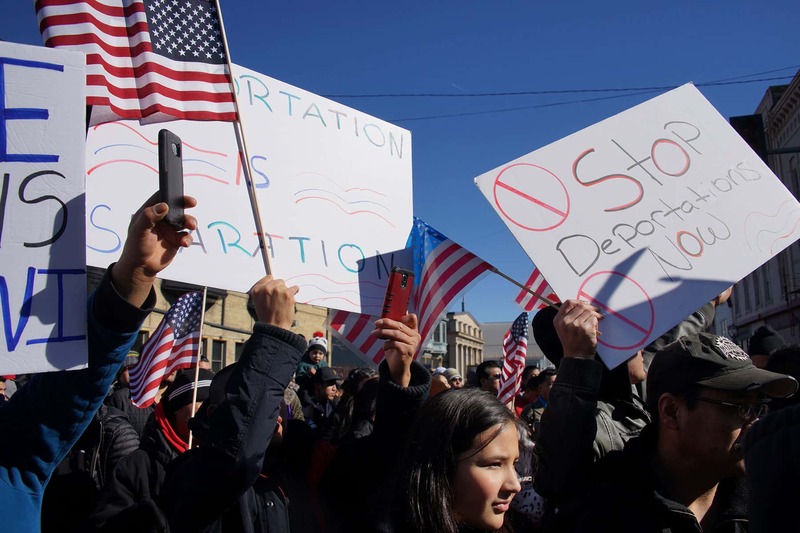 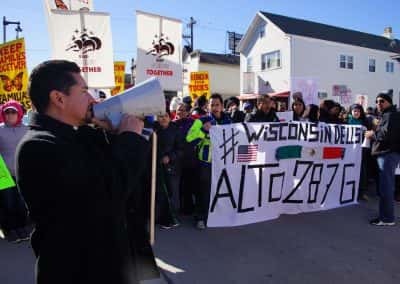 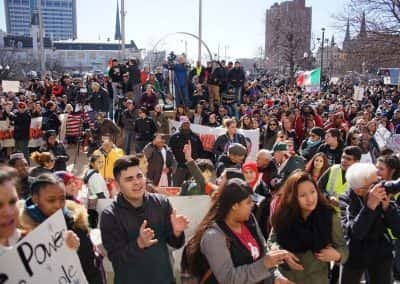 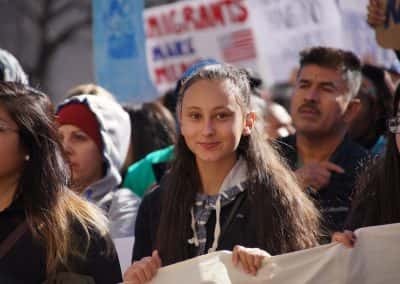 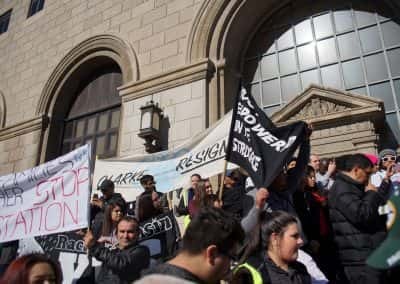 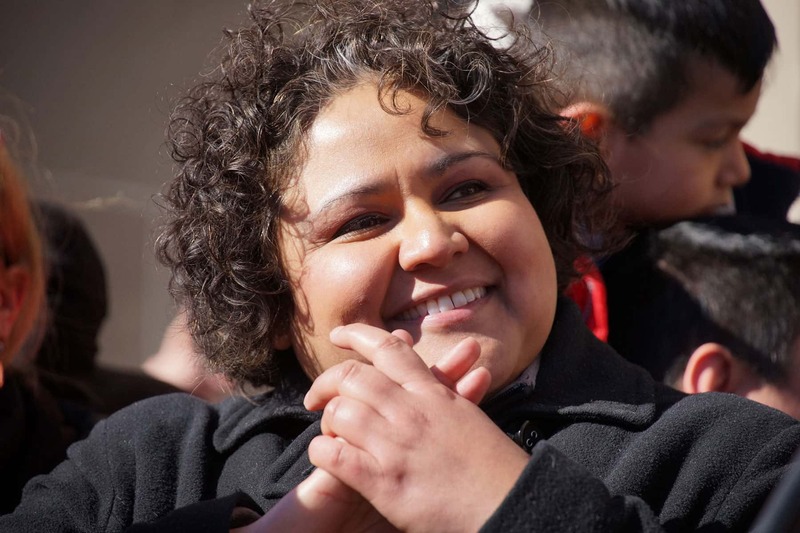 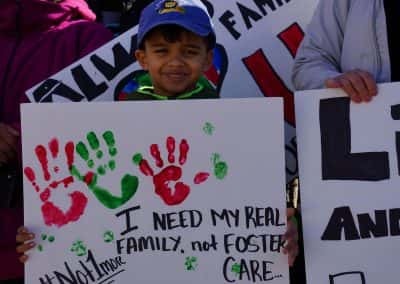 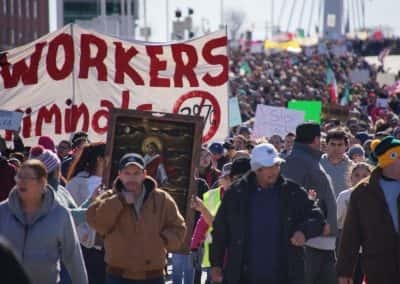 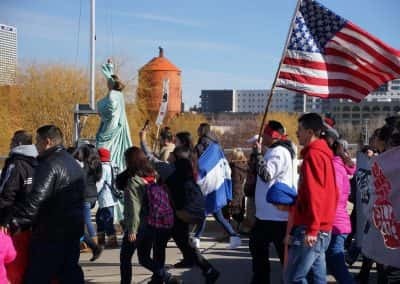 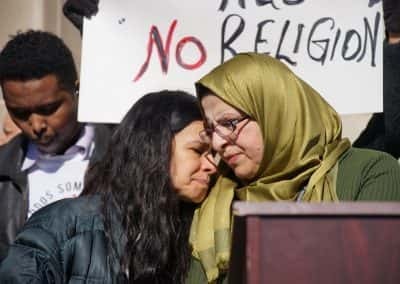 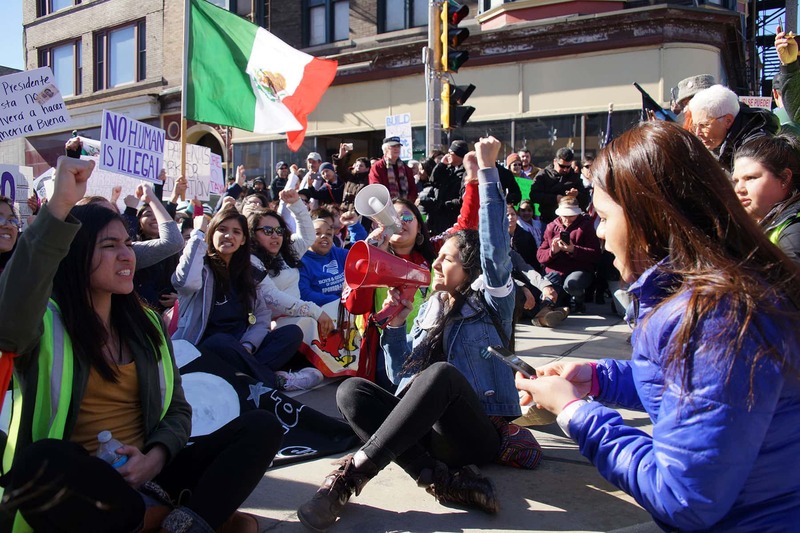 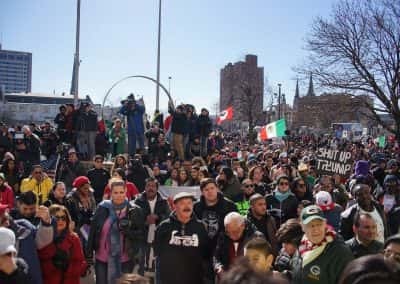 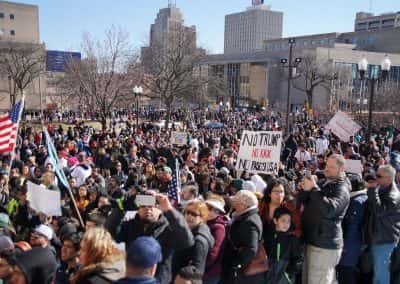 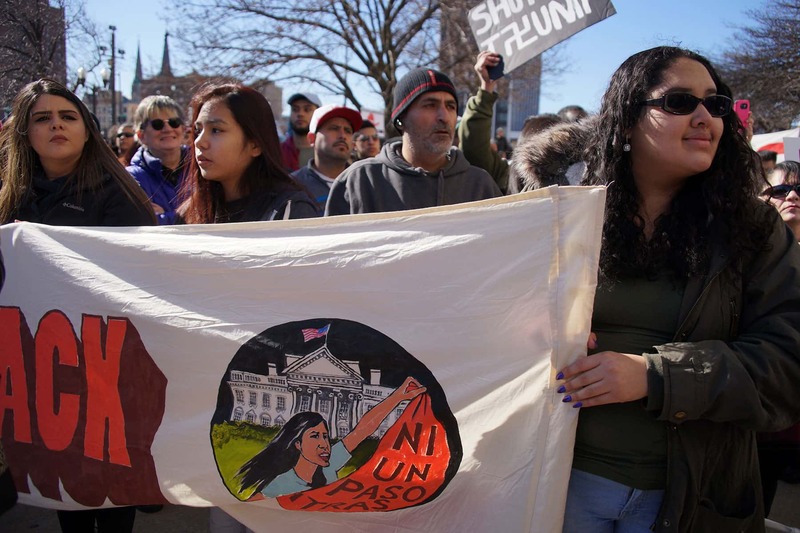 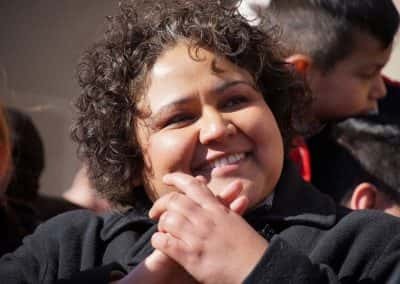 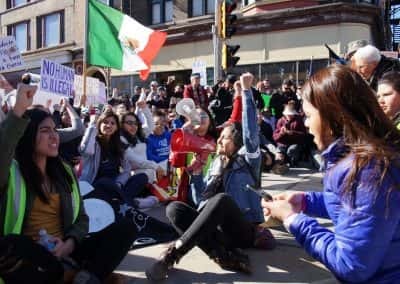 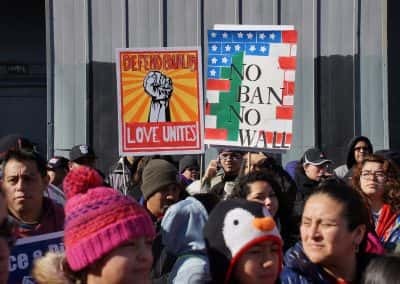 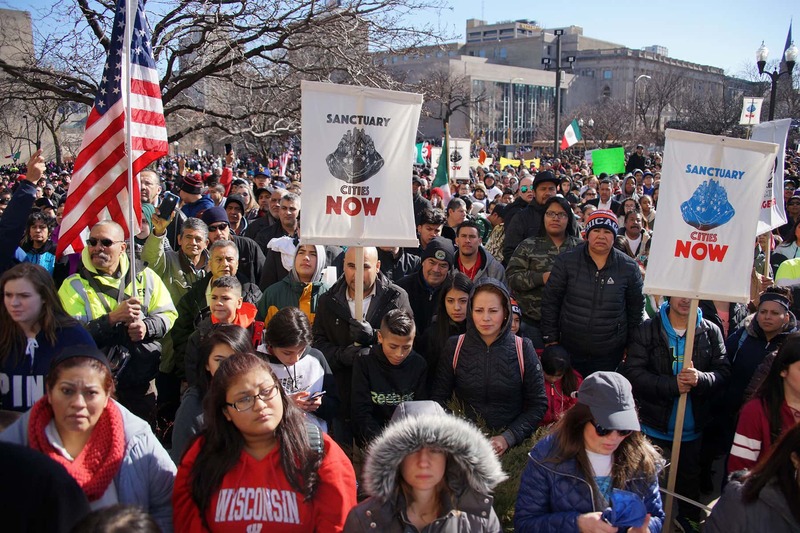 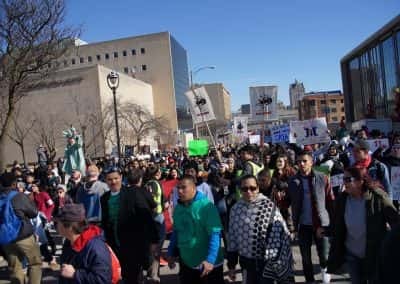 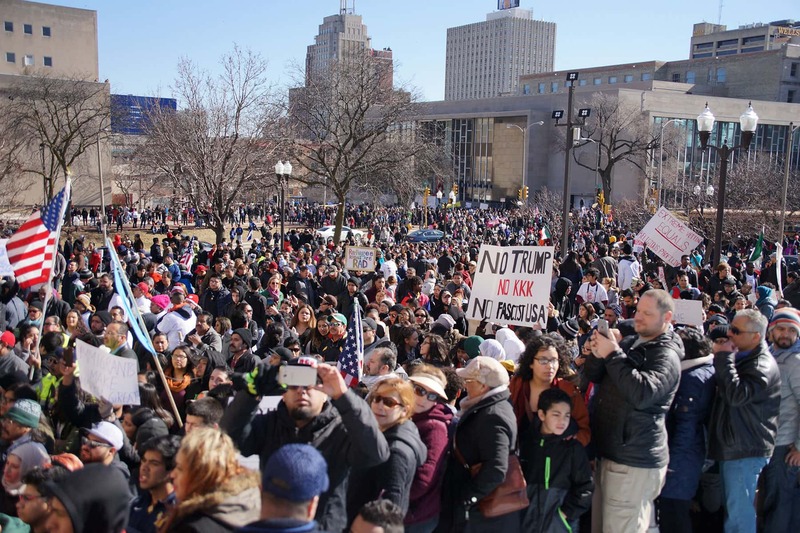 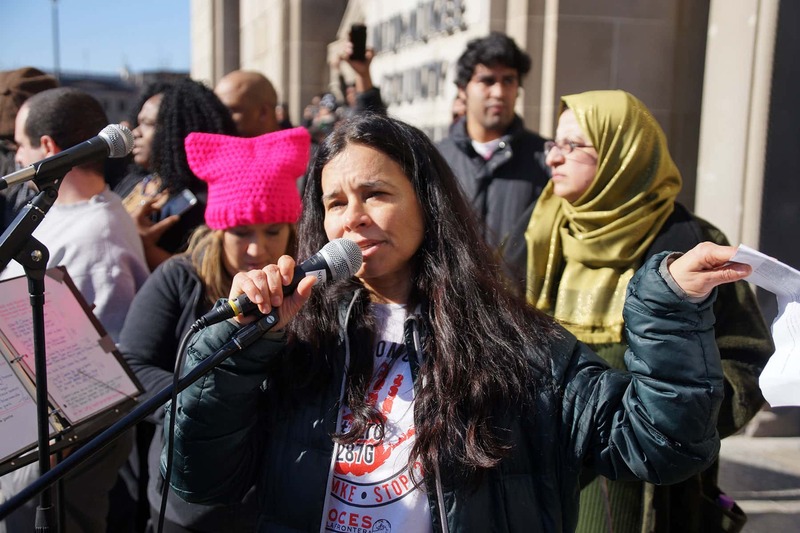 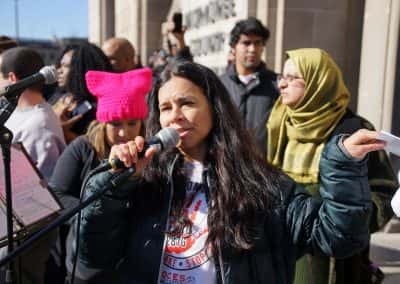 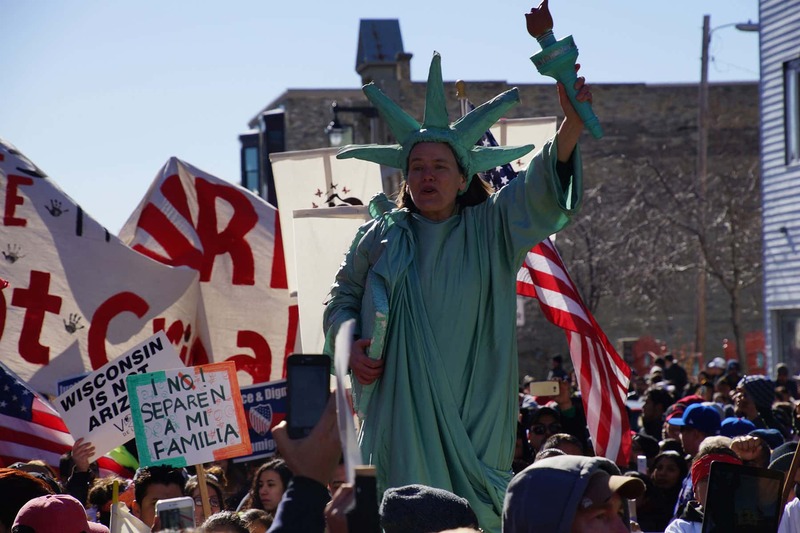 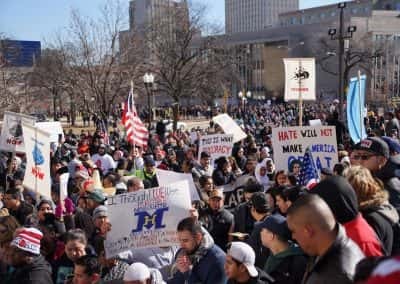 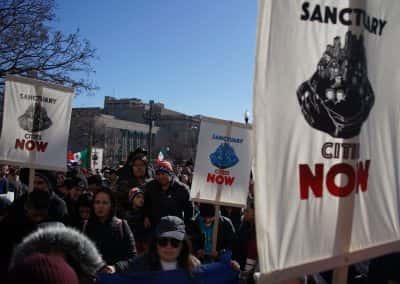 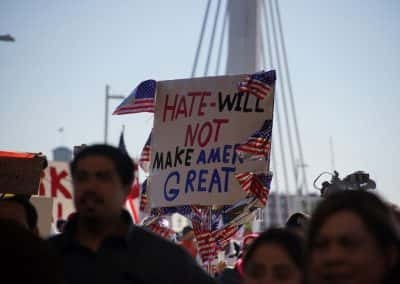 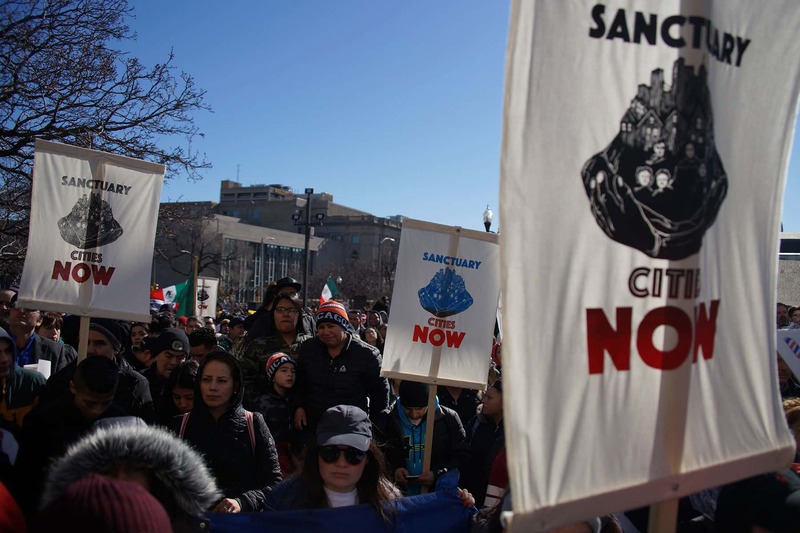 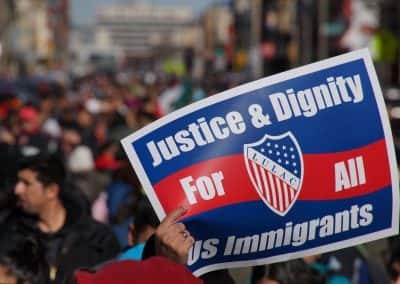 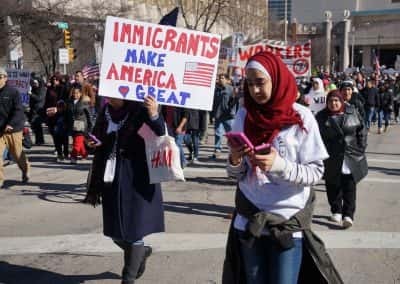 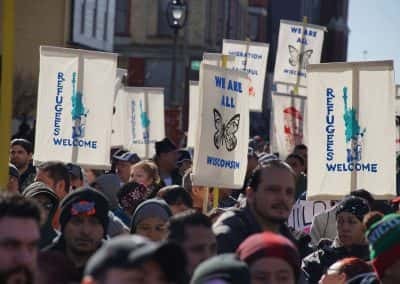 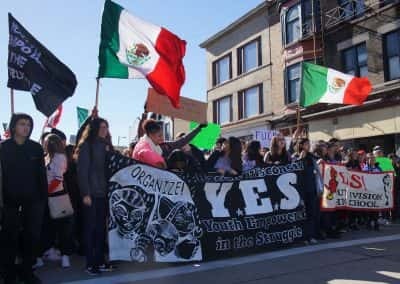 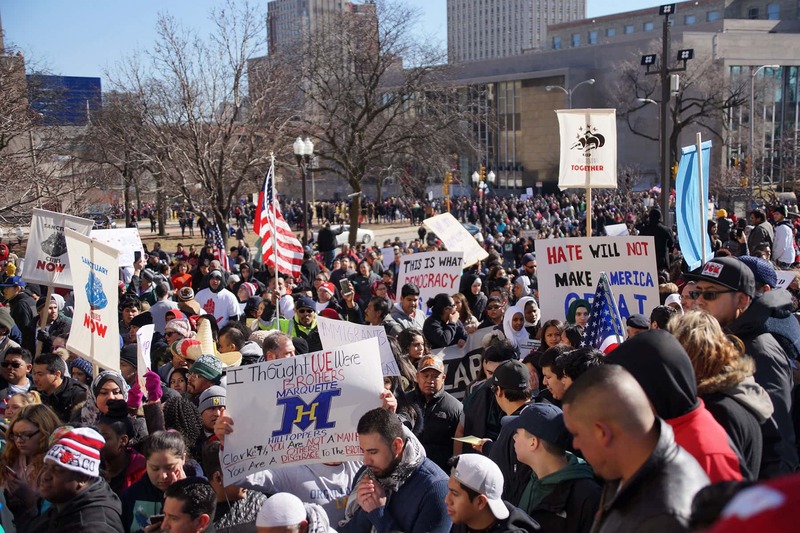 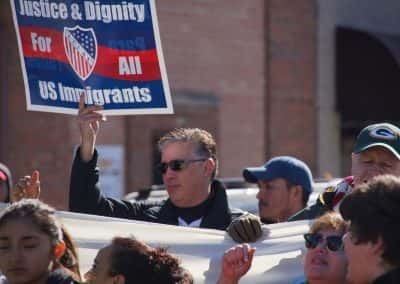 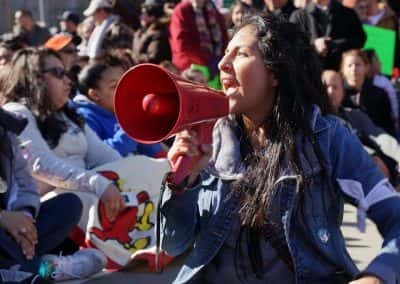 A similar protest took place a year ago in Madison, that brought thousands of Hispanics and others to the state Capitol to oppose Anti-Immigration legislation. 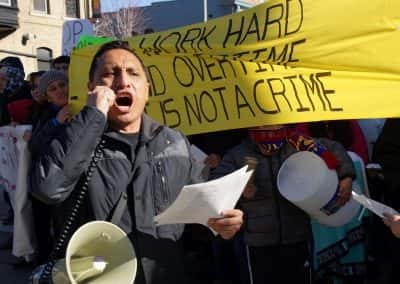 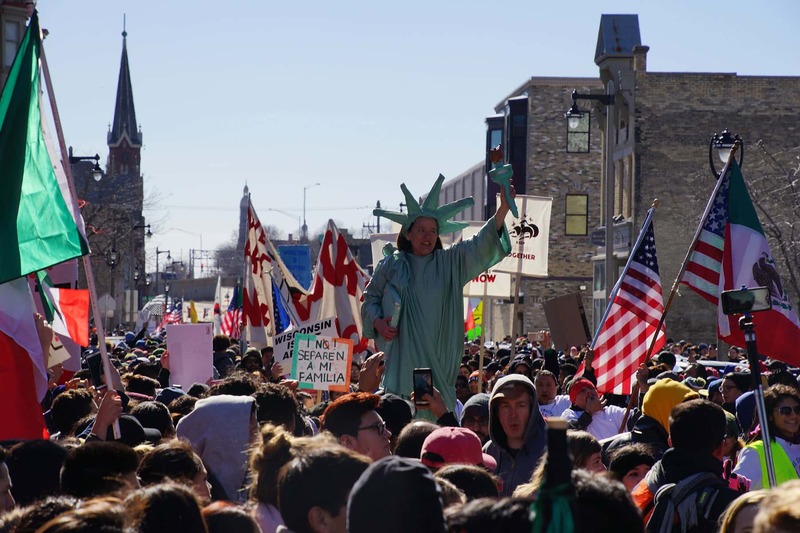 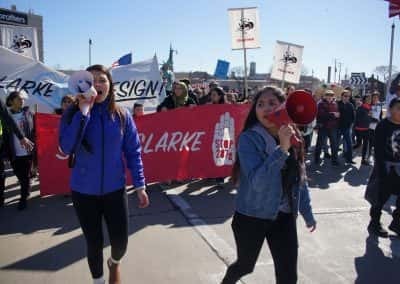 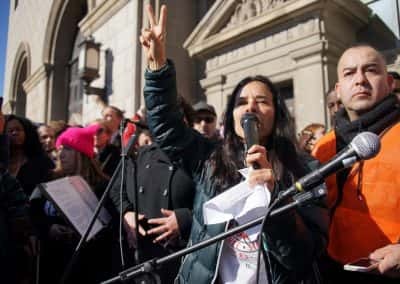 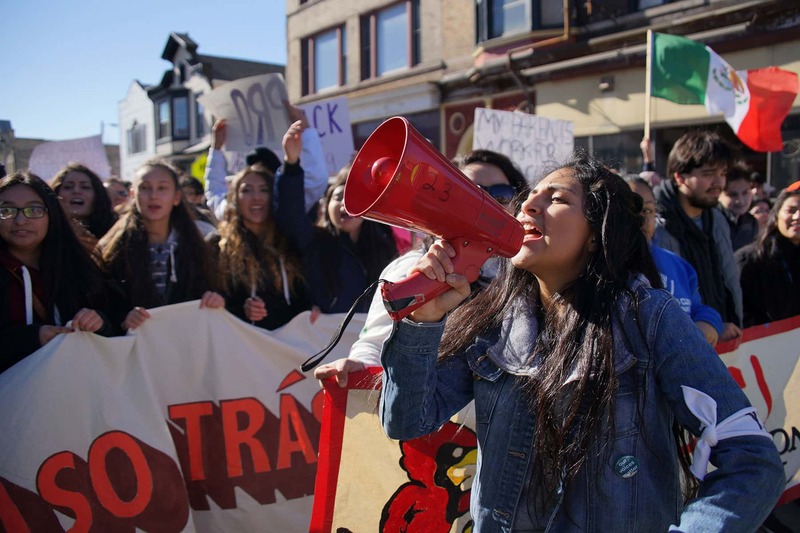 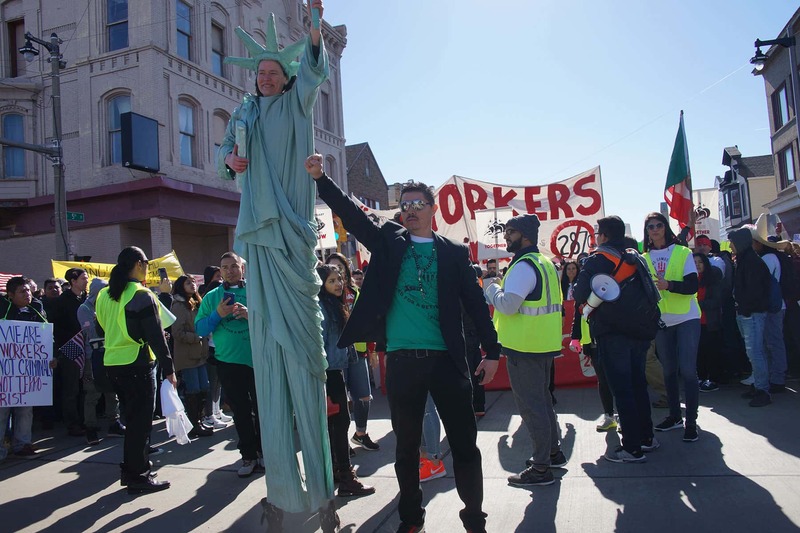 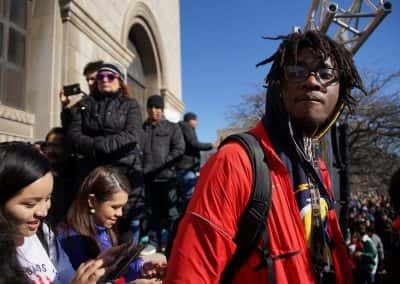 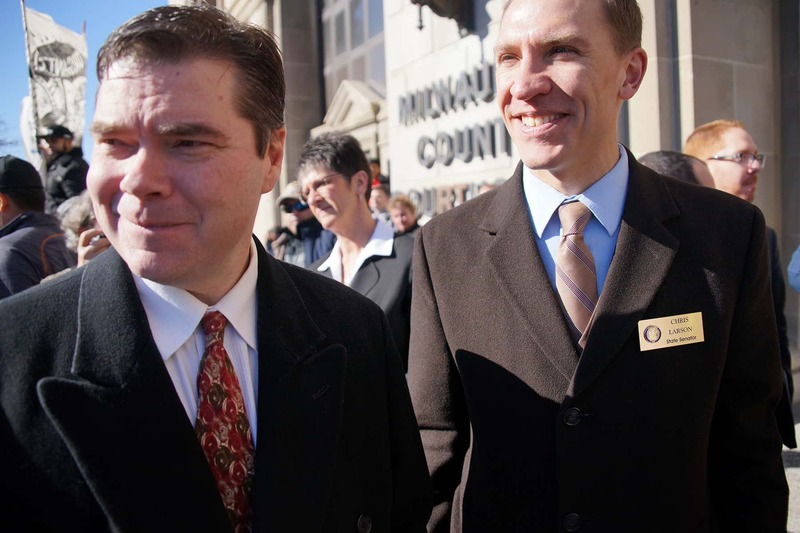 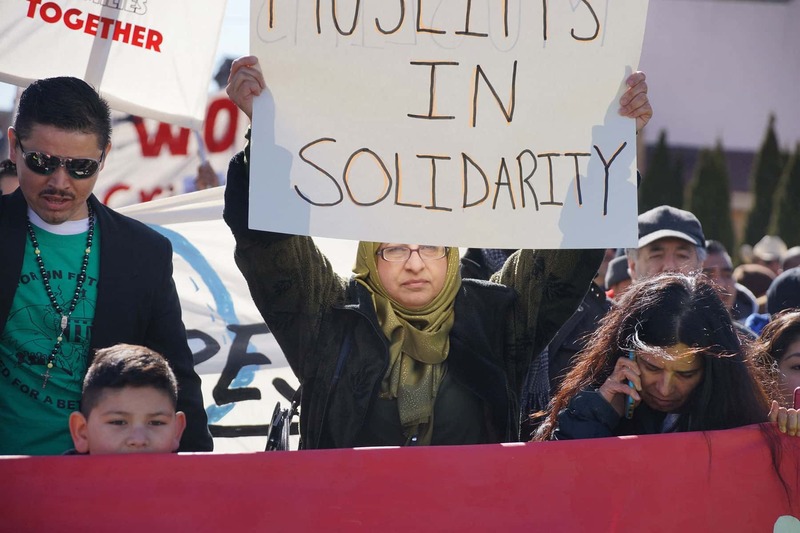 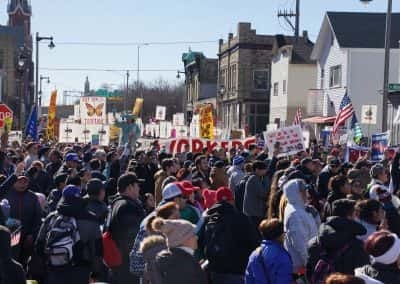 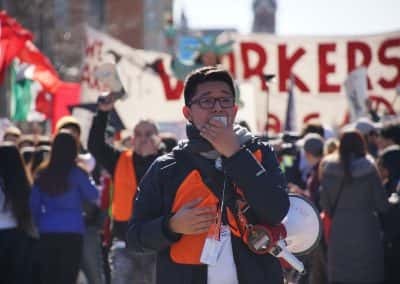 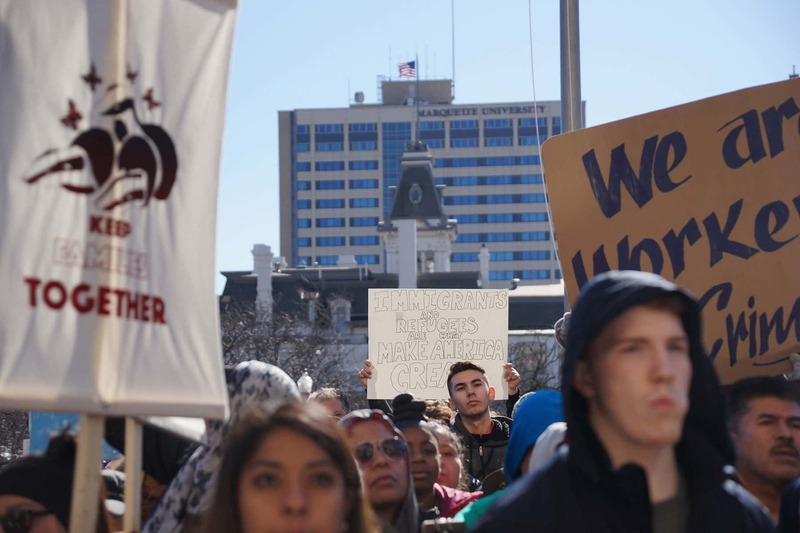 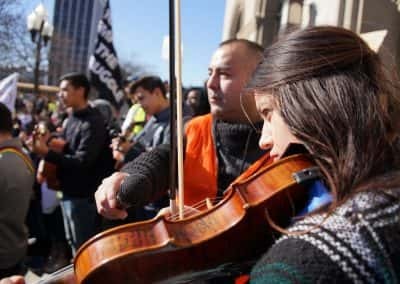 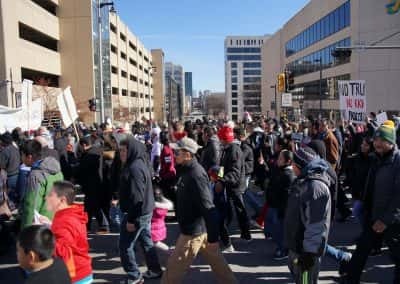 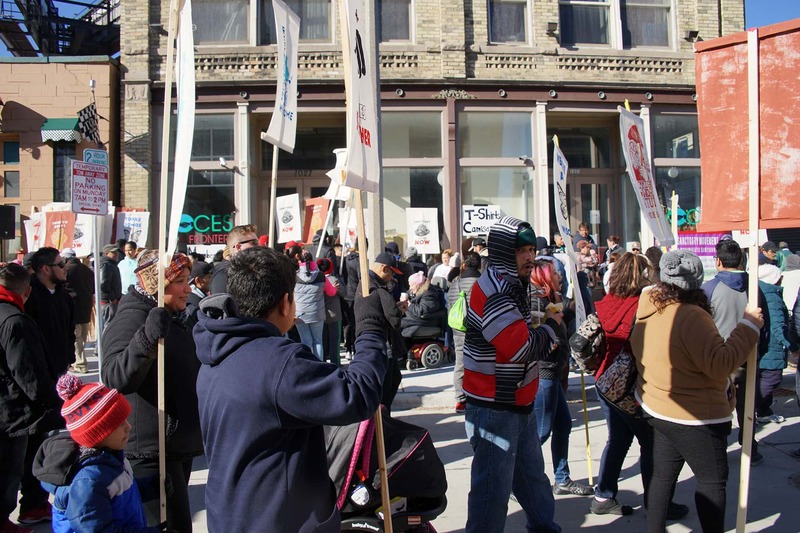 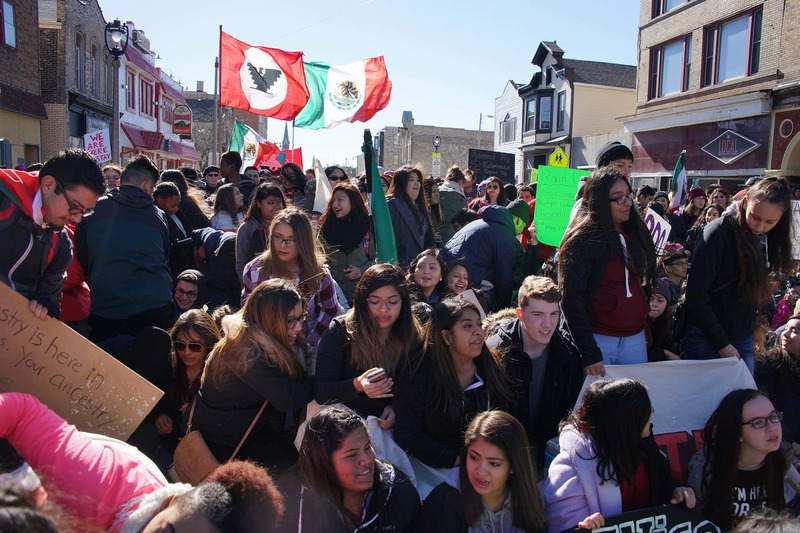 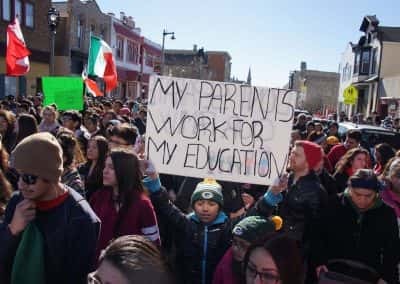 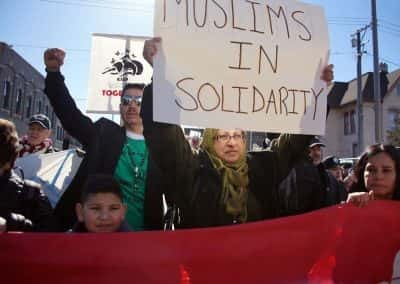 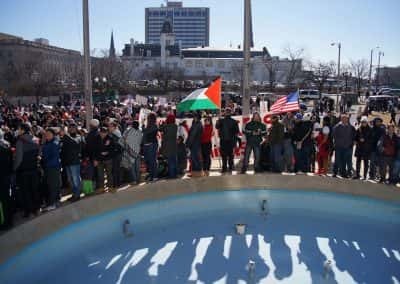 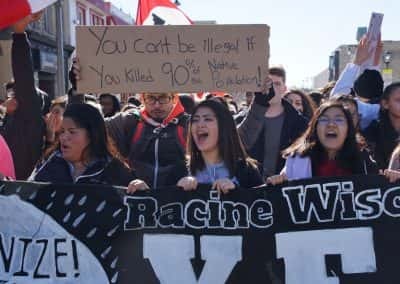 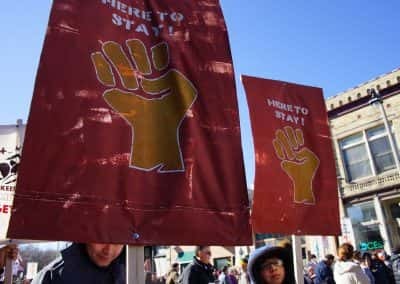 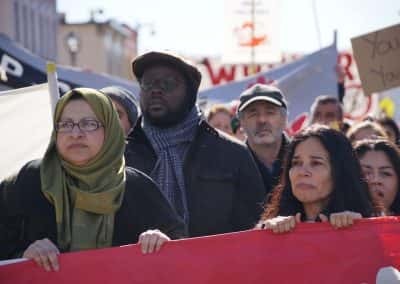 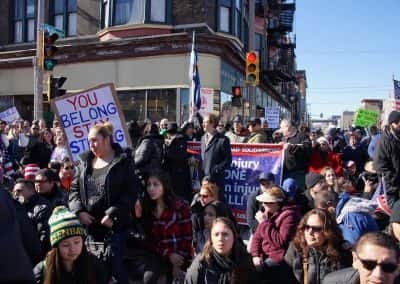 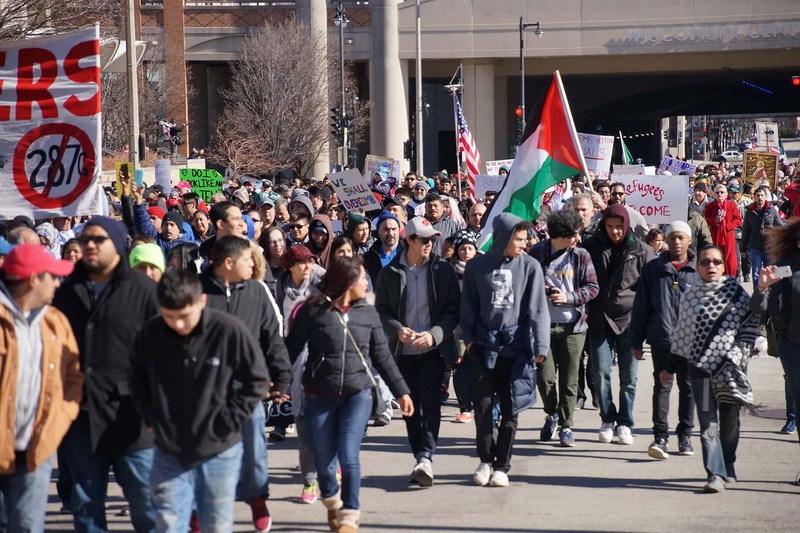 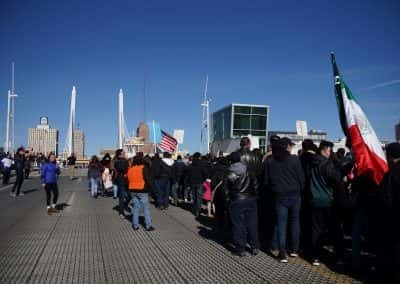 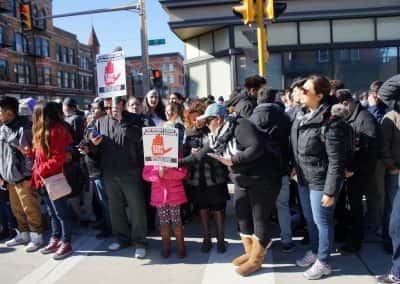 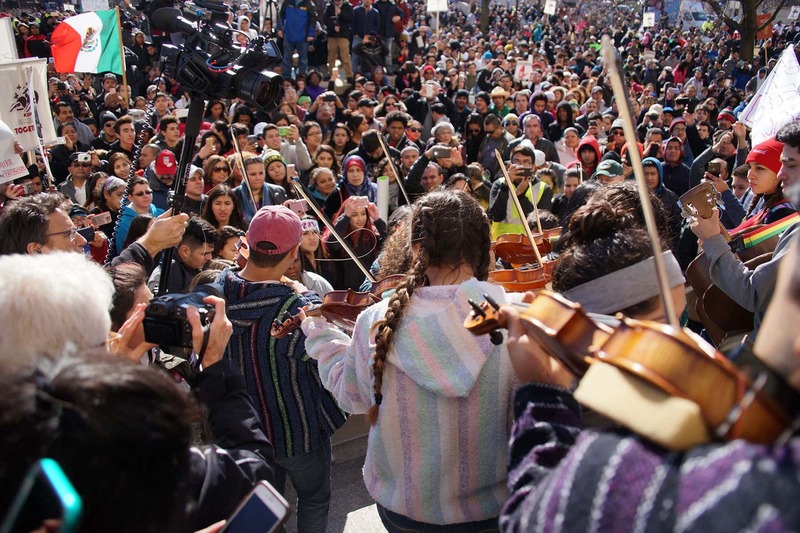 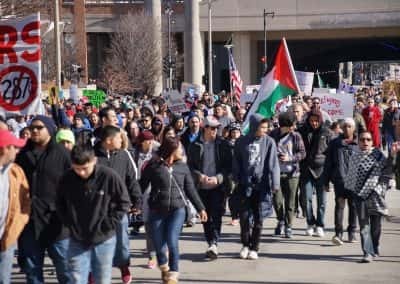 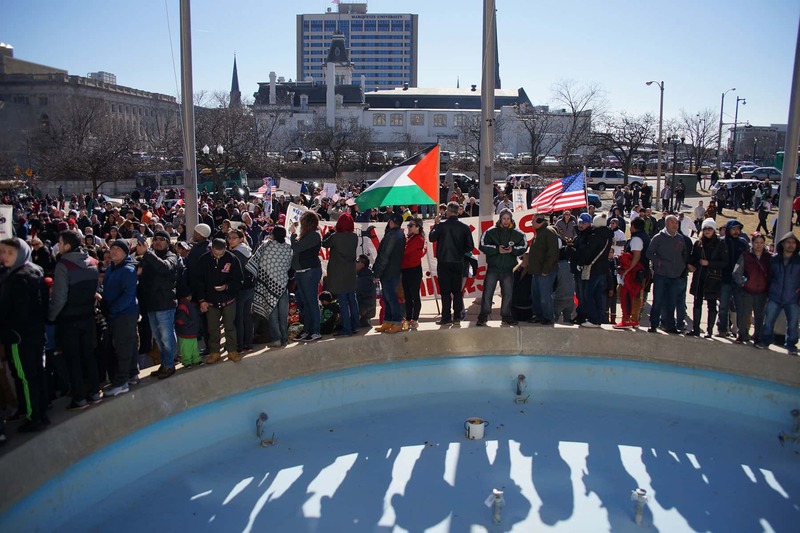 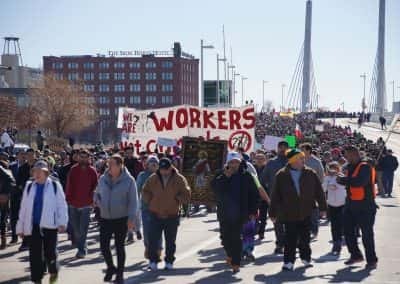 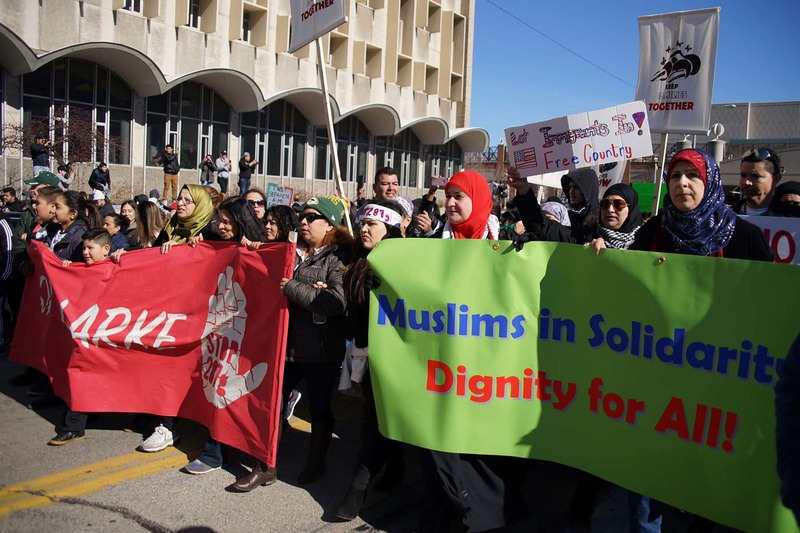 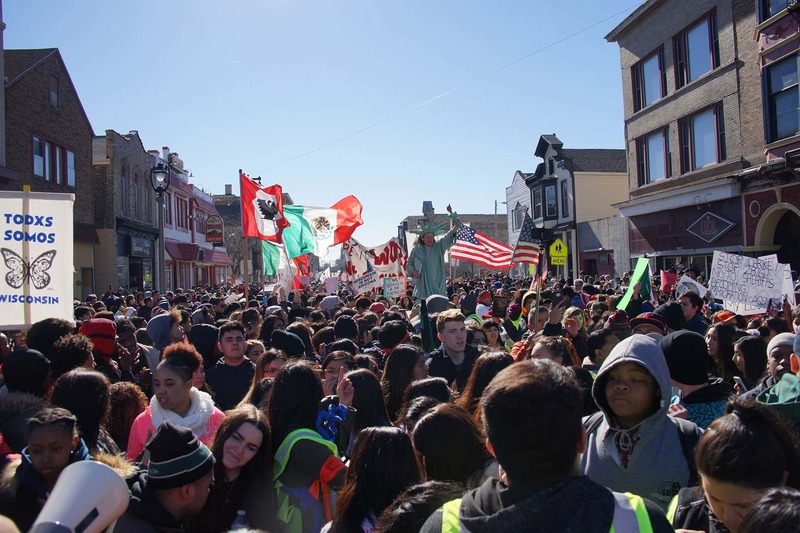 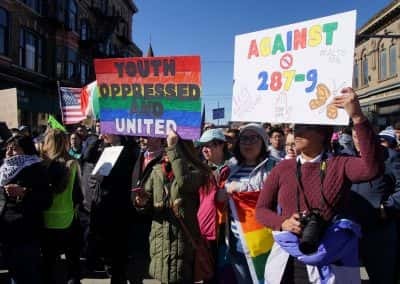 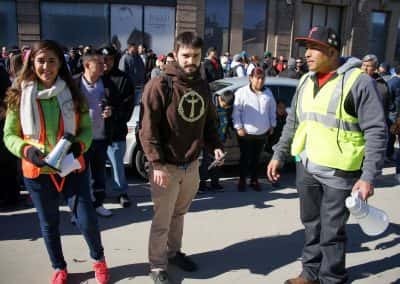 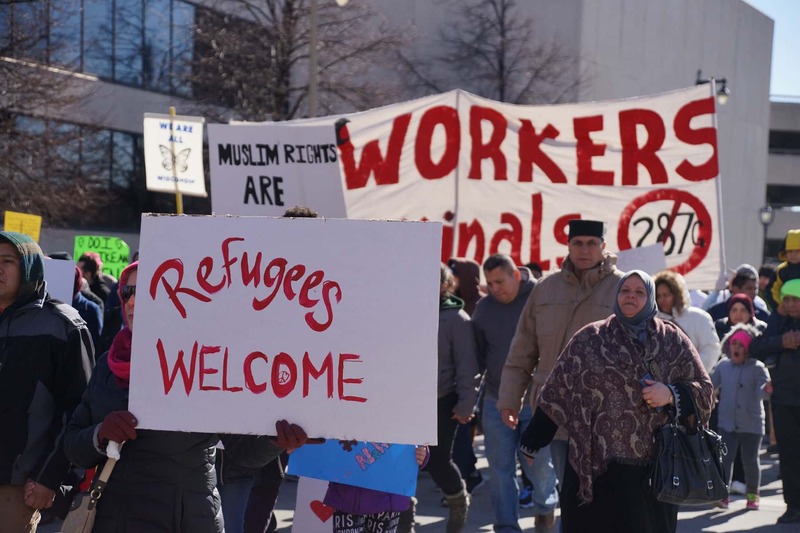 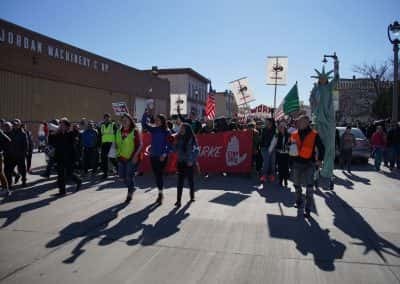 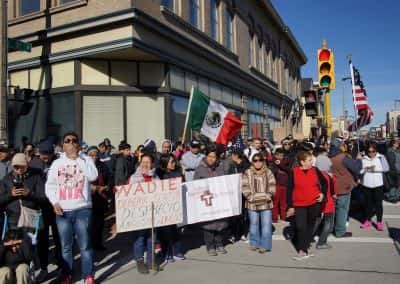 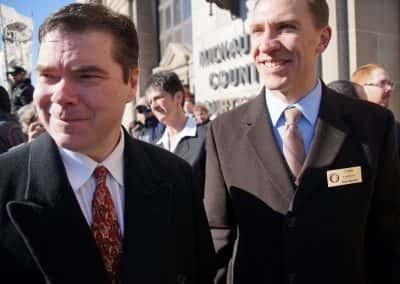 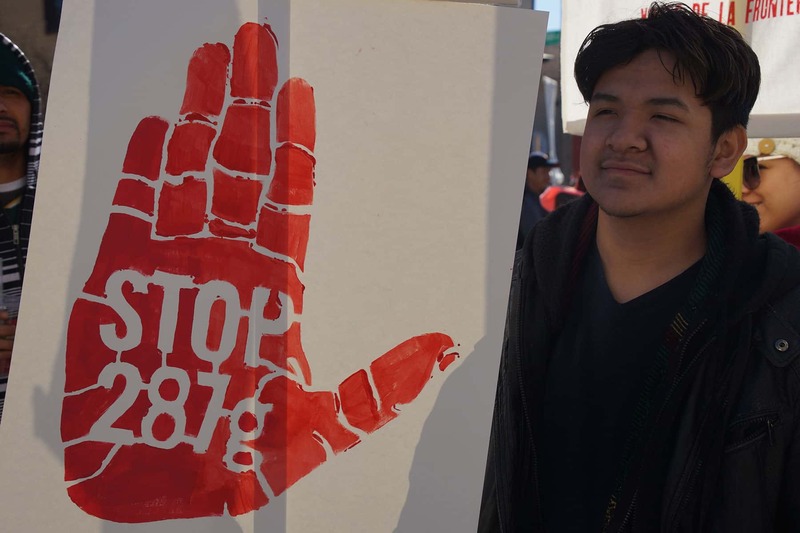 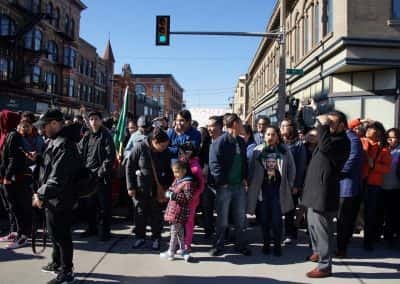 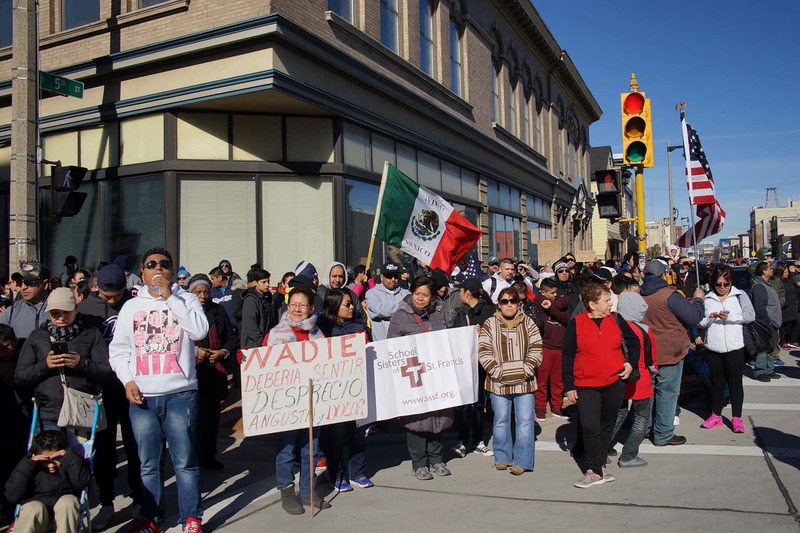 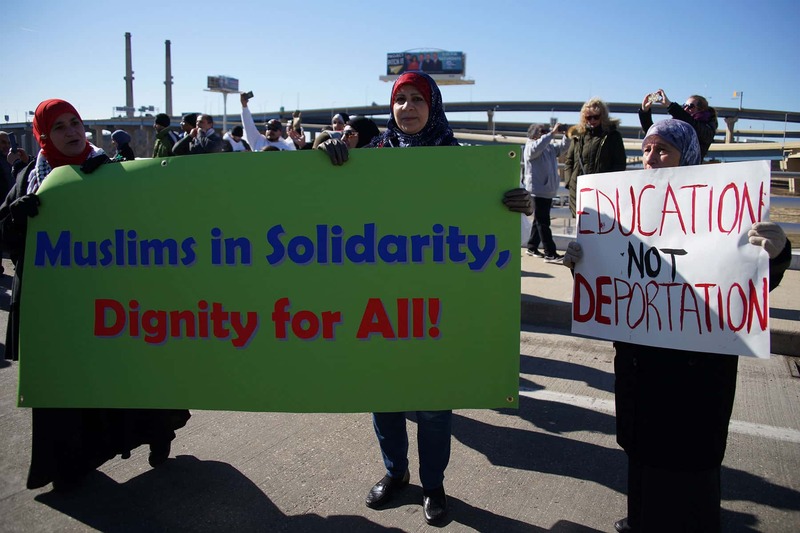 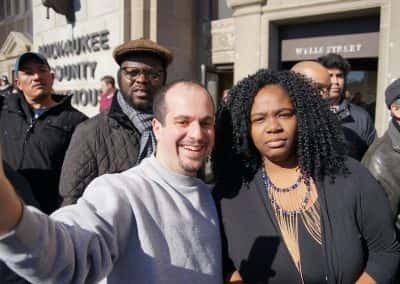 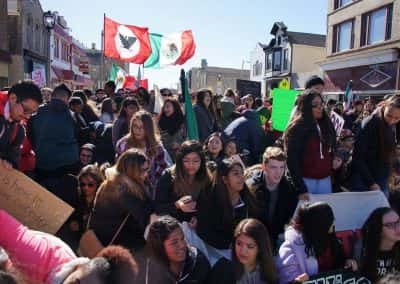 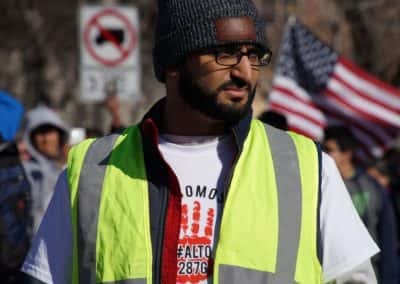 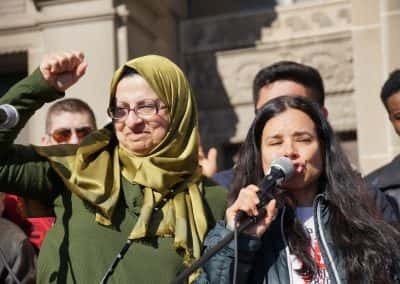 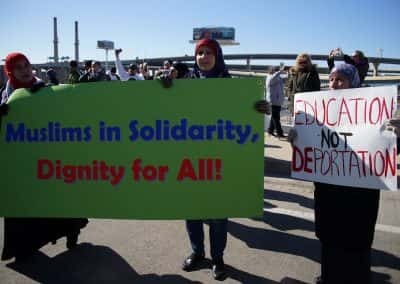 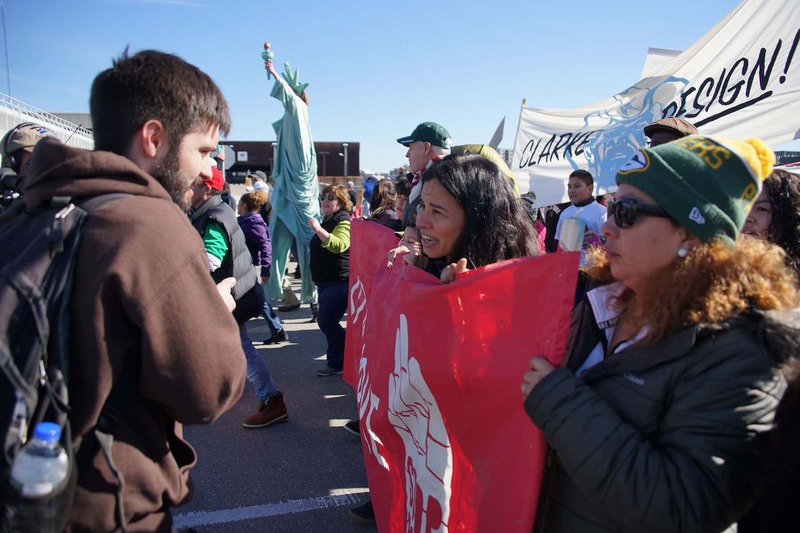 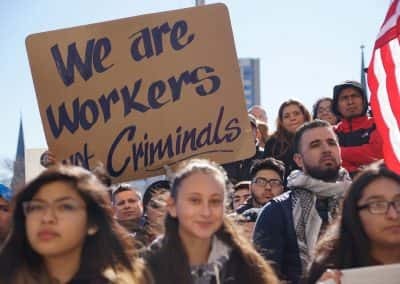 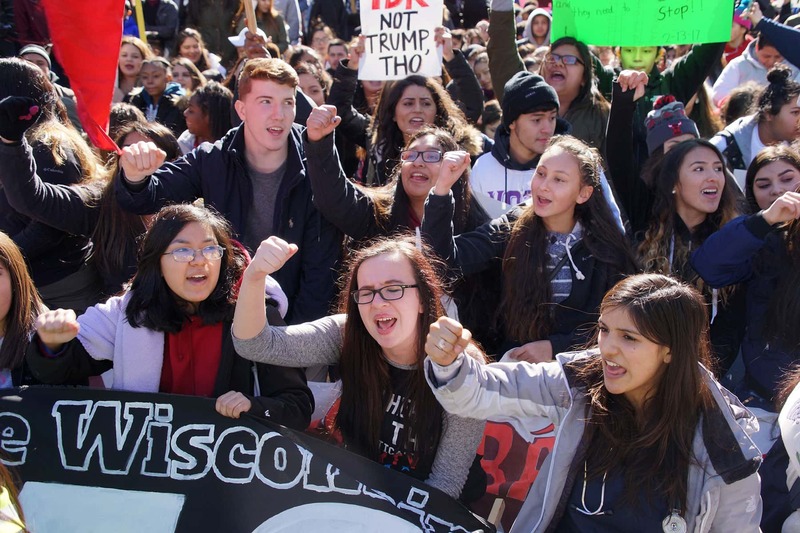 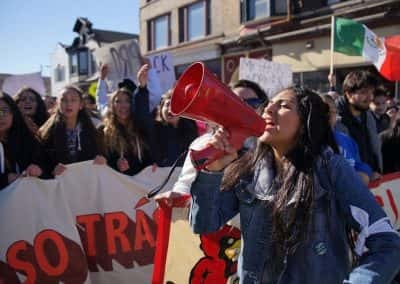 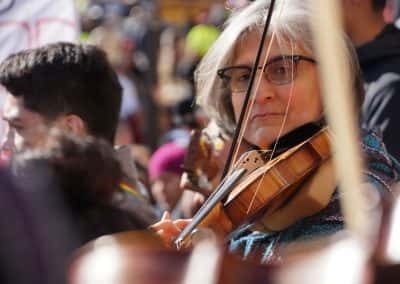 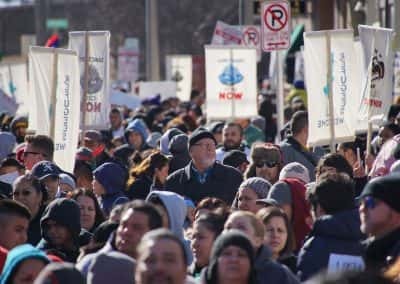 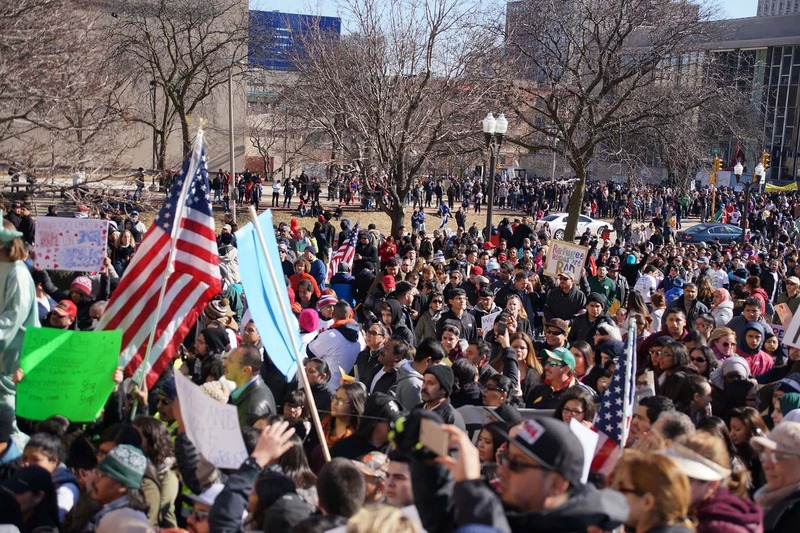 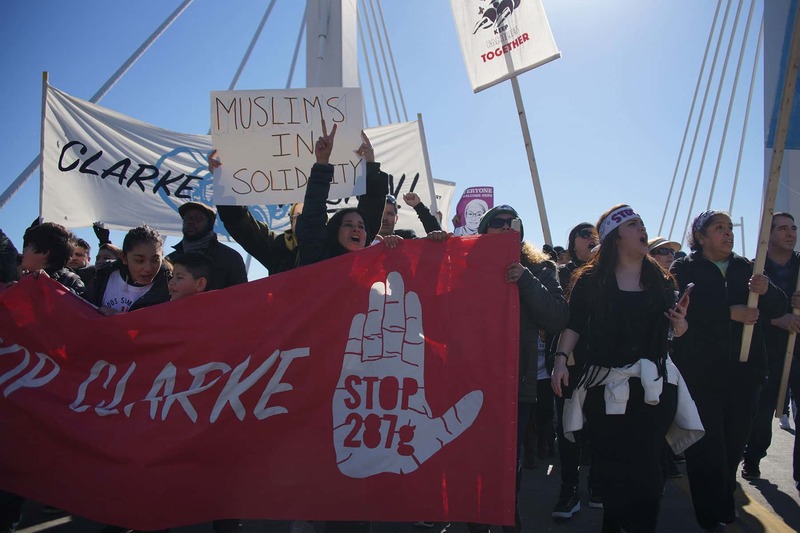 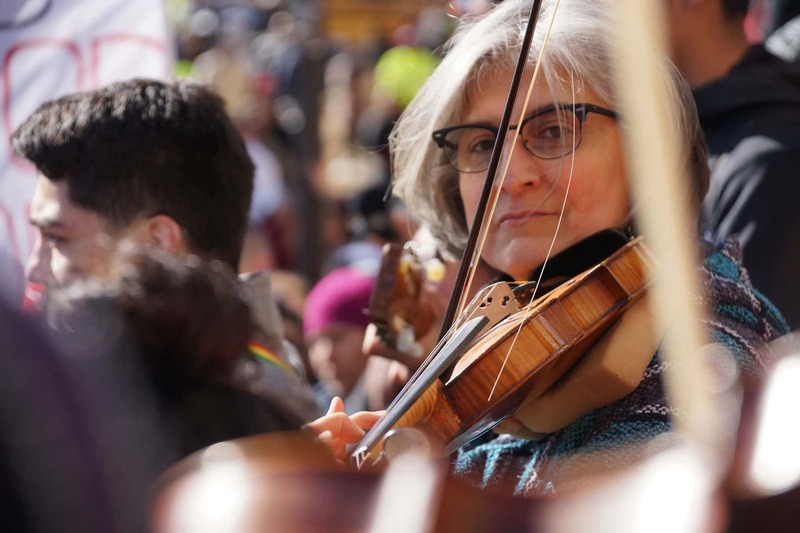 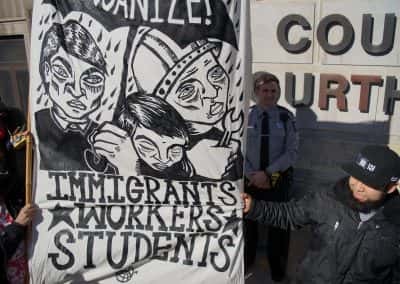 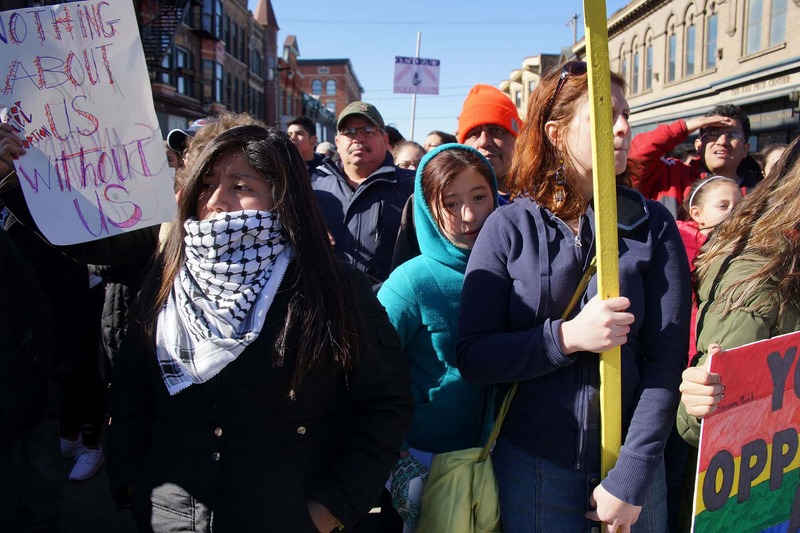 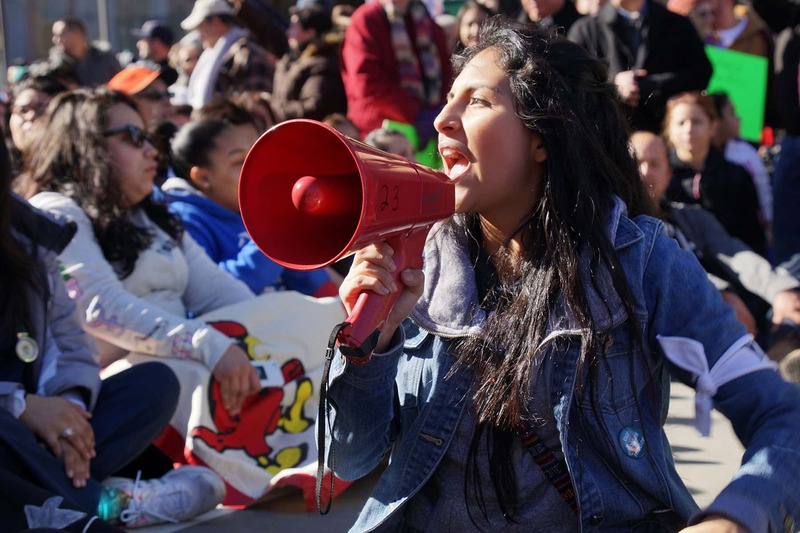 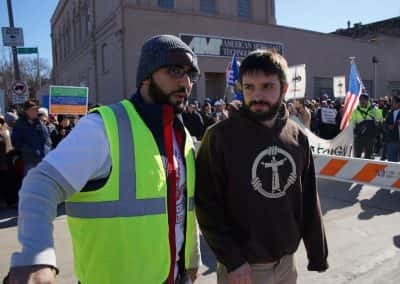 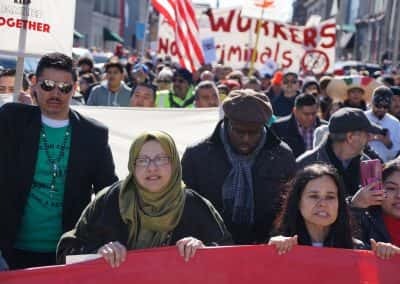 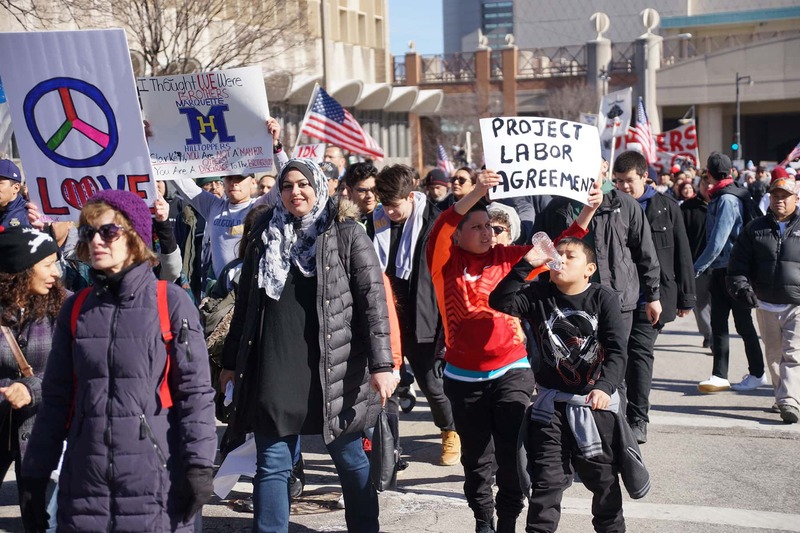 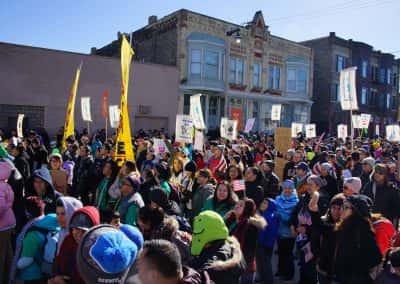 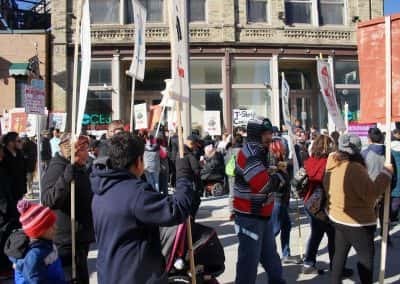 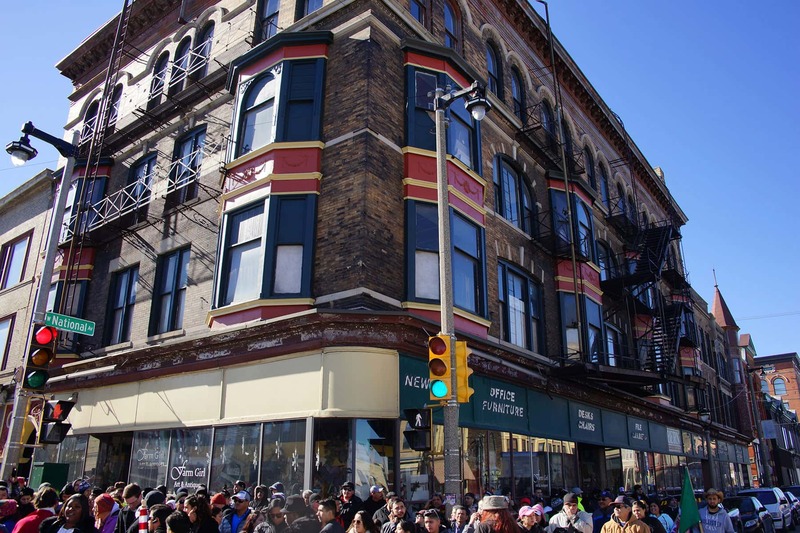 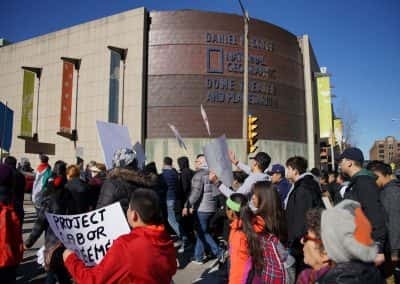 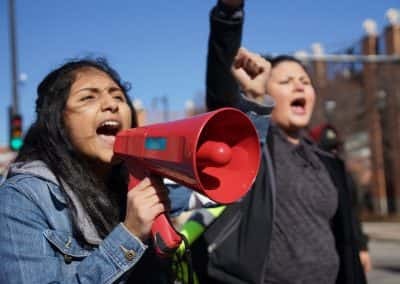 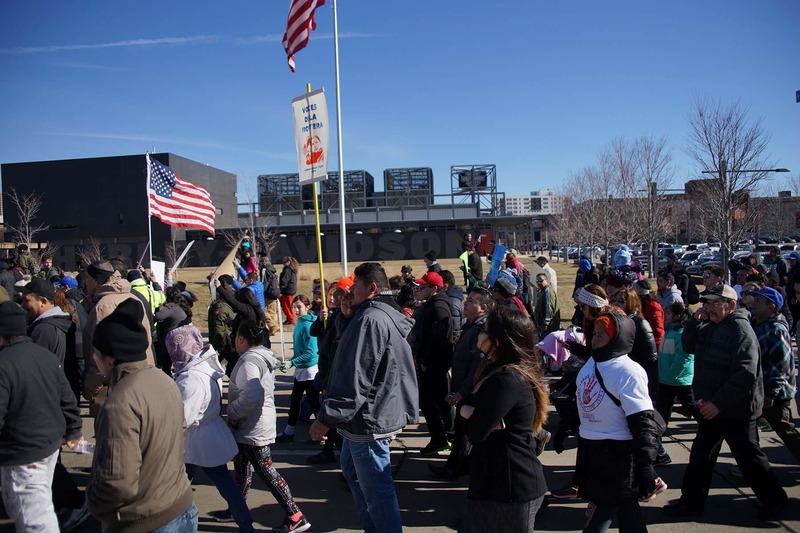 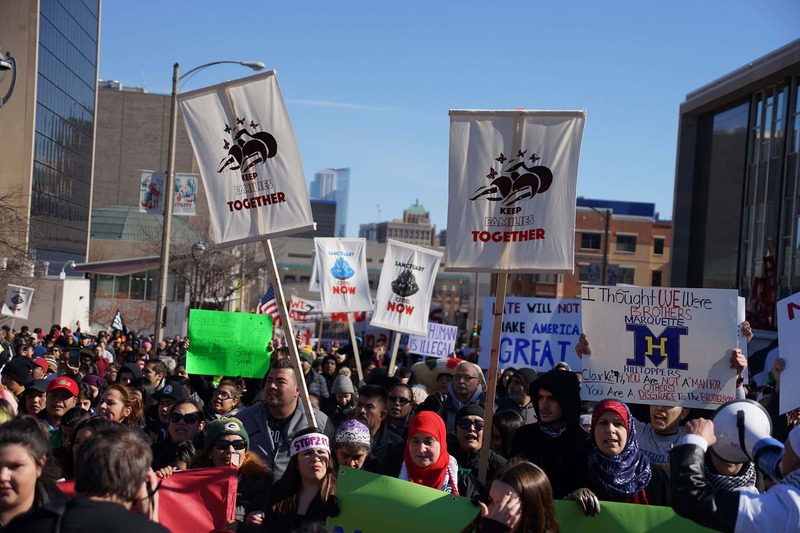 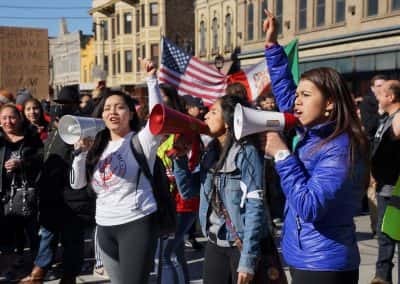 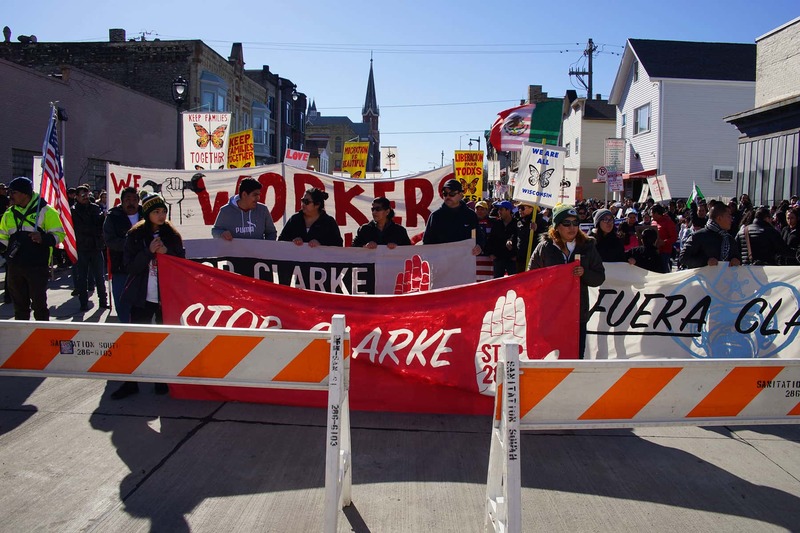 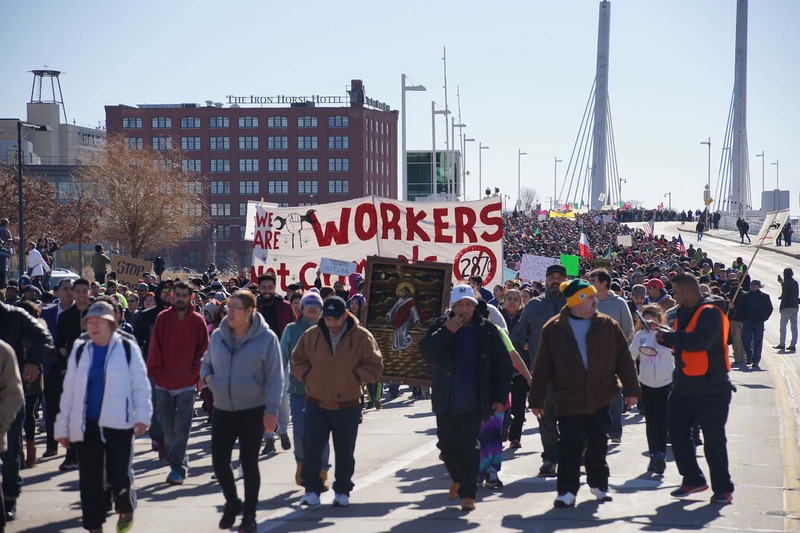 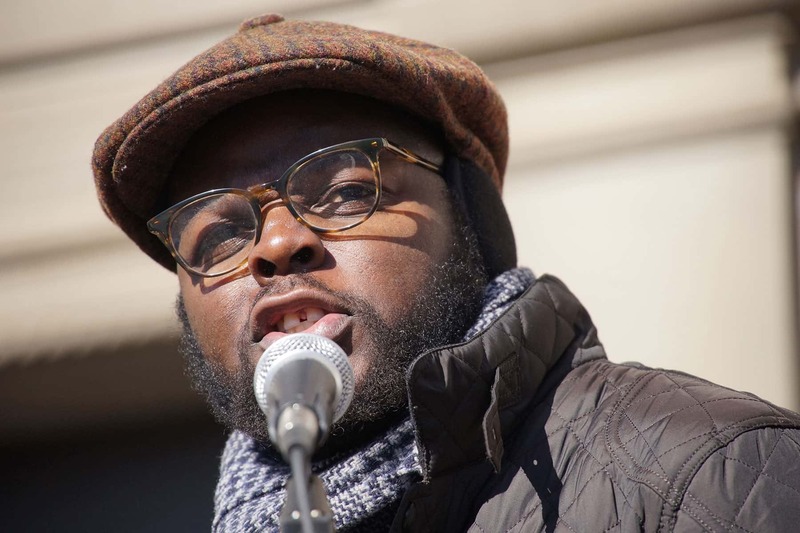 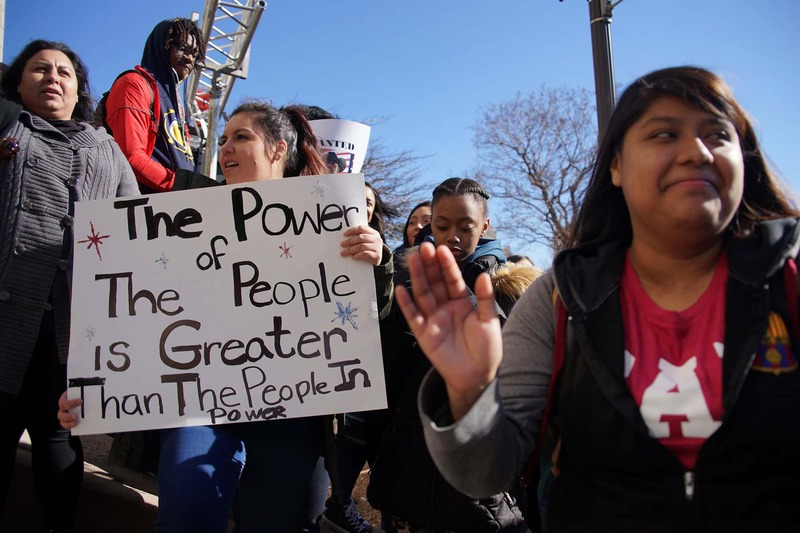 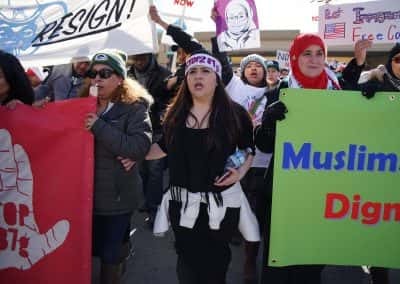 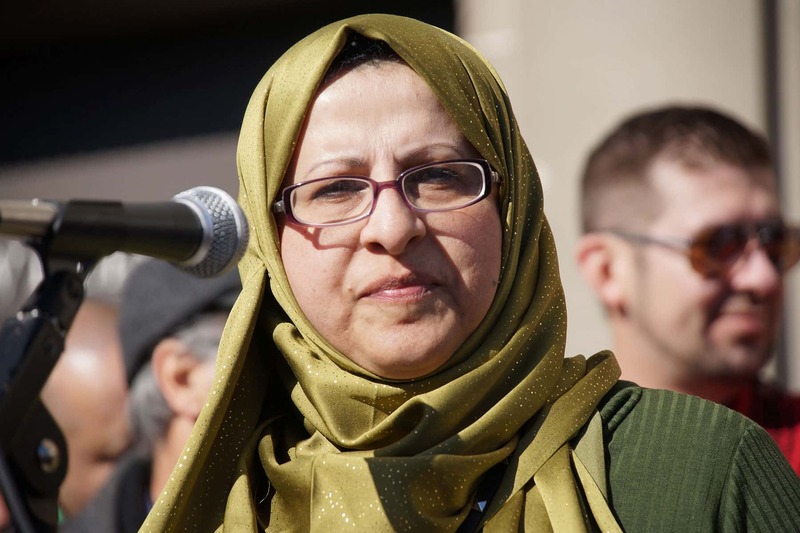 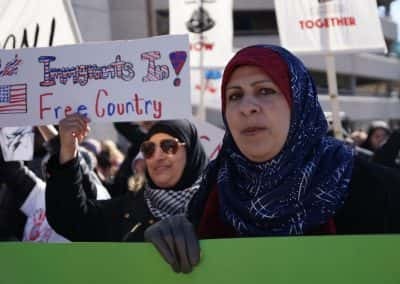 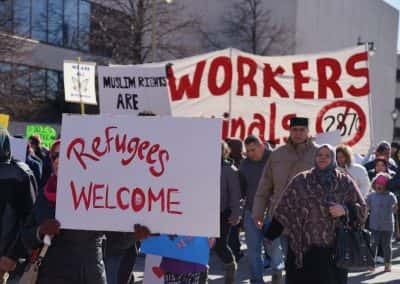 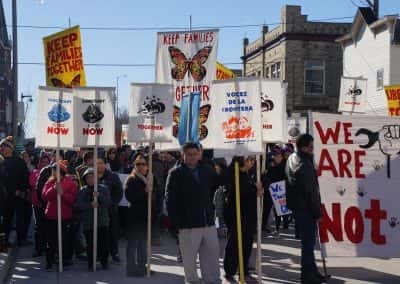 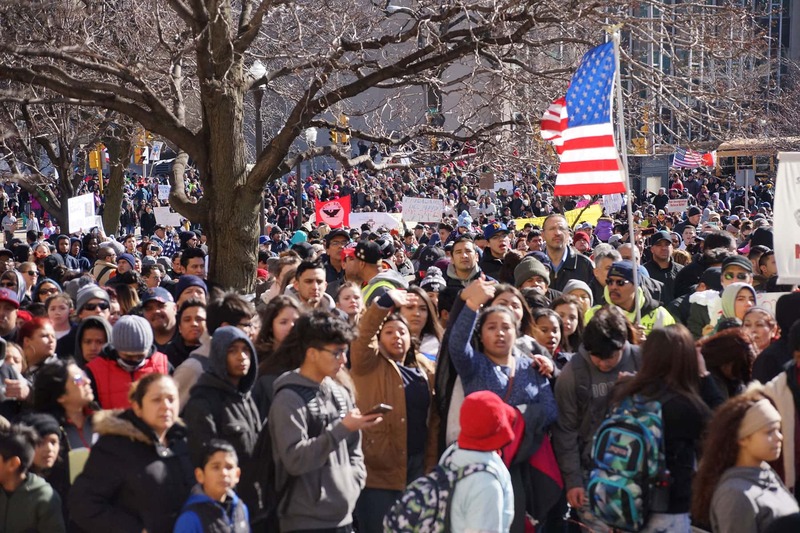 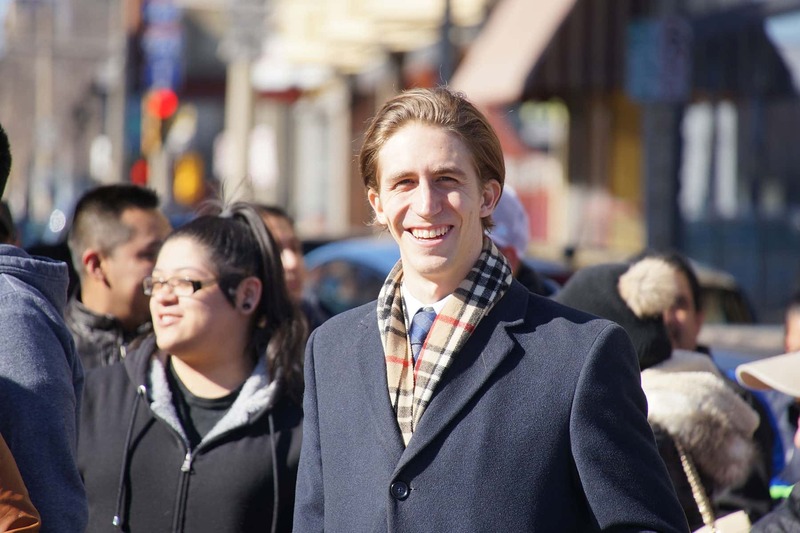 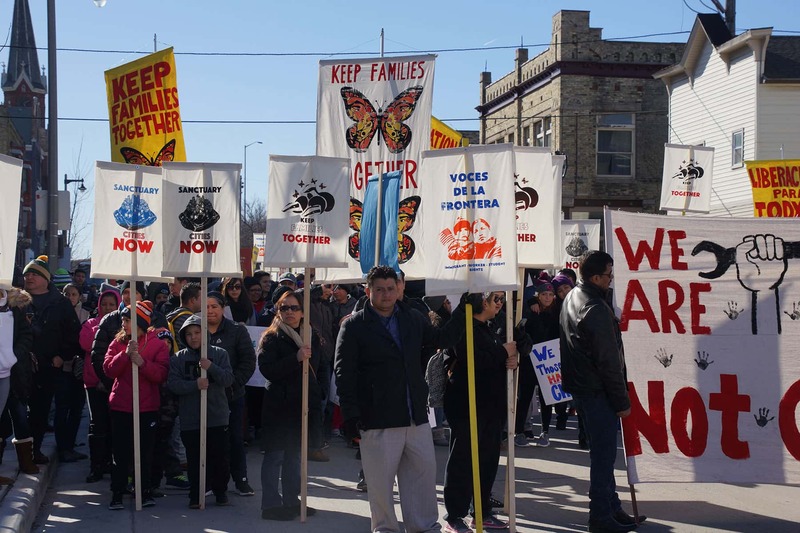 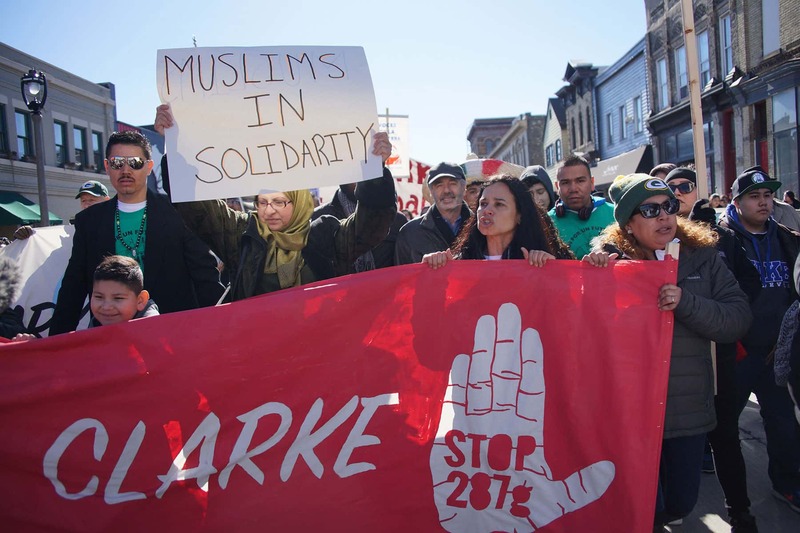 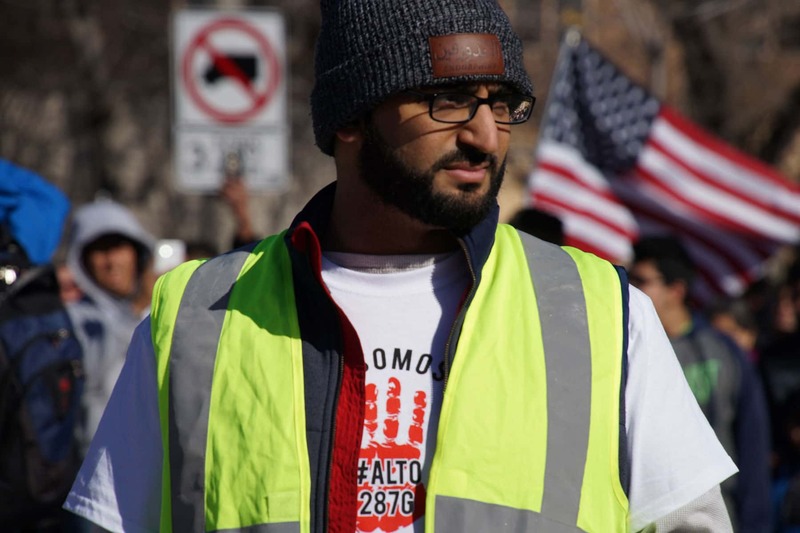 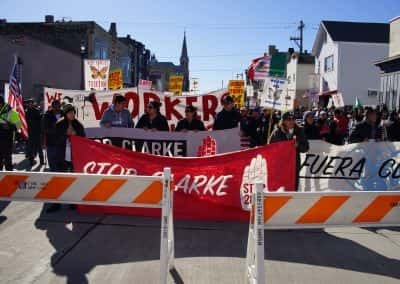 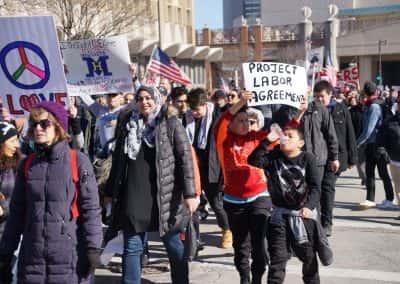 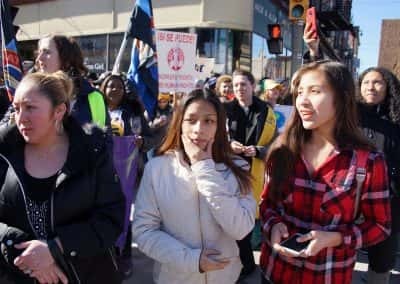 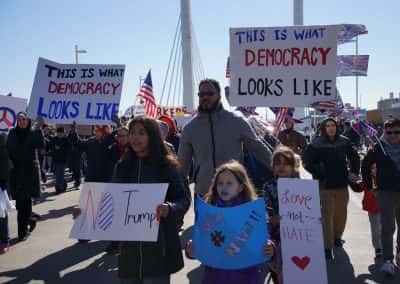 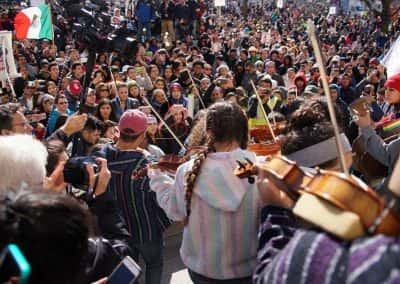 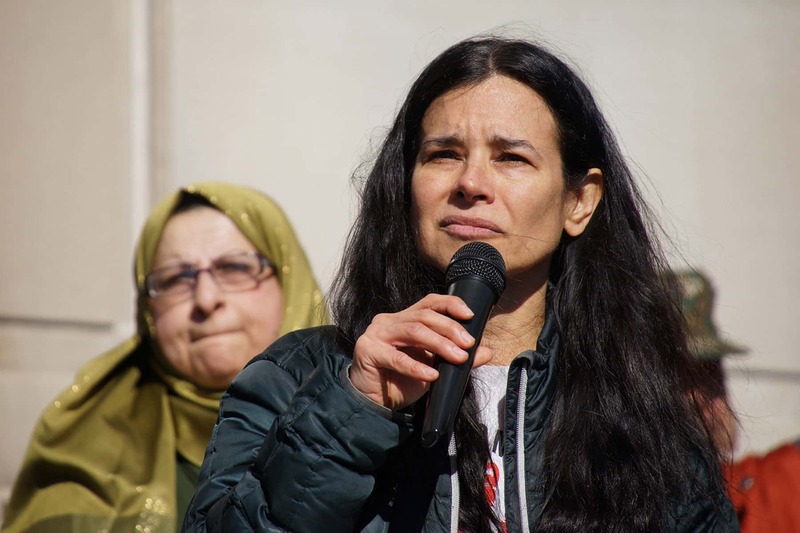 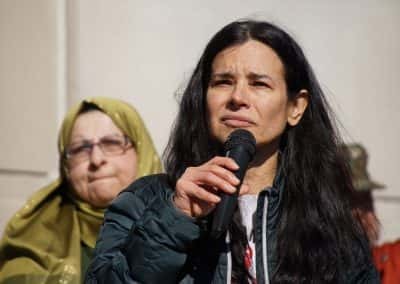 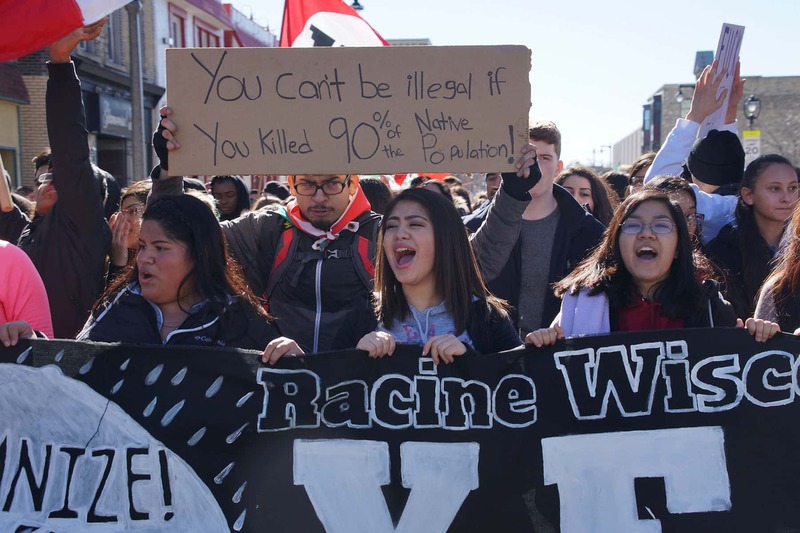 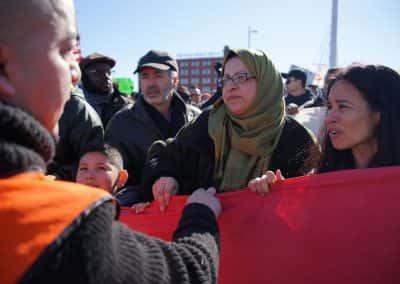 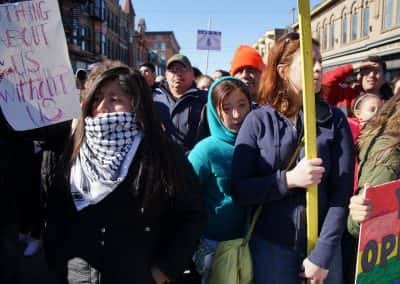 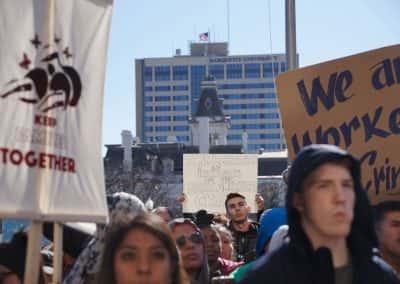 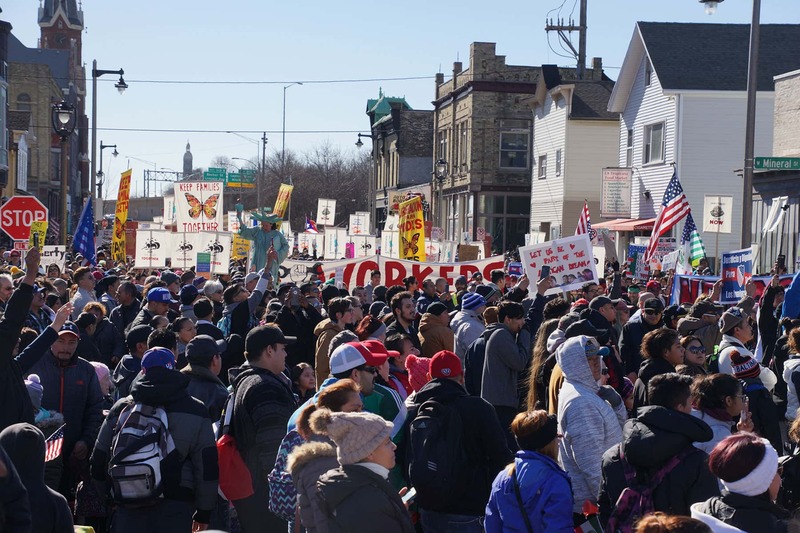 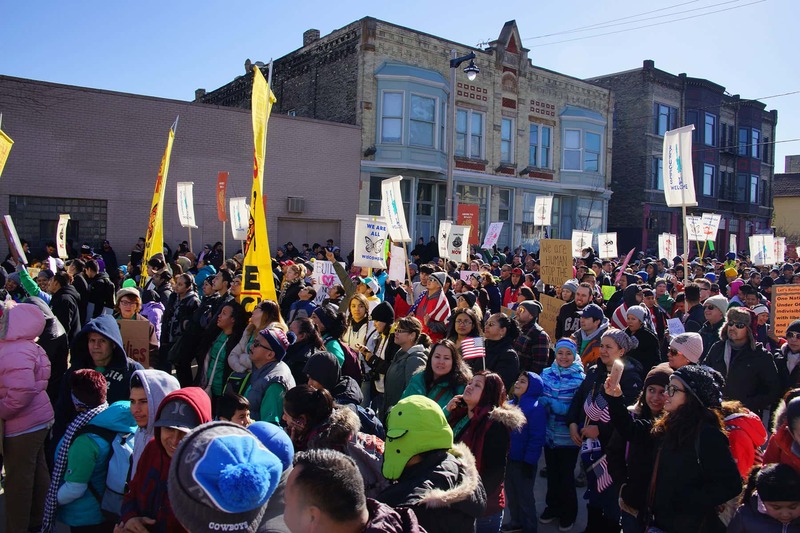 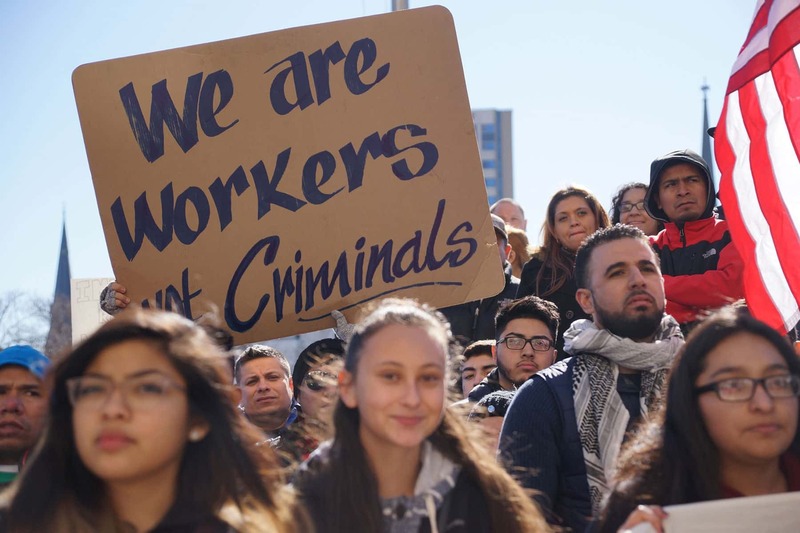 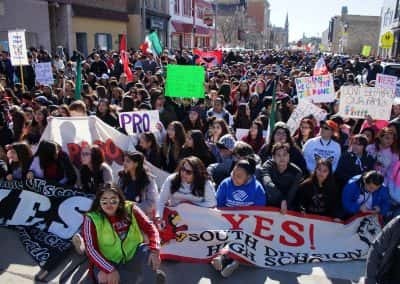 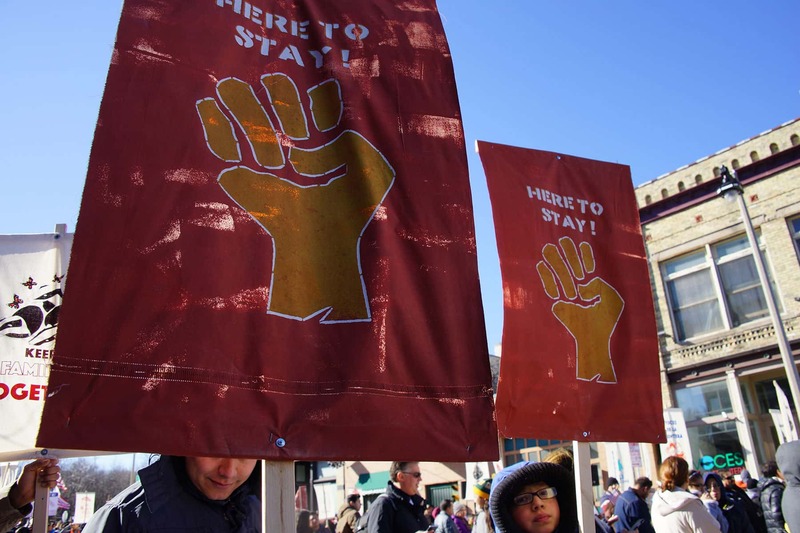 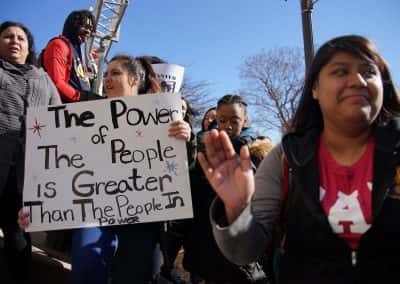 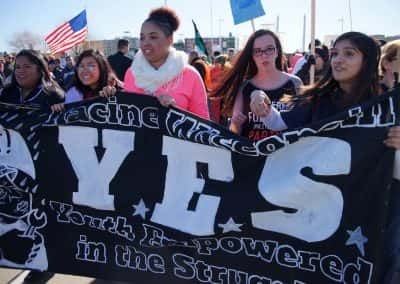 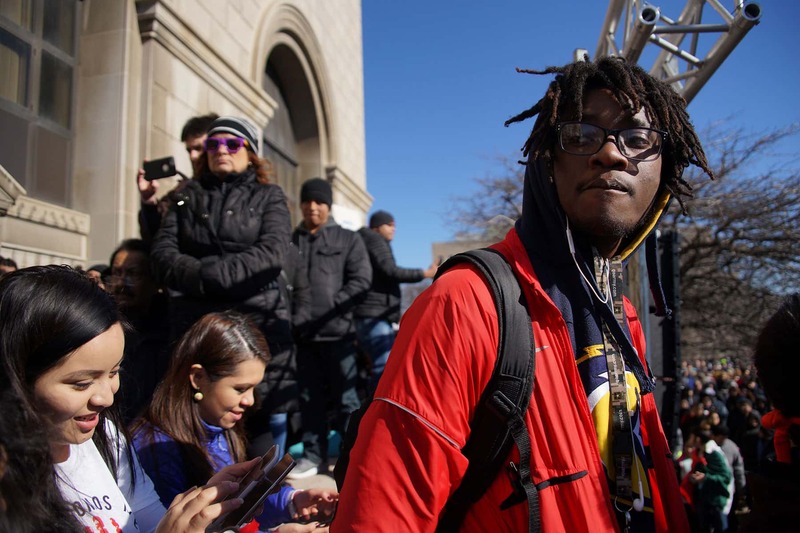 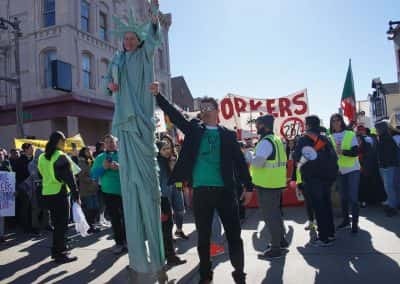 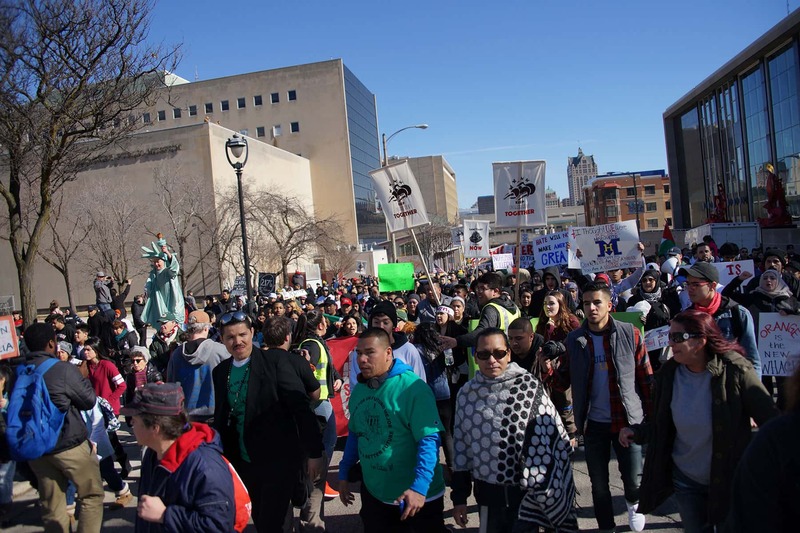 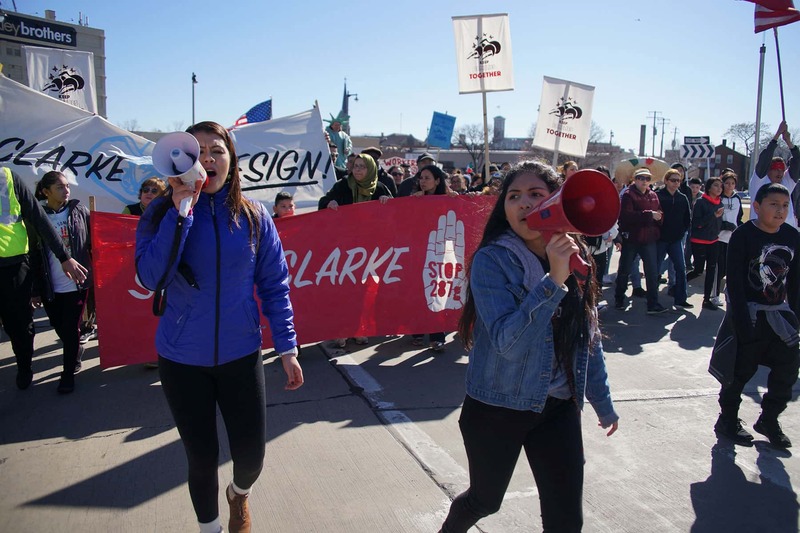 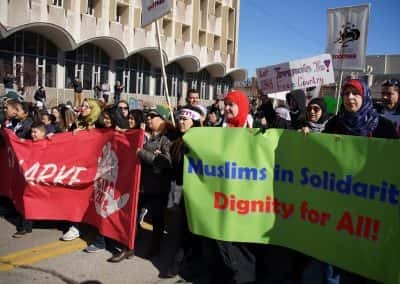 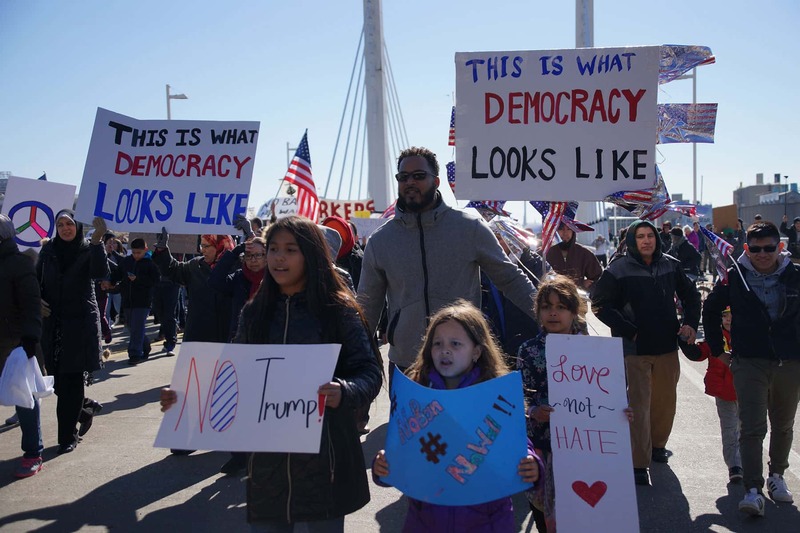 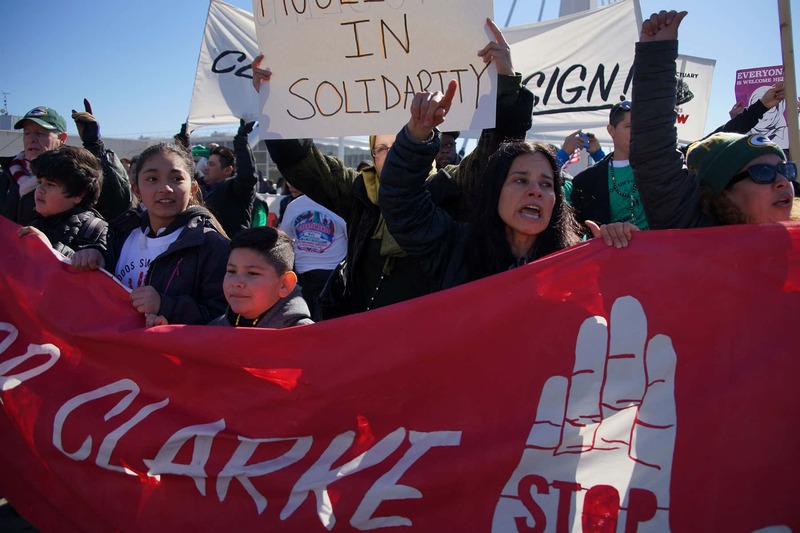 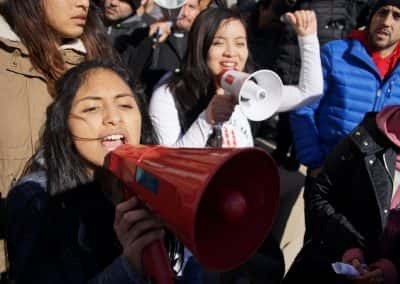 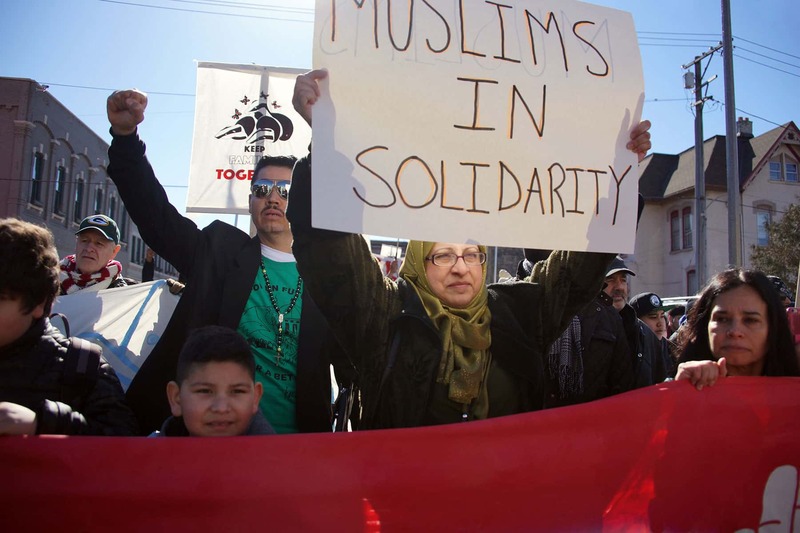 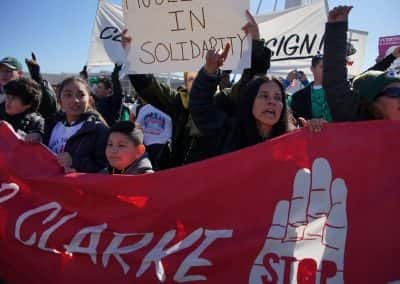 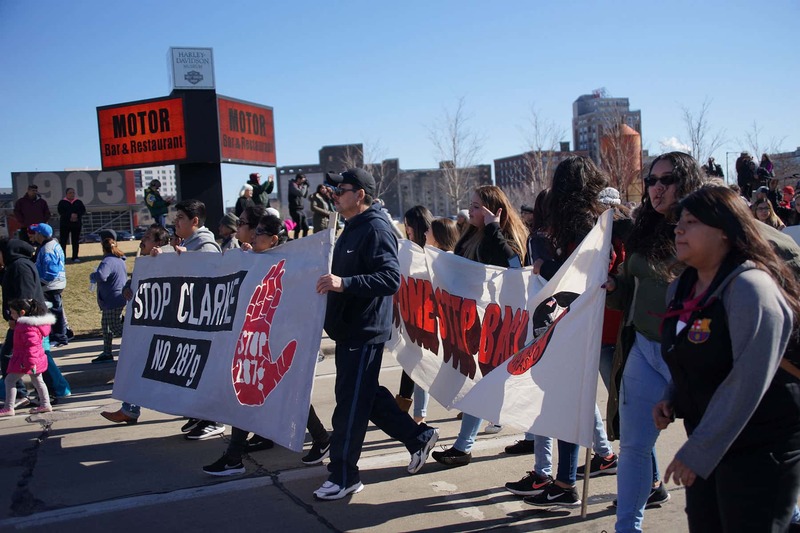 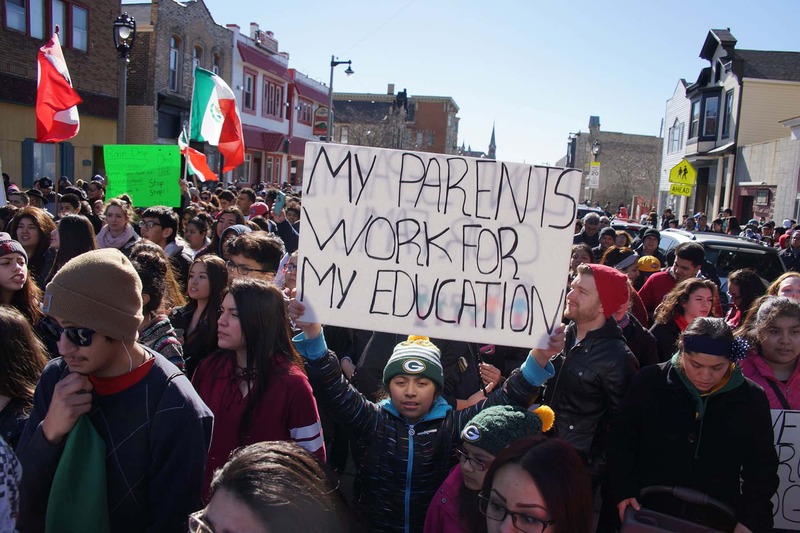 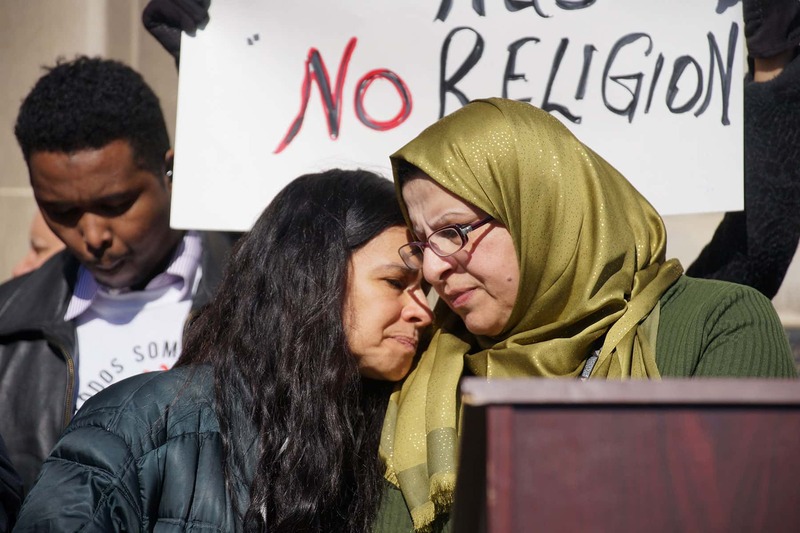 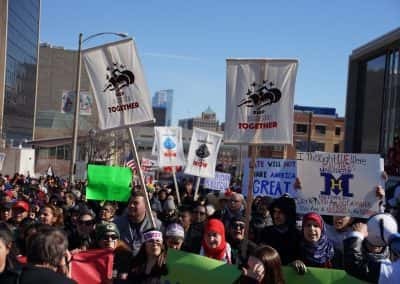 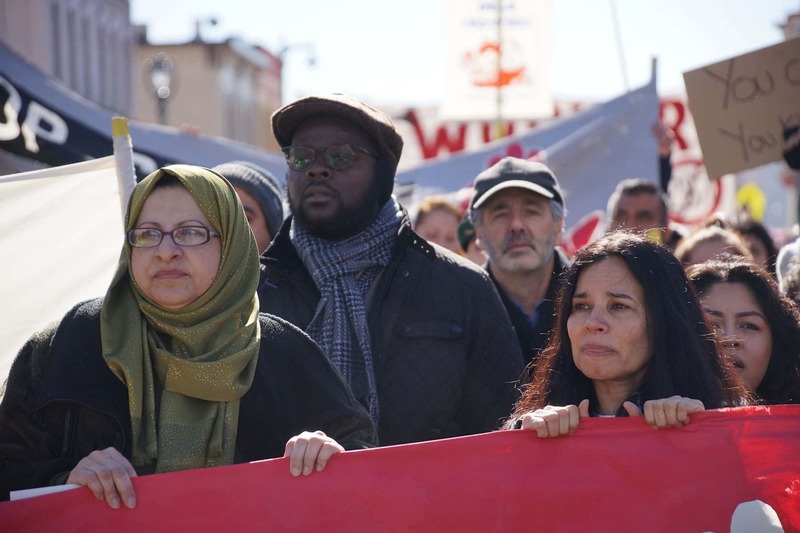 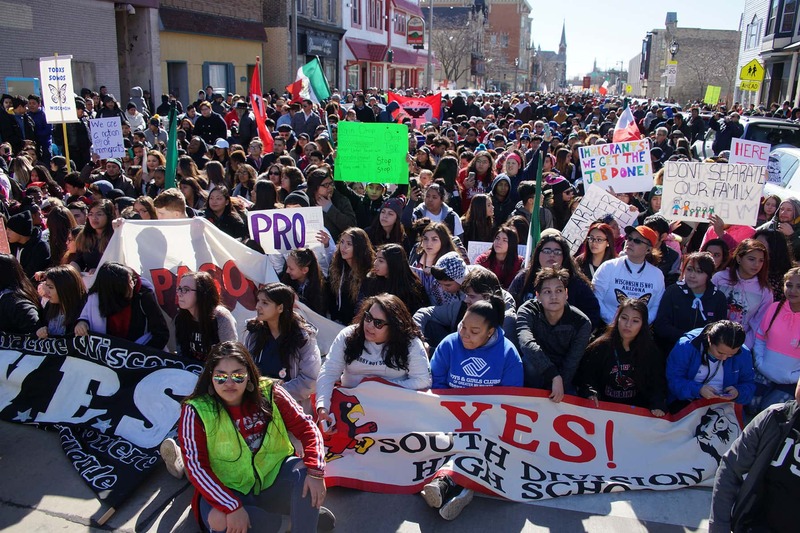 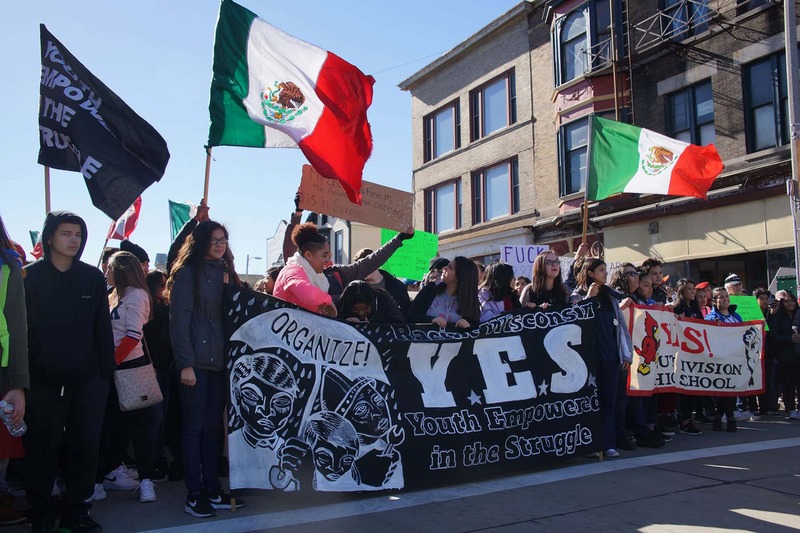 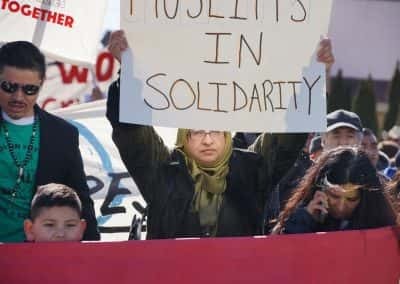 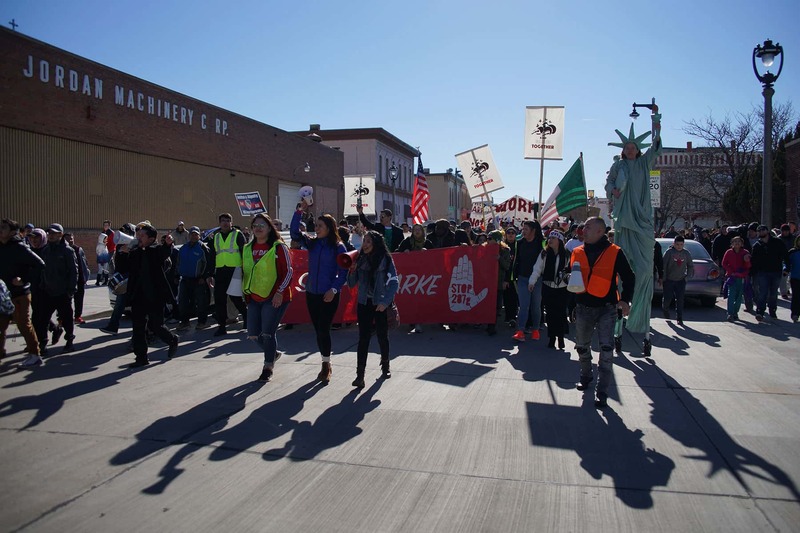 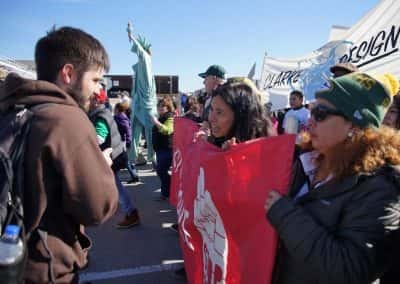 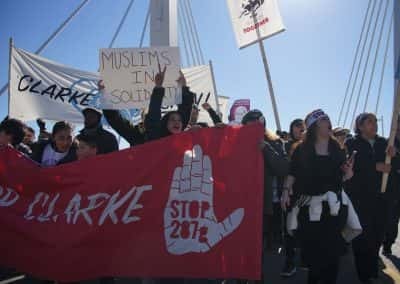 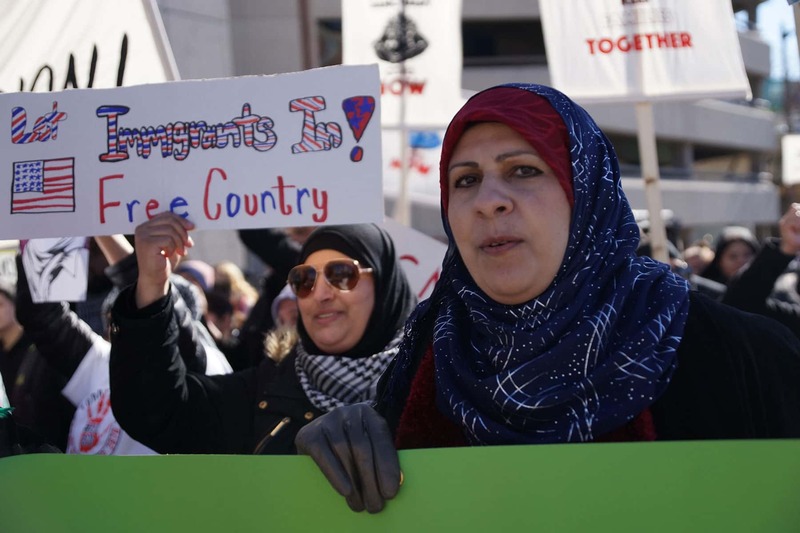 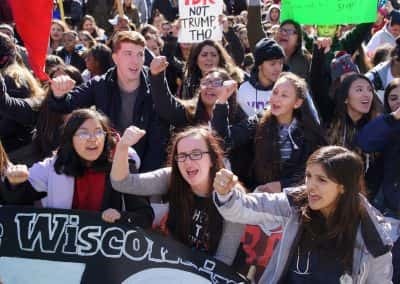 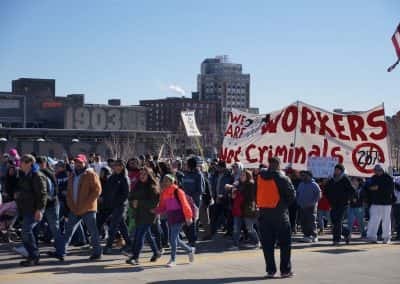 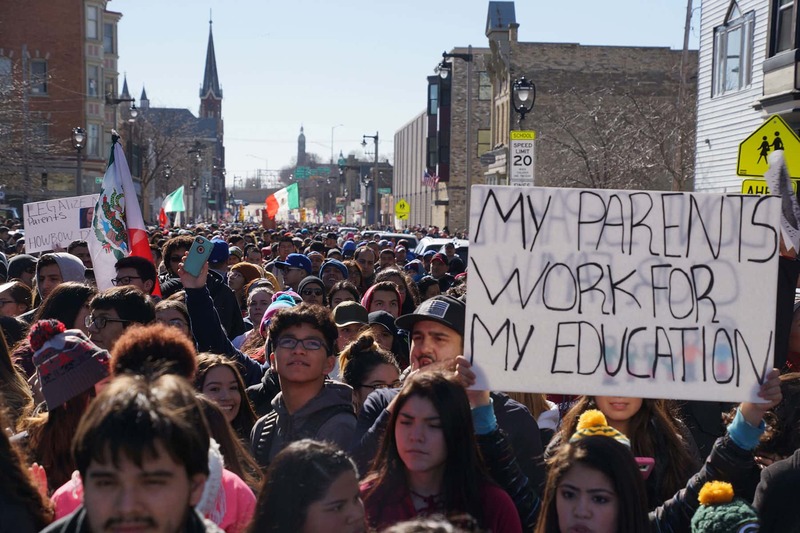 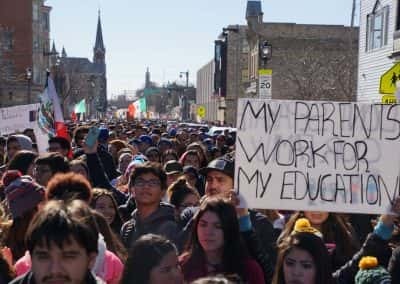 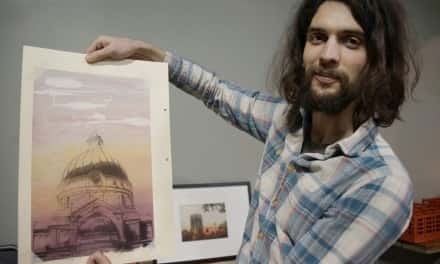 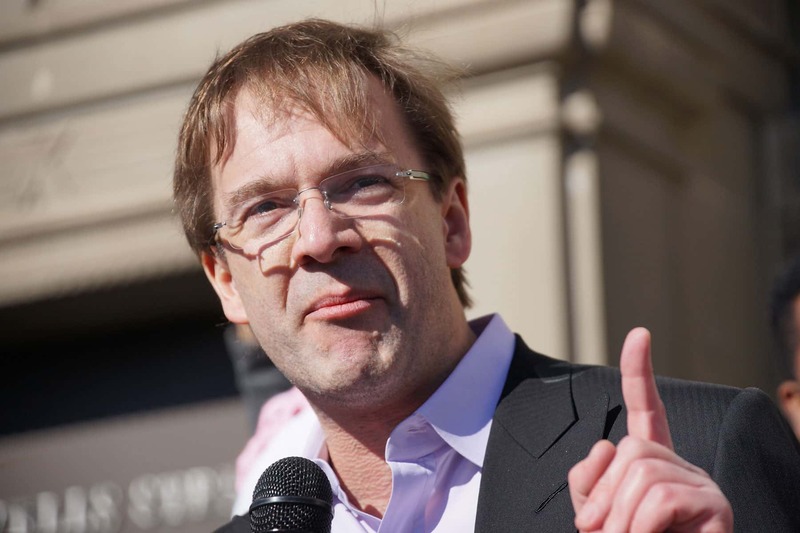 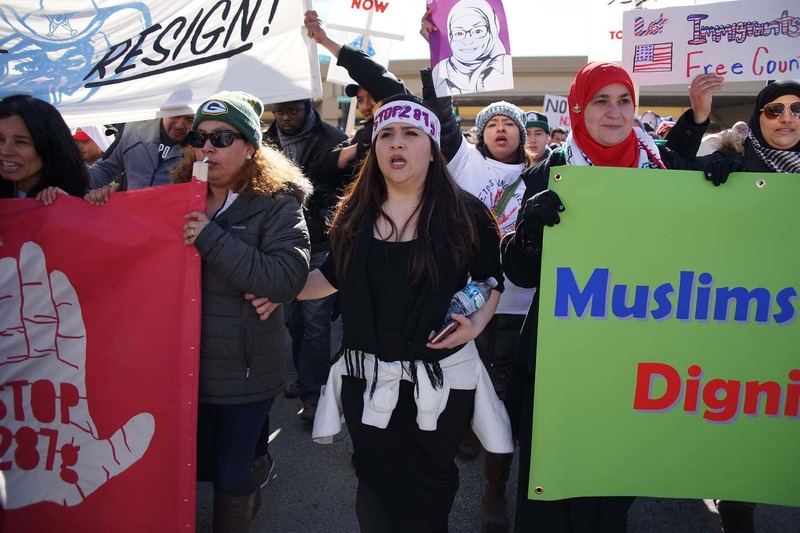 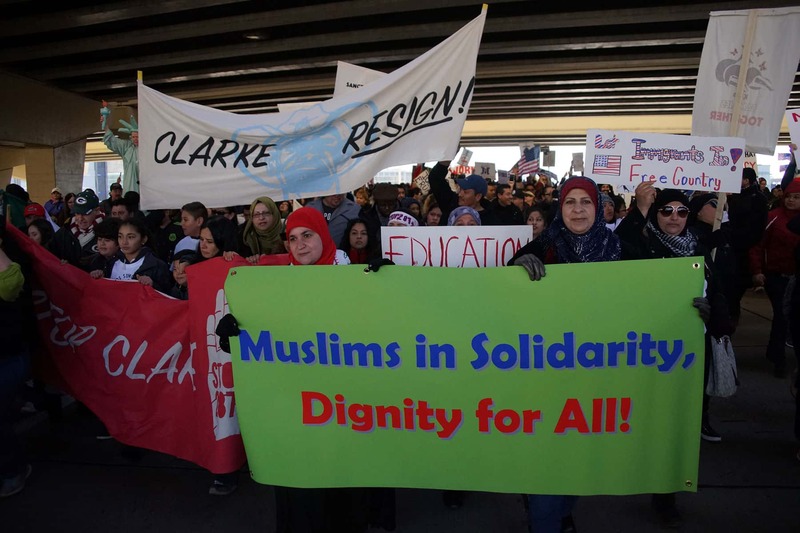 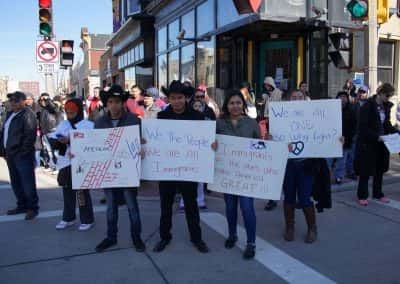 Thousands of community members and supporters throughout Wisconsin stayed away from work and school, closed their businesses, left their farms, and joined the march on February 13. 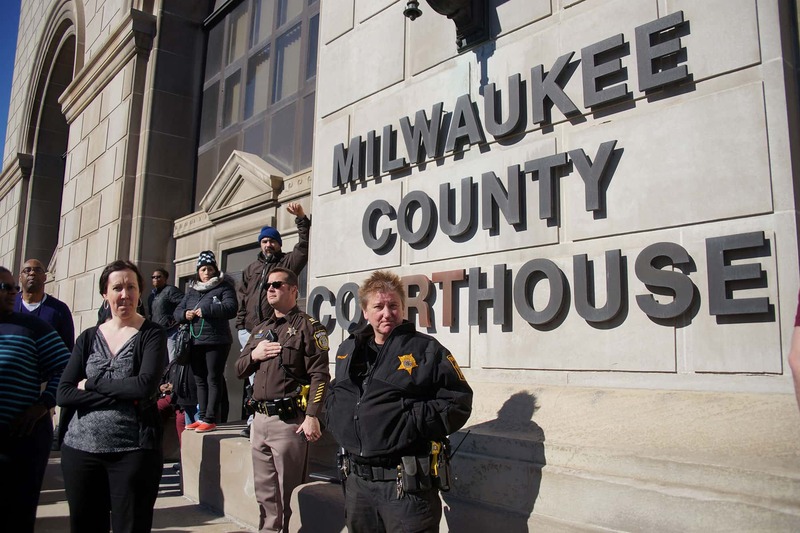 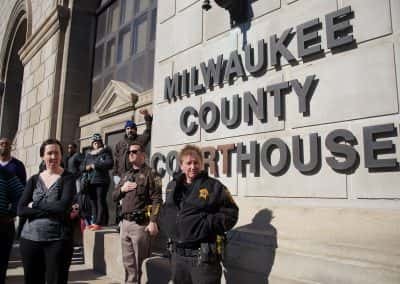 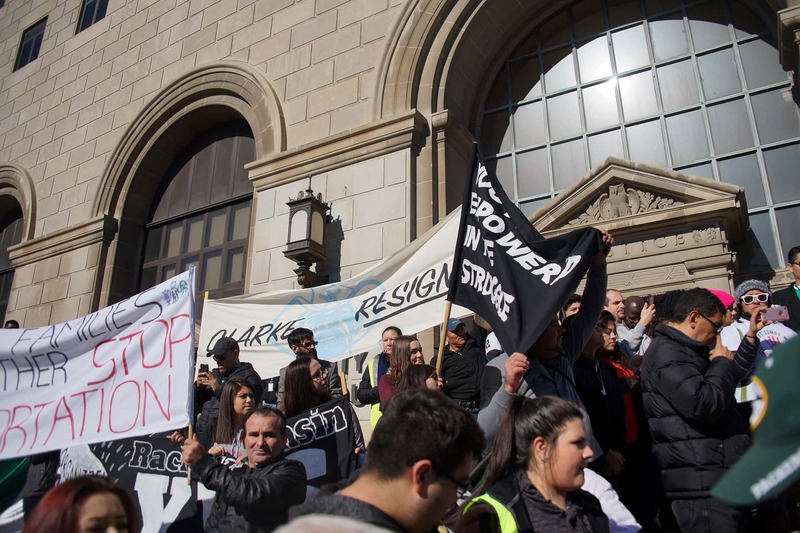 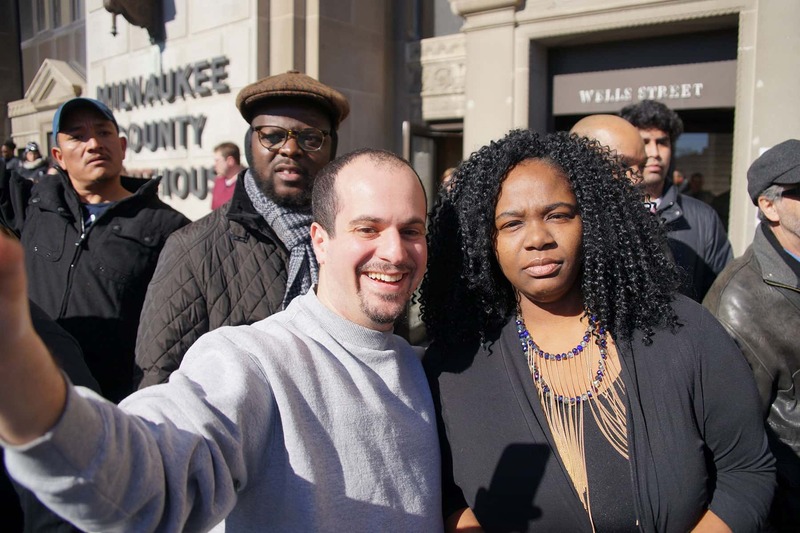 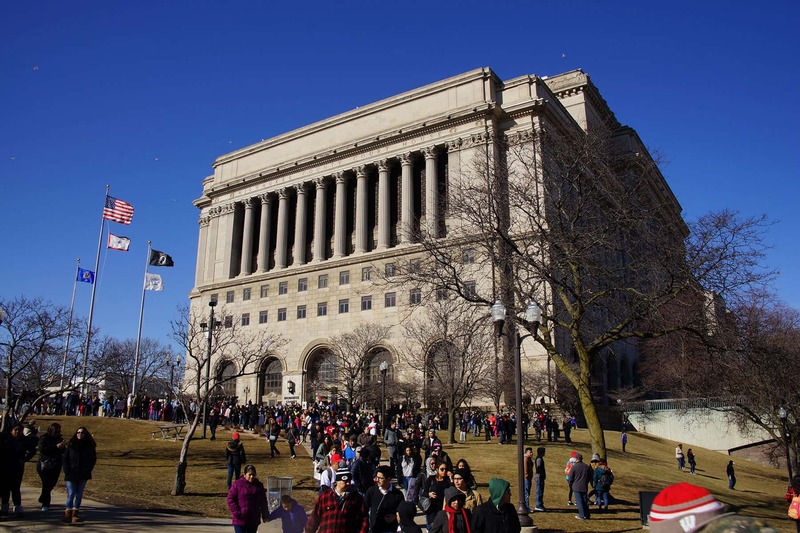 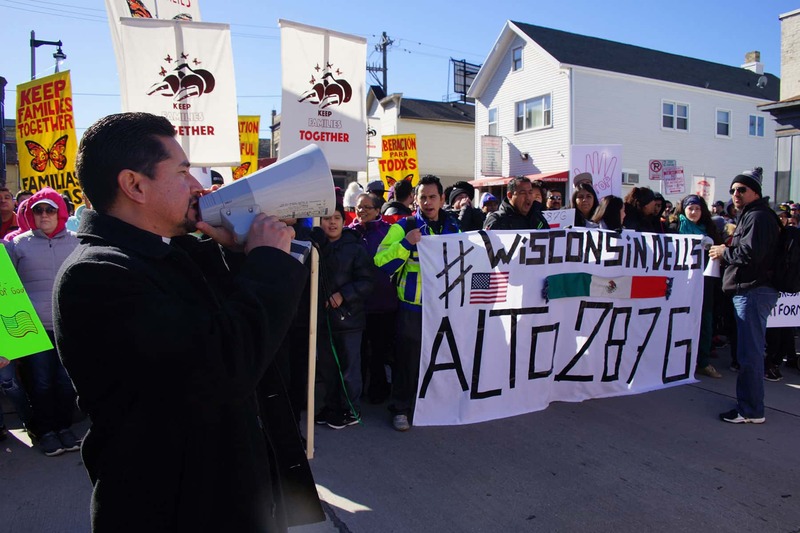 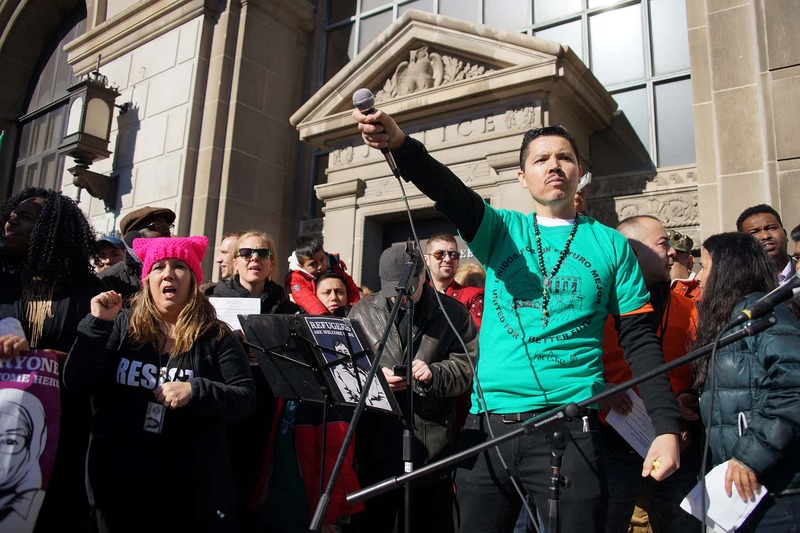 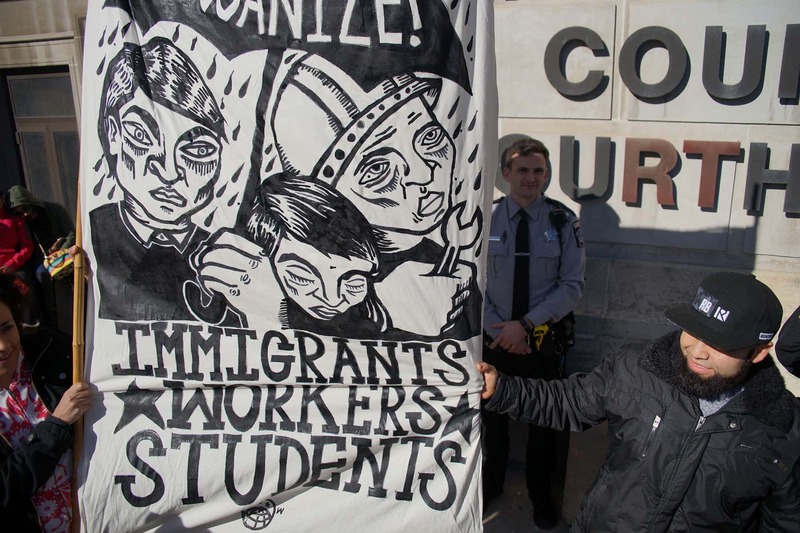 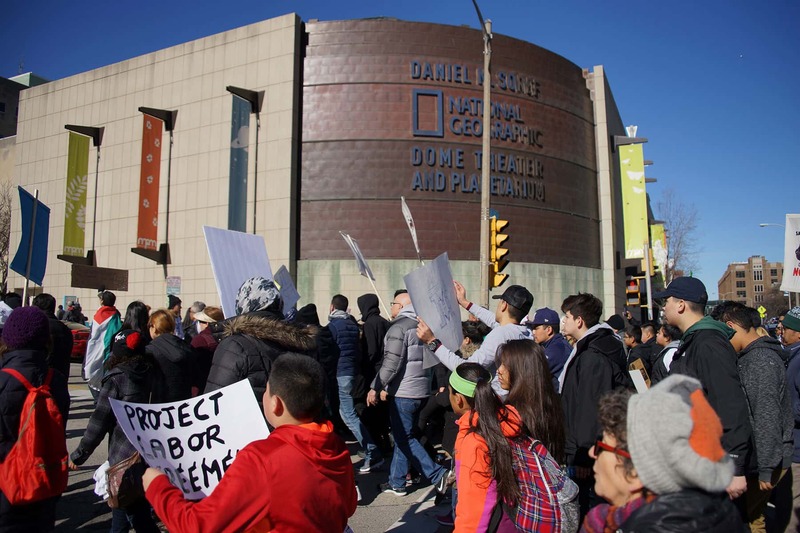 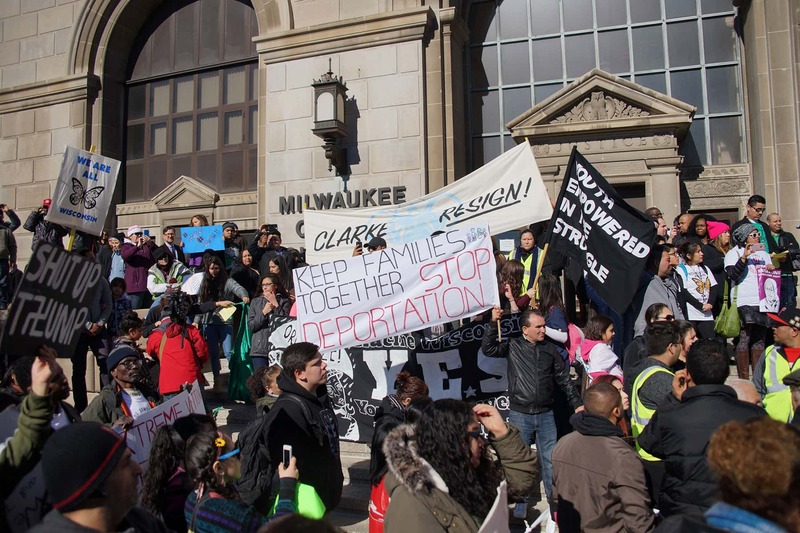 The demonstration started at Voces de la Frontera’s offices and ended at the Milwaukee County Courthouse. 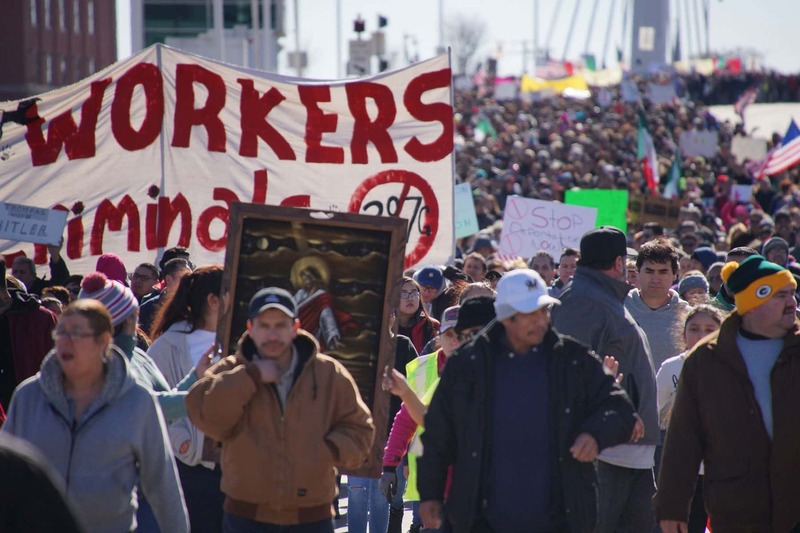 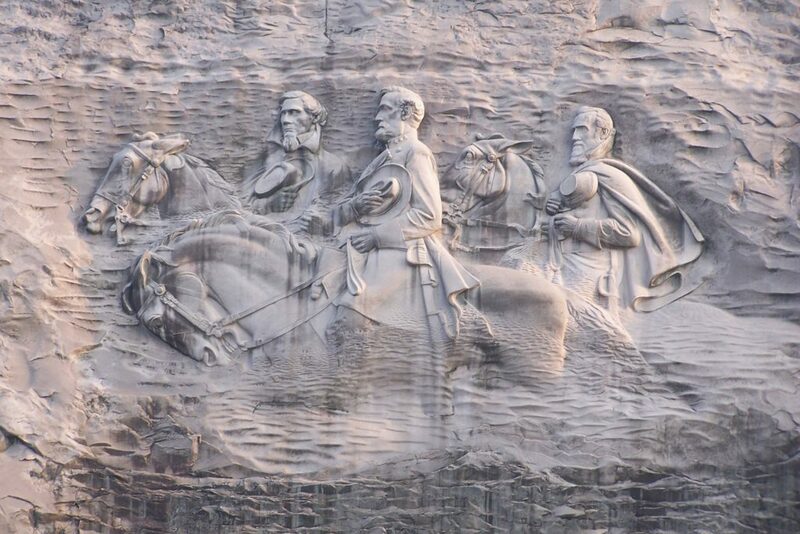 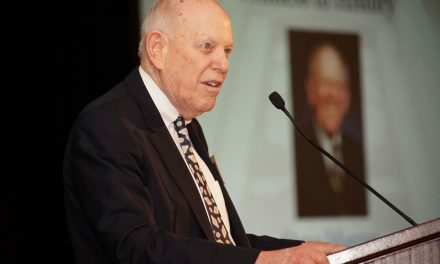 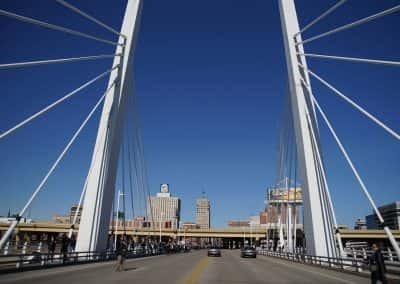 Dairy, hotels, restaurants, manufacturers, grocery stores, and other industries were affected by closures and labor stoppages. 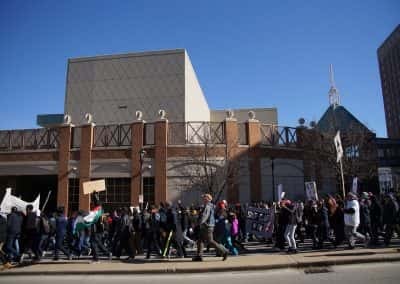 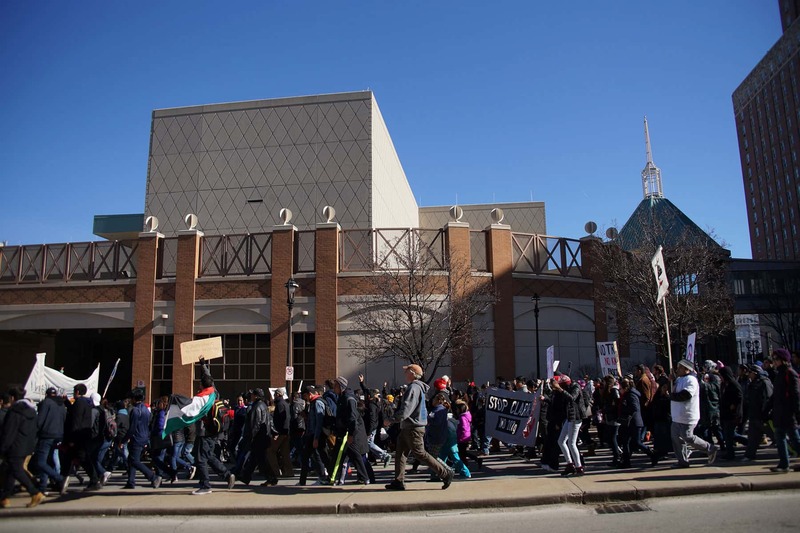 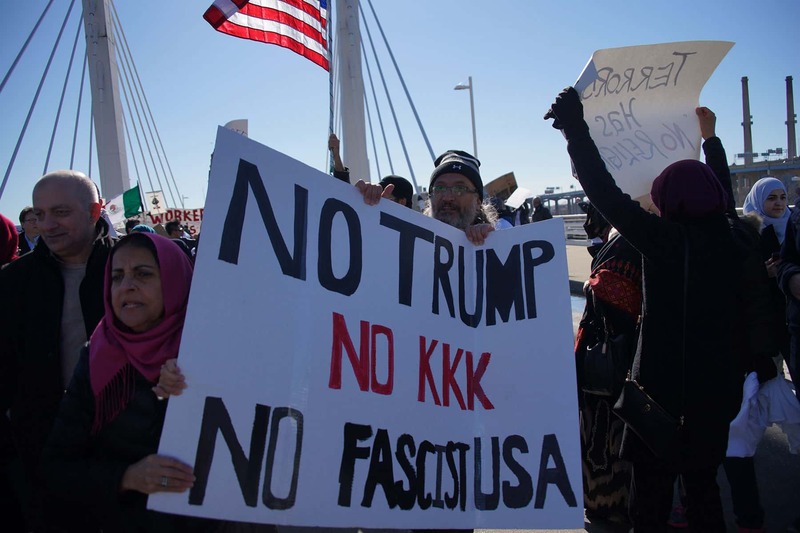 As a frame of reference for crowd size, the protestors were 158% the capacity of the BMO Harris Bradley Center (19,000) and 71% of Miller Park (42,200). 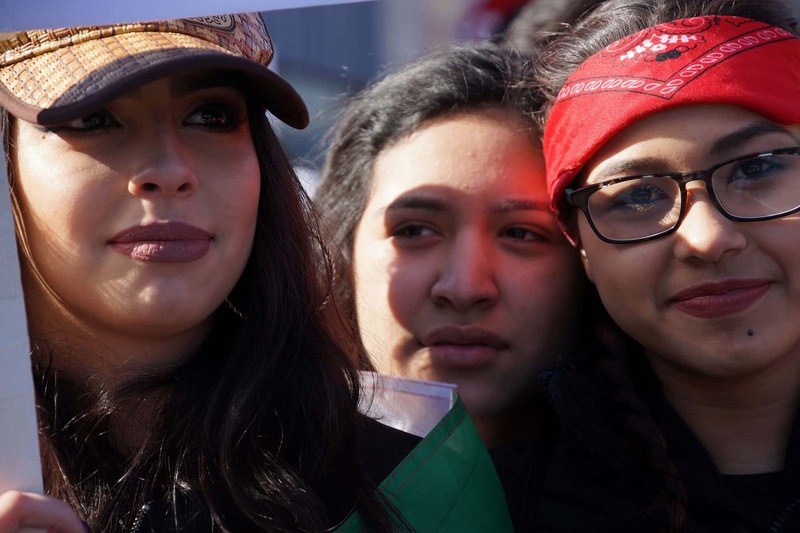 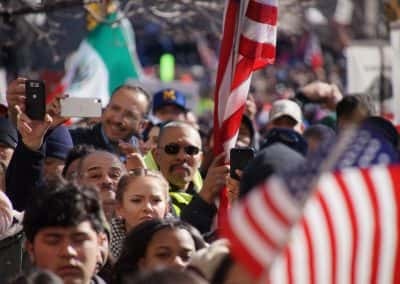 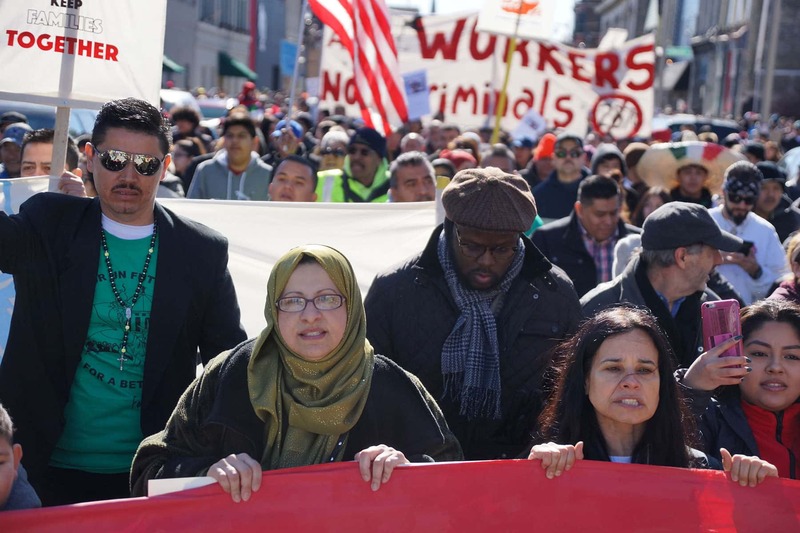 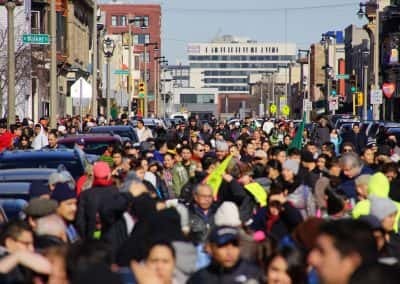 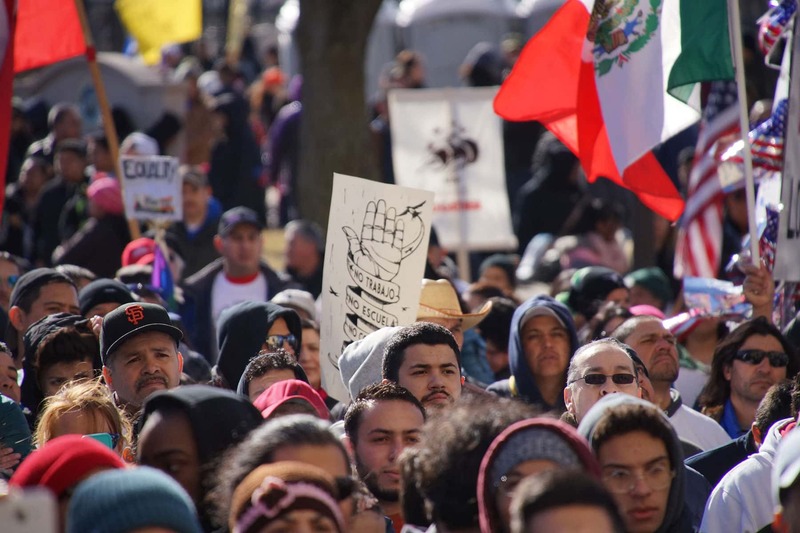 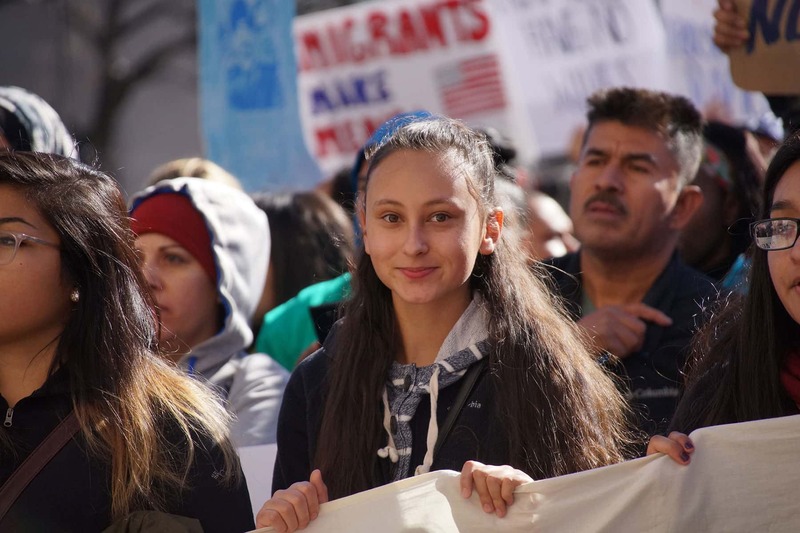 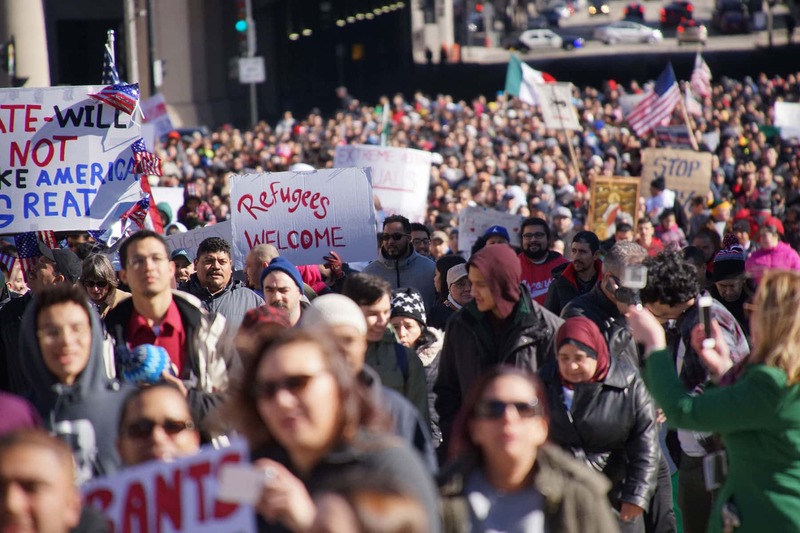 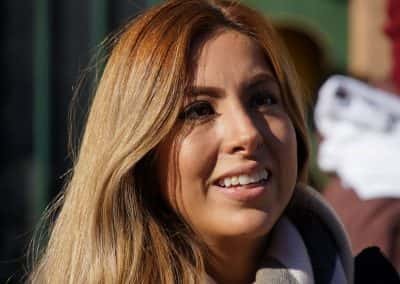 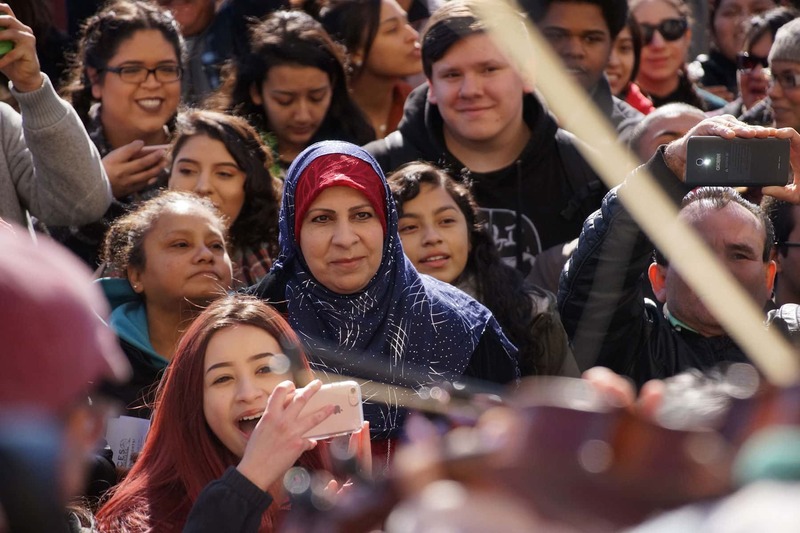 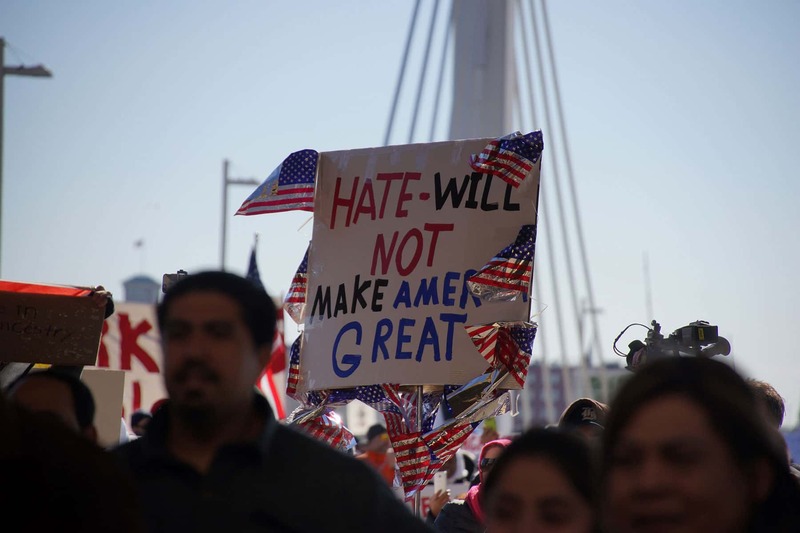 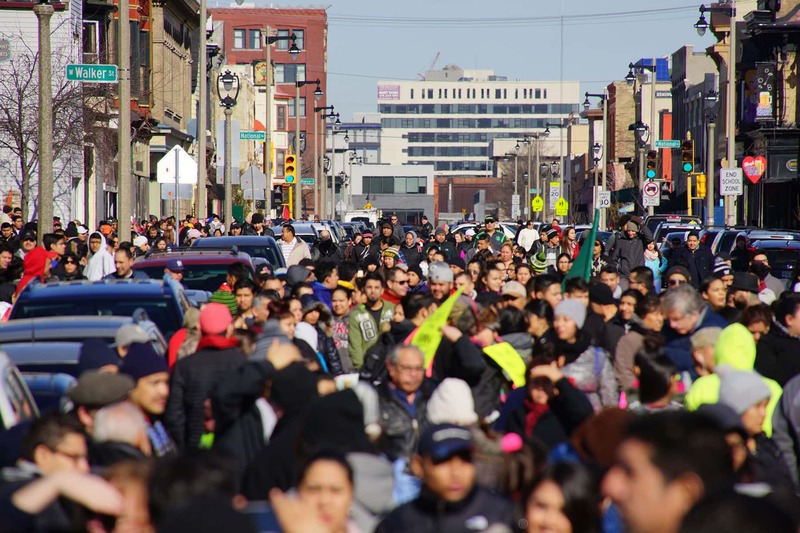 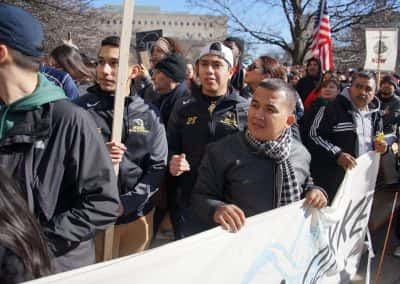 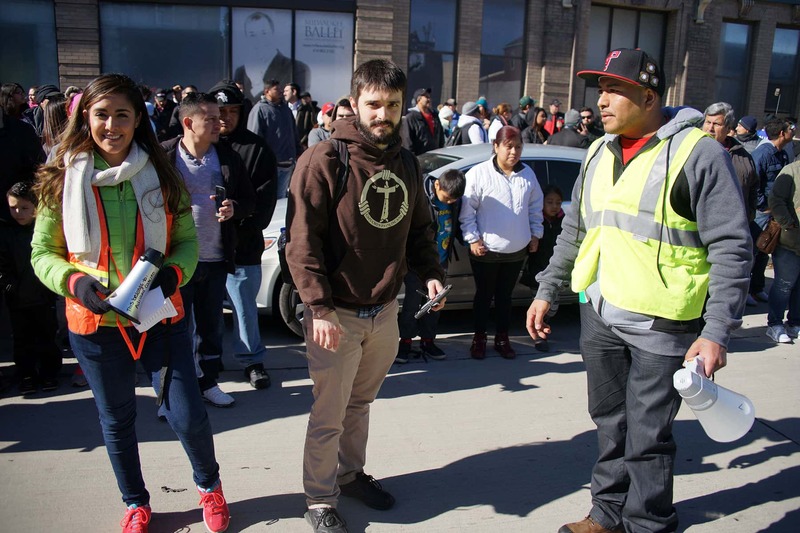 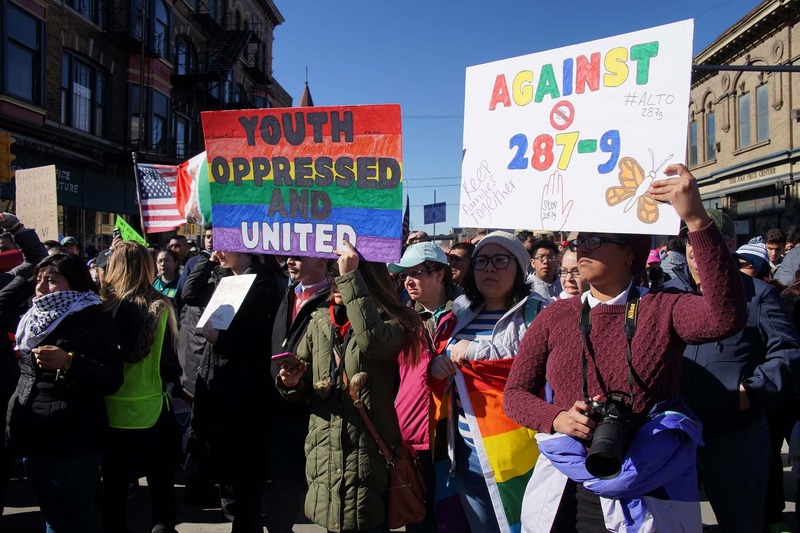 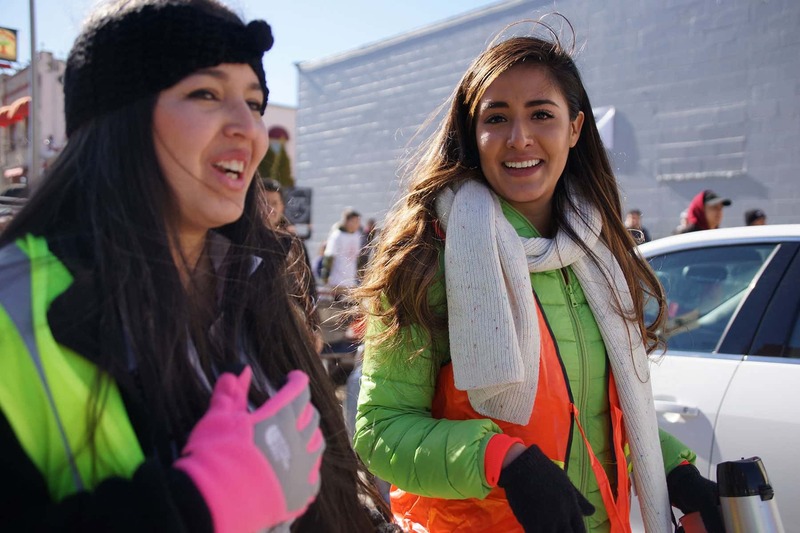 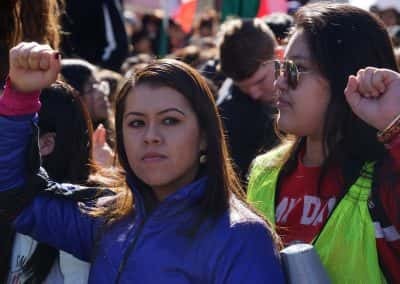 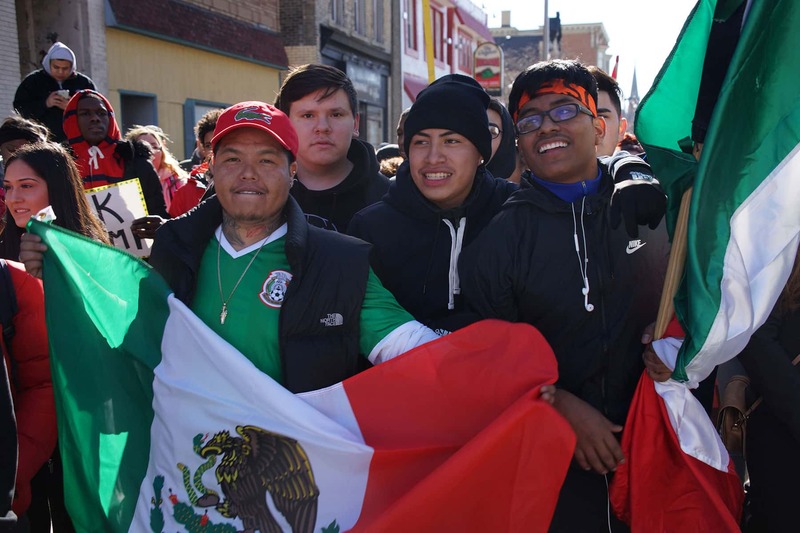 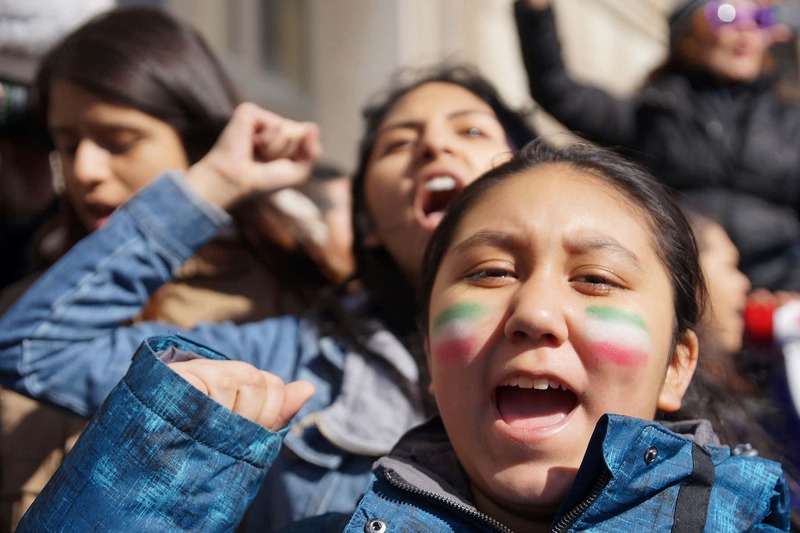 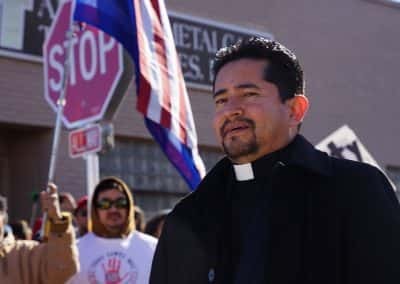 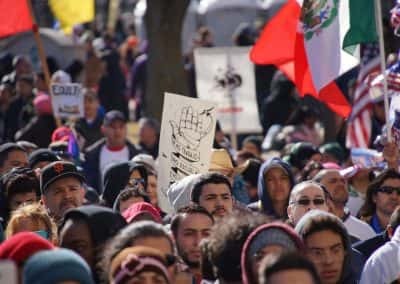 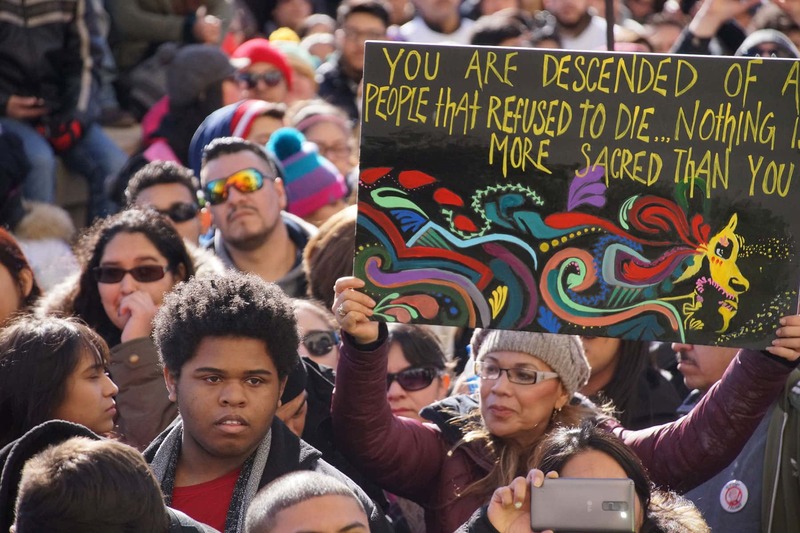 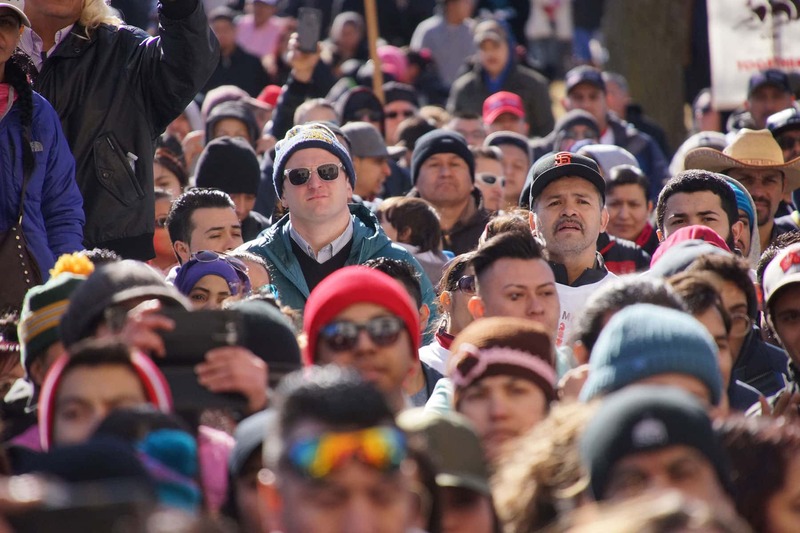 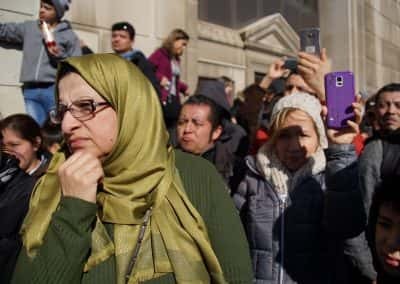 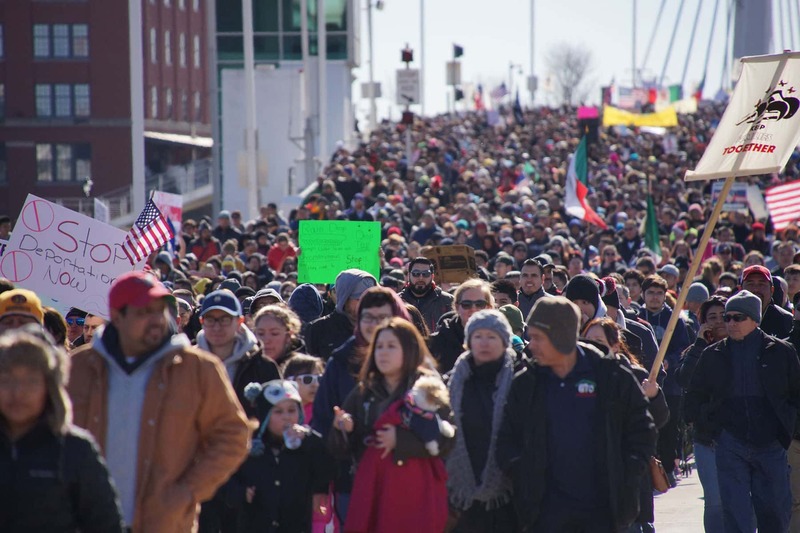 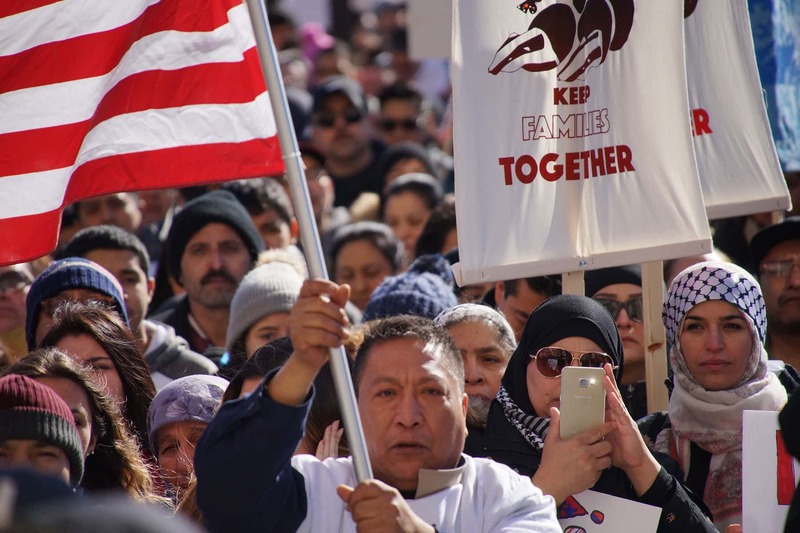 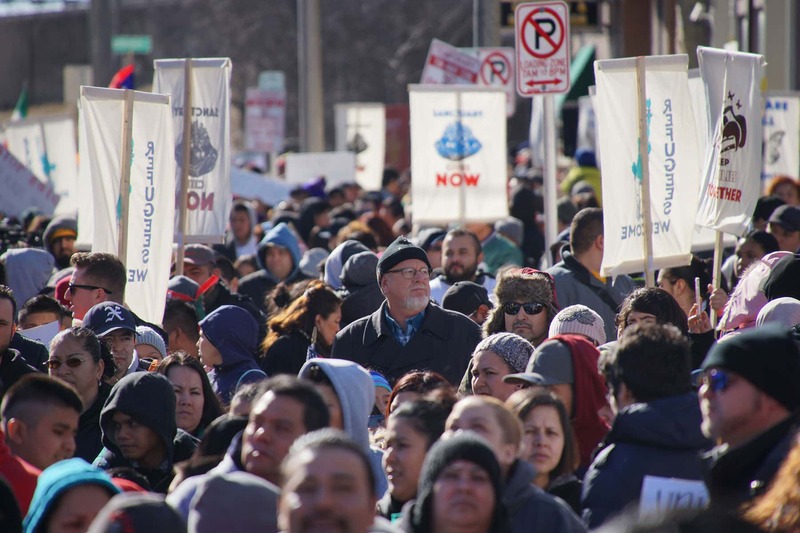 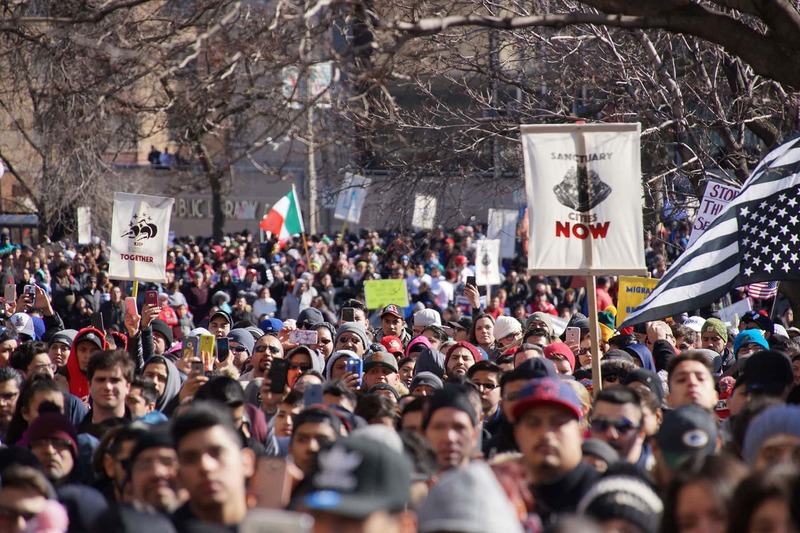 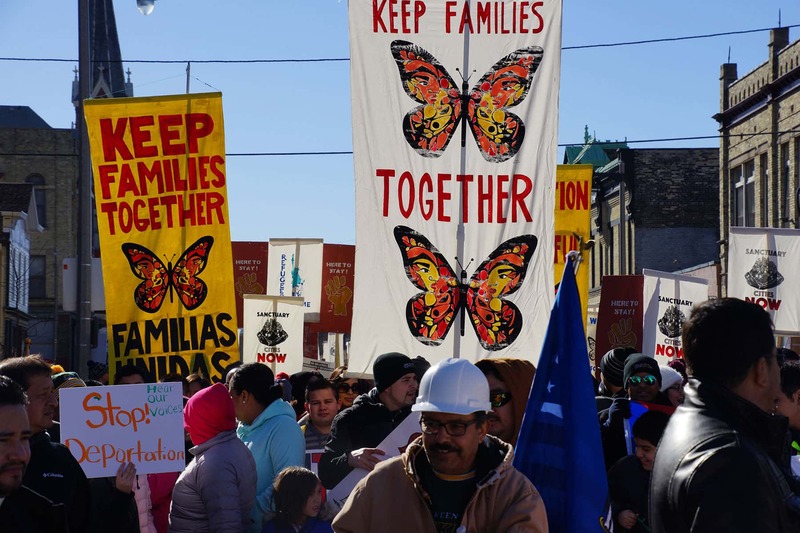 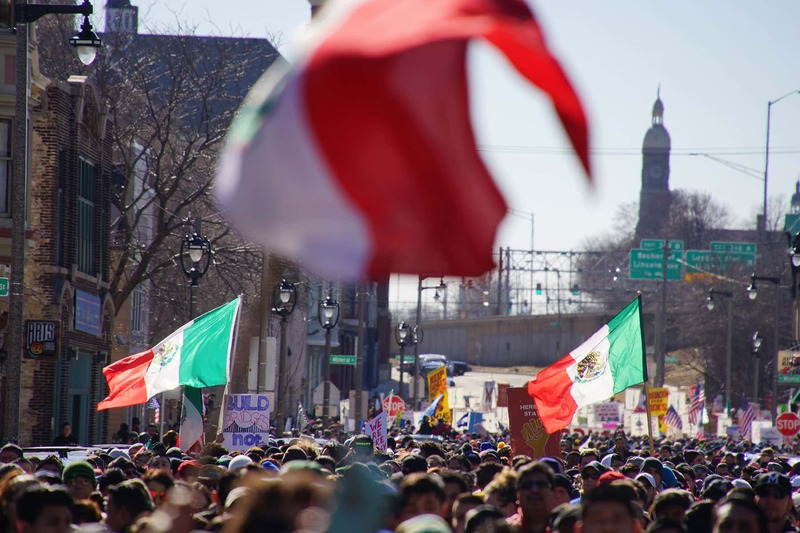 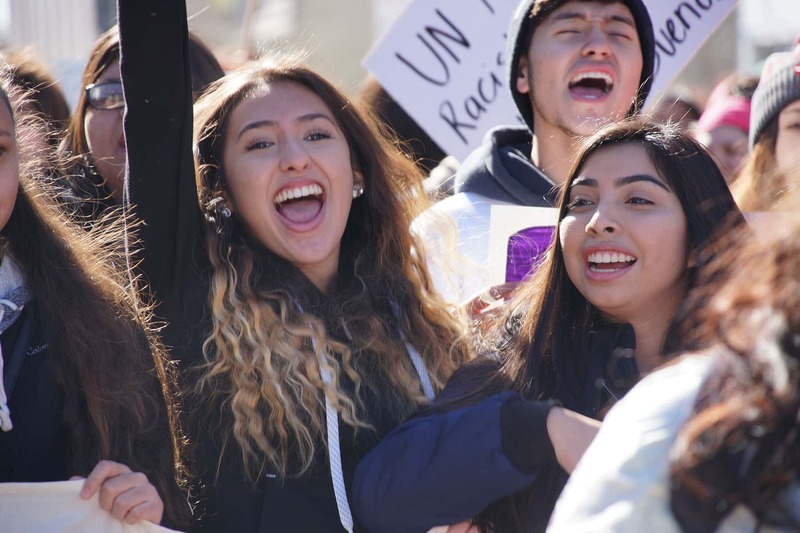 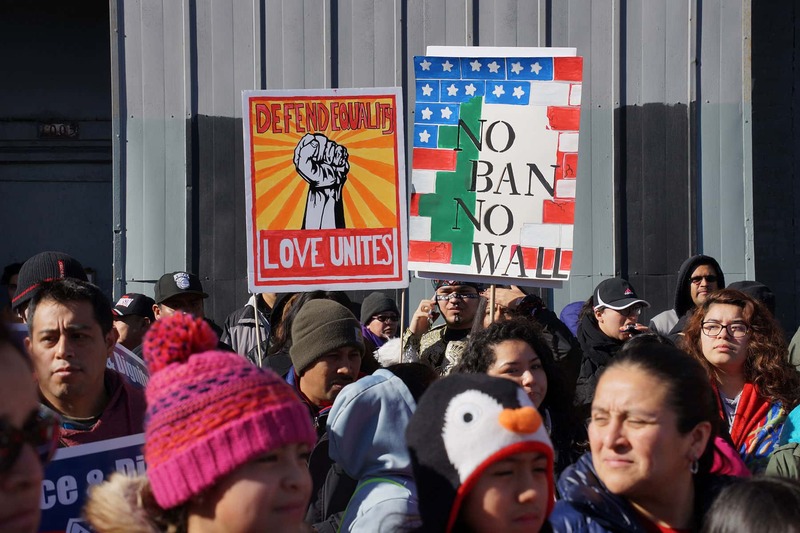 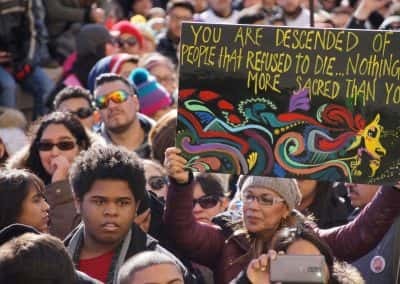 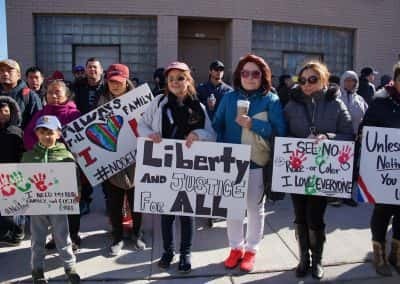 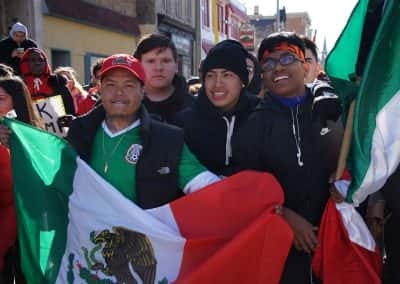 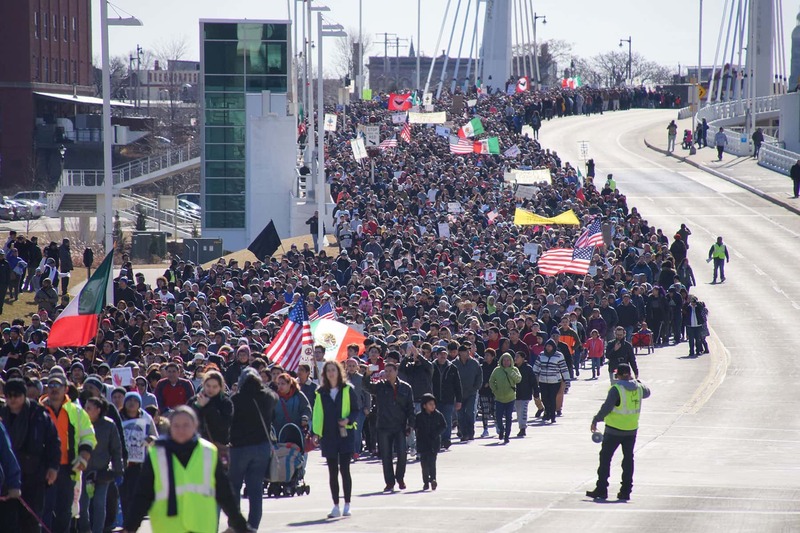 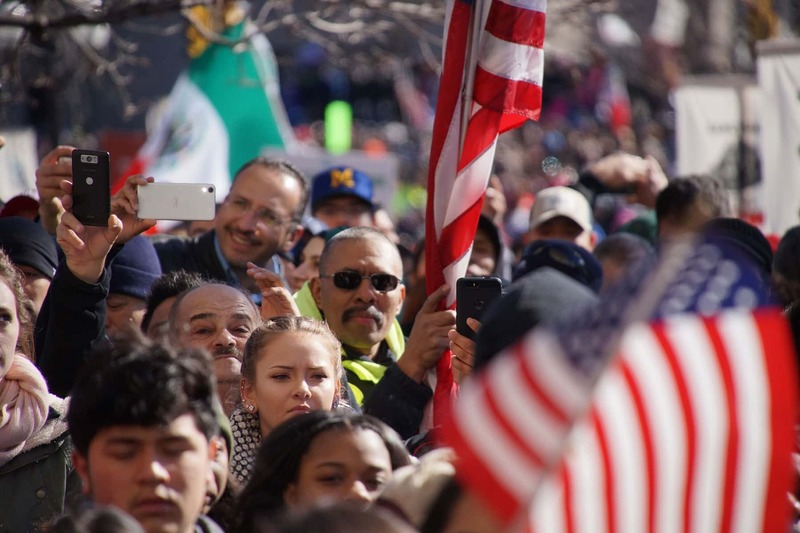 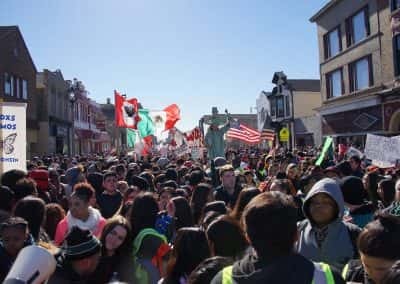 These images capture every step of the march and rally, documenting the massive population that came together to raise awareness that scapegoating Latinos, immigrants, and refugees through fear was not a solution to very real public problems.